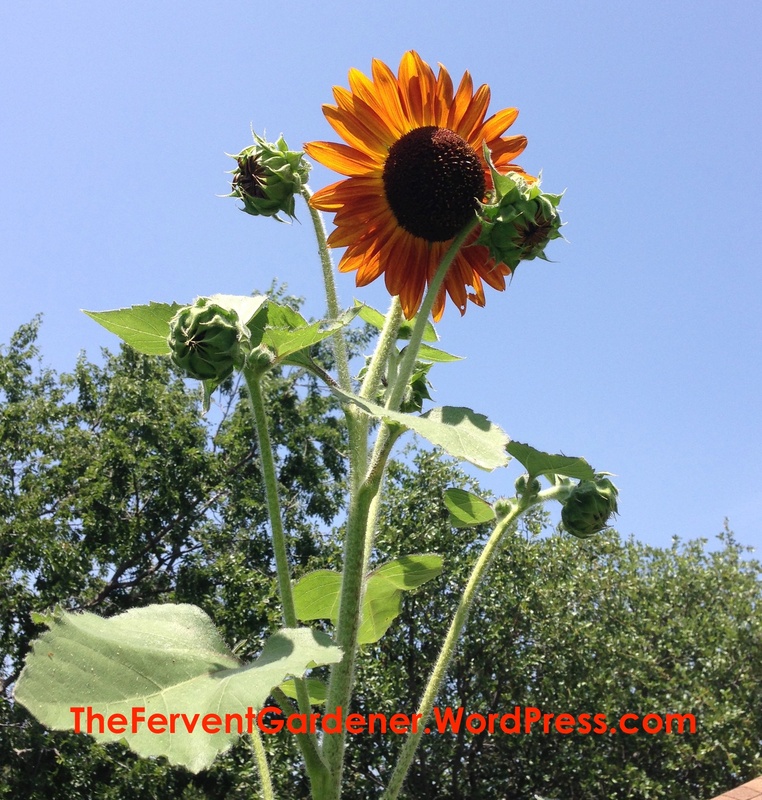 The Fervent Gardener | Exploring the joy of gardening as a hobby and source of happiness. 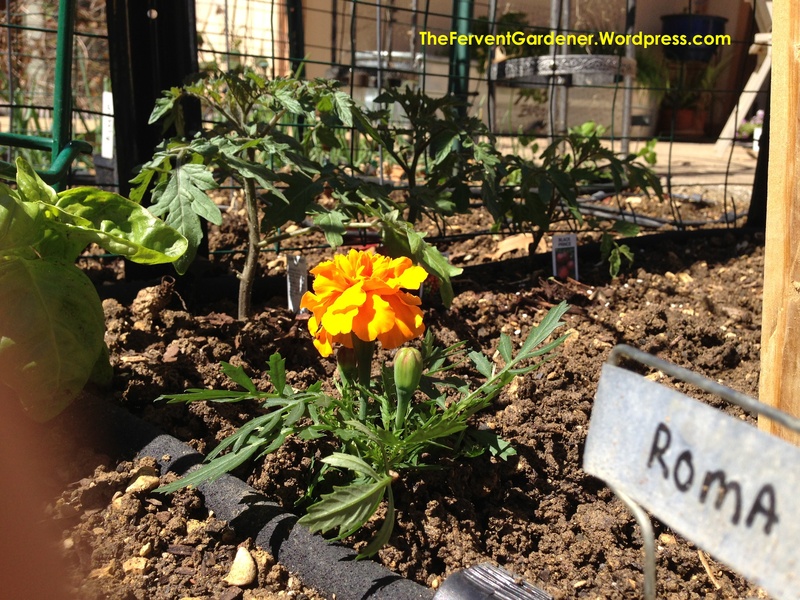 Exploring the joy of gardening as a hobby and source of happiness. Hi All! It’s been a while since I have done a post, I apologize. 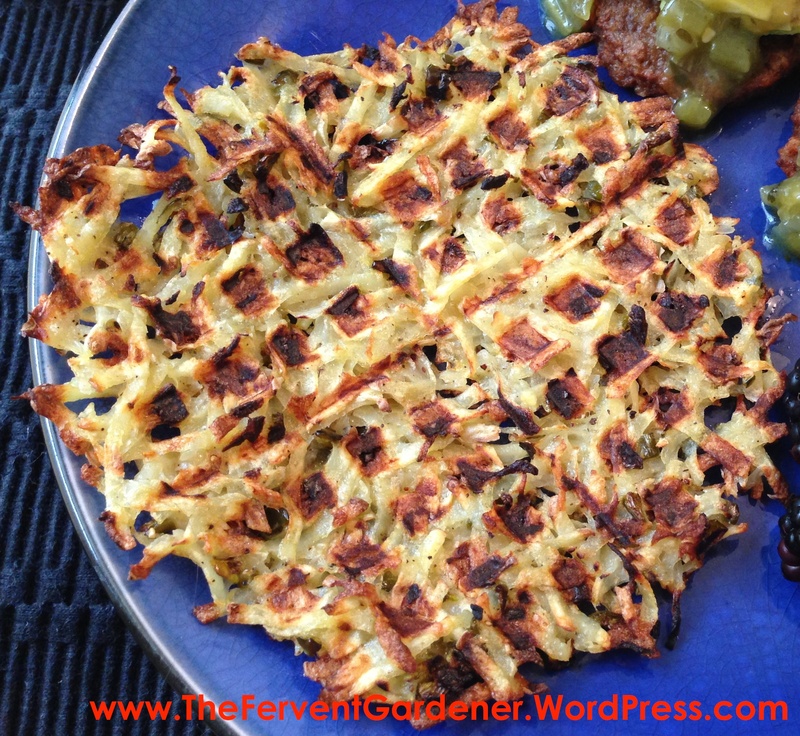 I am also sorry, but this is not a garden post…this is a recipe post. As some of you know, I have been a vegetarian for 23 years now, and with the holidays approaching, I have been asked by a number of folks what I serve for Thanksgiving and Christmas. Most have a family member who have adopted the veggie diet and they have no idea what to do, and when pondering the best way to share what I know, this blog made the most sense to me. I haven’t done a good job of taking pictures of my holiday meals in the past, so this post is a little lighter on pics than my normal, but I will try and remedy that this year. First, bravo if you have decided to become a vegetarian and stick to it through the holidays. And second, if you are a family member of a vegetarian who has found their way here in an effort to support and include that vegetarian as part of your holiday feast, I bow in gratitude to you. The holidays are a time for family and togetherness…and I can tell you that it can feel pretty rotten to have people claim your diet is too hard for them and throw in the towel without even trying. So..What does a vegetarian have for Thanksgiving? I like to start with a faux turkey product. Why? Well first, there are lots of faux meat options out there these days. Second, it helps make the meal still feel very traditional. My favorite is the Quorn Turk’y Roast. I serve a slightly different menu every year, but main part of the dinner stays the same: Quorn Turk’y roast, vegetarian stuffing, mashed potatoes, cranberry sauce, steamed broccoli and veggie gravy….lots of gravy. I am going to guess that you have your own favorite mashed potato recipe and that if you like steamed broccoli, you know that one too, so I am going to focus on the stuffing, the cranberry sauce, the gravy…and then a few of my optional sides. I LOVE stuffing. It is the thing I will sneak into the kitchen at midnight to eat a little more off. This one is super simple – so if it is missing some favorite ingredient, throw it in. But this will make most vegetarians pretty happy. I start with the classic bags of stuffing you buy at the store. Heat the oil in a heavy skillet and stir fry the celery and onion for about 5 minutes – until the onion is translucent. Remove from heat and allow to cool. In a large bowl, combine all the ingredients and stir until the broth and eggs are well distributed and all the dry stuffing has become a little moist. Spread into a 9×13 casserole dish. Bake in the oven for about 20 minutes – the top will brown a little around the edges. Don’t leave it in too long or it will dry out. I enjoy making my own cranberry sauce. It is actually super easy. The simplest is to take one of those bags of cranberries you get in the produce section, wash and pick over them, pour them into a heavy sauce pan, add a little sugar and some water and a squeeze of lemon, stir that all up and turn the heat up to medium. Once the whole thing is bubbling a bit, turn it down to a simmer and stir occasionally until most of the cranberries have burst and the whole thing is thick and yummy. But if you want to up your game and wow your guests, you want to make this Cabernet Cranberry and Blueberry Sauce. It is AMAZING. And you can make it with the red wine of your choice. I completely wimp out on the gravy. I buy my gravy in little powder packets and whisk it to live right before dinner. I know, I know…I could make it myself, but with so much to cook, I have to cut corners somewhere. The brand I have always used has been discontinued, so I am trying this kind this year – seems to be about the same thing. But I also found this at my Sprouts and have it as standby if needed. I will report back on the new gravy packet. Here are a couple of ideas for other sides you might like that are not your standard fare. These are a great way to bring pumpkin from the dessert table to the dinner table. They are made fresh from an actual pie pumpkin, so plan in the time it takes to peel and slice one of the those suckers – they are hard, so be careful. I use my mandolin to make the thin slices easier and prettier. Basically, you peel the pumpkin, slice it thin, soak it for a bit in water, then dry off your slices, toss with olive oil and spices and bake. Then you have the option to toss with fresh parsley and Parmesan cheese. Marshmallows are NOT vegetarian, so if you are looking for a fresh new way to bring sweet potatoes to the table that will please the veggies in the group, try these. Here is a fun new side you may not have thought of – Acorn Squash. This recipe is very flavorful and holiday appropriate with it’s cranberries and walnuts. One is too much as a side, but your guests can cut off a bit for themselves or just scoop it out. Don’t run away! Trust me on this one. It is a little bit of work, but it is surprisingly tasty. Don’t mix the apples and the beets – set one on top of the other. The red of the beets will immediately stain the applies and it won’t be as pretty. That is all I have for now. I hope this helps those of you trying to include a vegetarian as part of your feast this year. 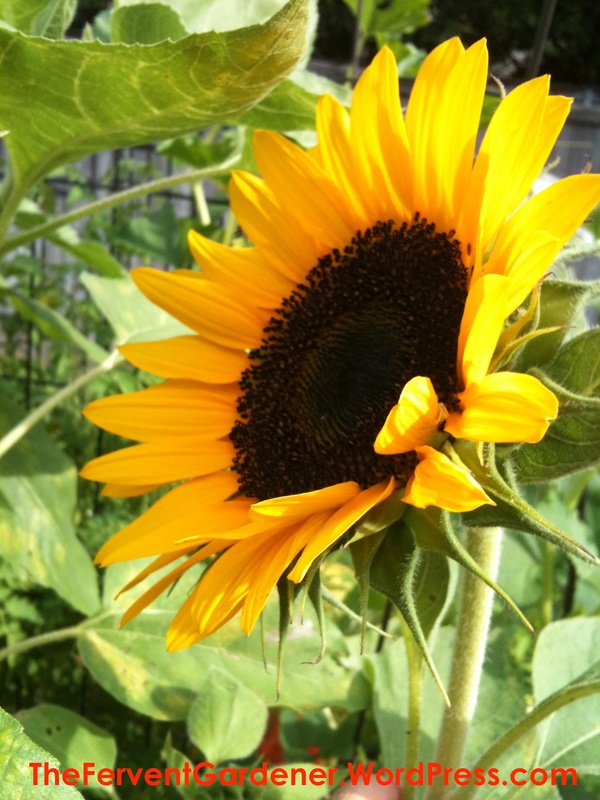 Let’s talk about sunflowers. Beautiful, vibrant sunflowers. While they are not a plant the average vegetable grower considers putting in their garden, standing tall between the tomatoes and the melons, I’m going to take a few moments here to suggest they should be. Seriously, you need to be planting these lovelies. 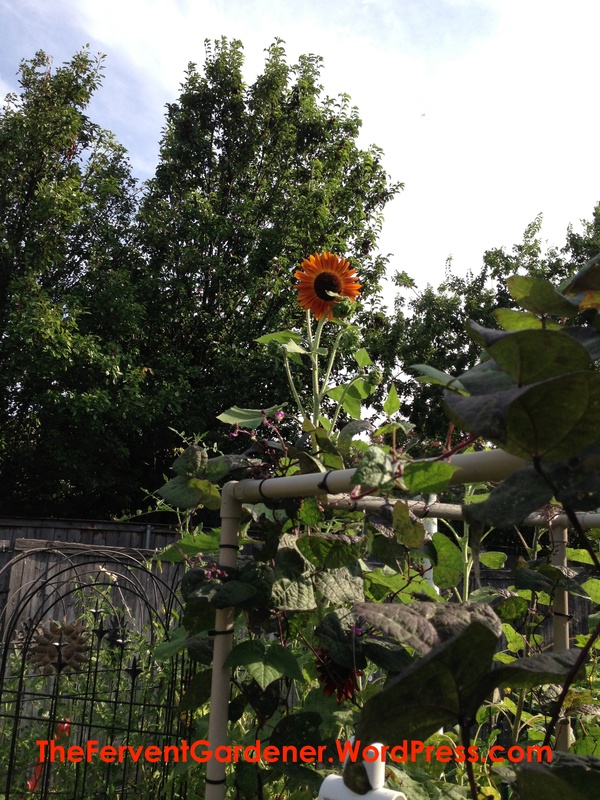 Even in my tiny garden, I usually carve out a small space to grow a few sunflowers. And after all is said and done…you can harvest and eat the seeds! 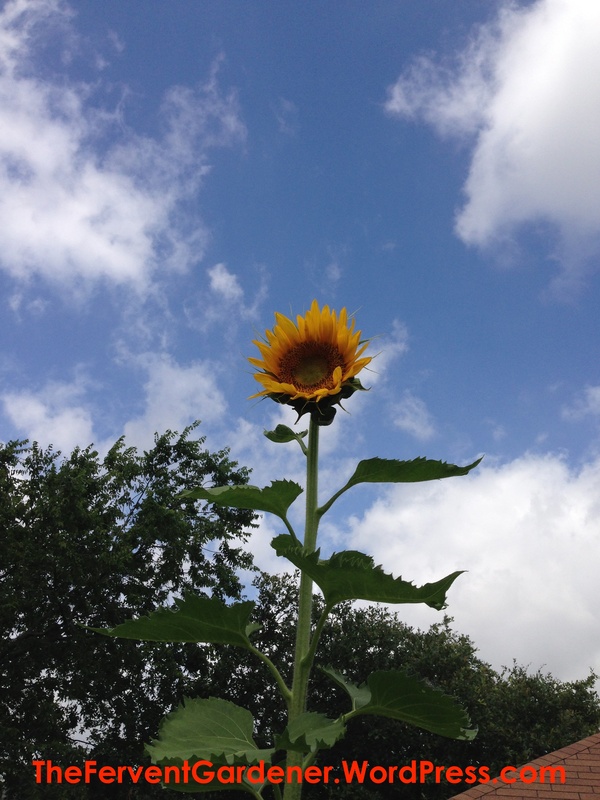 Since sunflowers grow straight up, they don’t require much of a foot print and you don’t have to plant an army of them to gain their benefits. I usually only give them a two foot square of ground in which to grow. But even with that small space, once planted, they will soon be towering over my garden, beckoning the bees and butterflies. They couldn’t be easier to plant. Super forgiving of the soil and environment, you pretty much just plant the seeds, cover with dirt, and water. And…boom! Sunflowers! If you do decide to plant these beauties, you will need to make a few decisions. 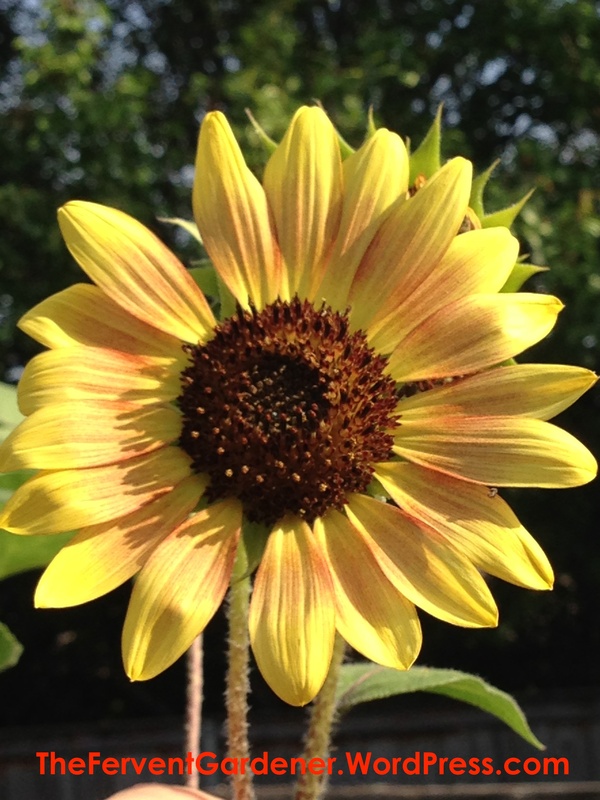 Sunflower varieties come in different heights, colors, and seed size. So be sure to read all the info about the seeds you are considering to make sure they will accomplish your goals. I have come to prefer the tall varieties with big seeds like Mammoth and Pike’s Peak (the variety pictured at the top of this post), but a shorter variety with smaller seeds might suit your needs better. That bit is totally up to you. But don’t be afraid to stray from the standard yellow – feel free to throw in a few other color varieties as well, like the orange one pictured below. 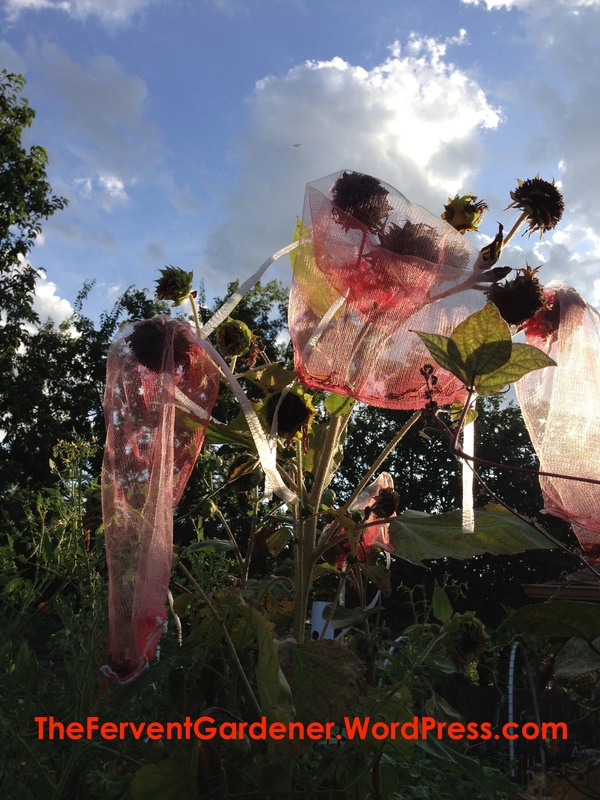 If you are just growing them for their pollination benefits and beauty, then you can pull the plants out when the flowers have all drooped and begun to dry. But if, like me, you want to harvest their tasty and nutritious seeds, then you will need to leave them alone and let time do its work. After the flowers have grown big and bright and happy in the sunshine, and had visits from many pollinators, they will begin to droop over at the top. As this process continues, the petals will fall off and the flowers will look dead…but don’t be fooled. It is during this time that the seeds begin to grow big and tasty. Unfortunately, the birds think they are tasty, too. So I usually take precautions to make sure I get to enjoy the seeds instead of the neighborhood birds. 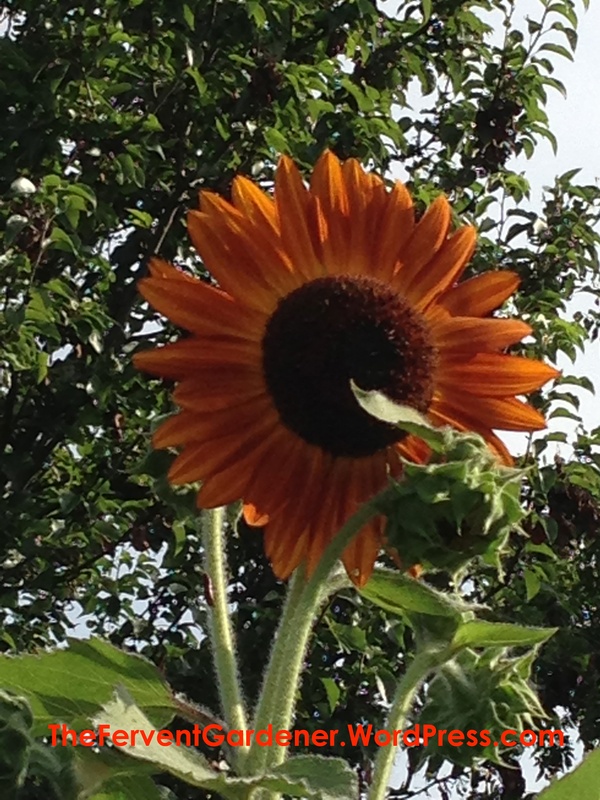 I simply slip one of these over each flower head…and wait. 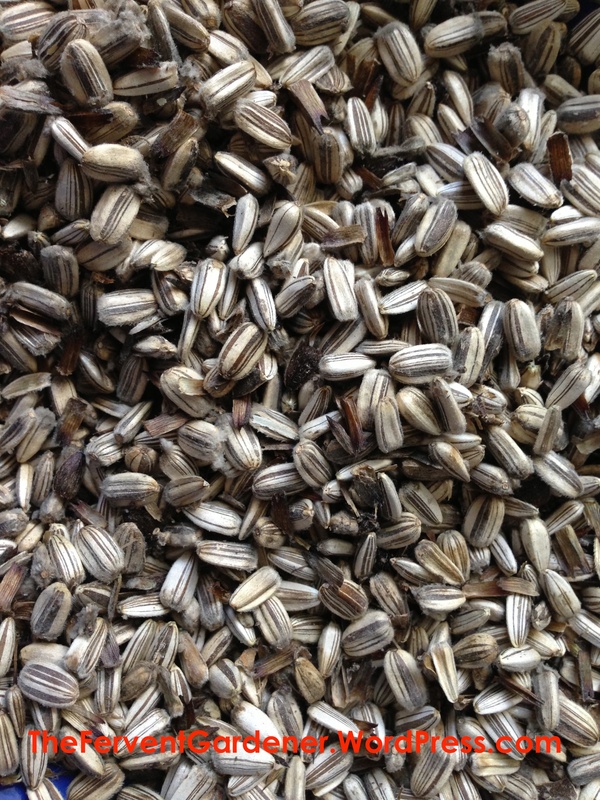 Pretty much any breathable covering that keeps the bird from getting to the seeds will do, but if you are looking for the same ones I use, I buy them in bulk from HarrisSeeds.com. I know they don’t look pretty like this, but just think of the yumminess to come. 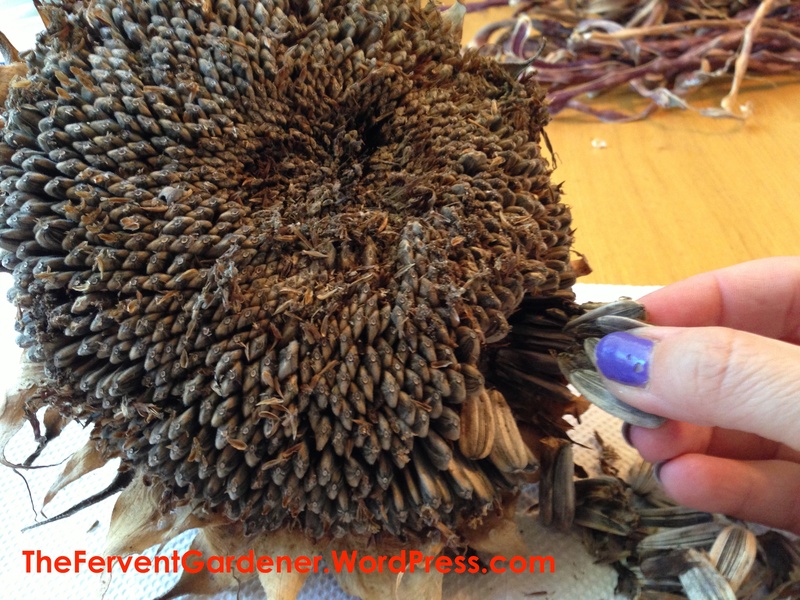 Once the flower heads have grown their seeds, you can snip each one off its stalk. At this point, you can pull the stalks up out of the garden and send them off to your compost pile if you’d like. The flower heads should go inside to a cool dry spot to dry out for about a week or so. Once the heads are all dried out, it’s time to harvest those seeds. The seeds are underneath all the fuzzy stuff on the surface of the flower’s face, so step number one is to rub all that off. You can wear gloves for this if you would like. 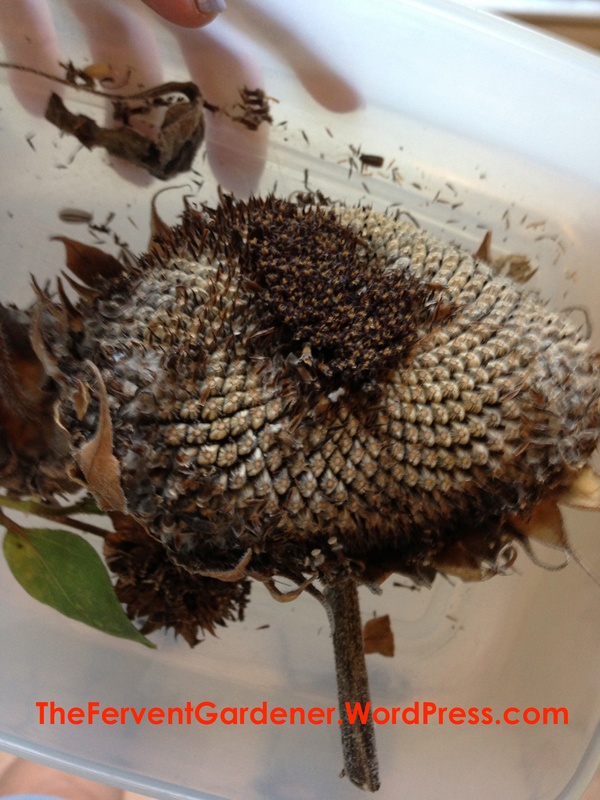 Once you brush all that debris off, you will see the seeds packed tightly in the center of the flower face. 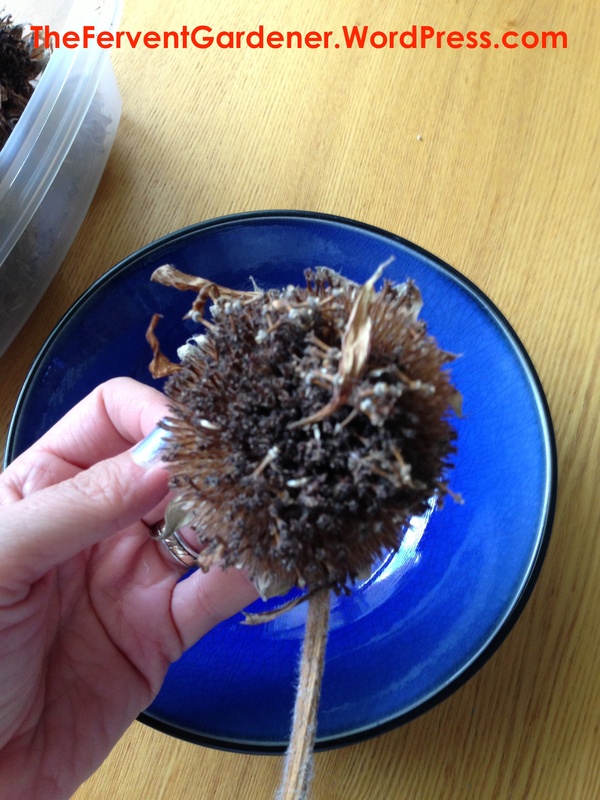 That’s a lot of seeds in just one sunflower!! 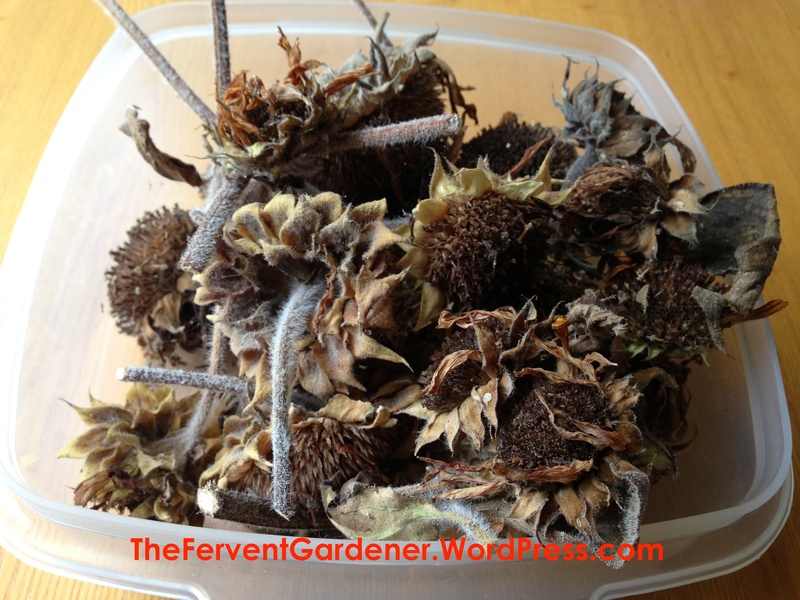 Gently loosen the seeds and remove them from the dried flower head – some varieties are packed tight and can take a little work. Well now be a tasty snack for you to enjoy all winter. I mentioned earlier about different varieties having different seed size. 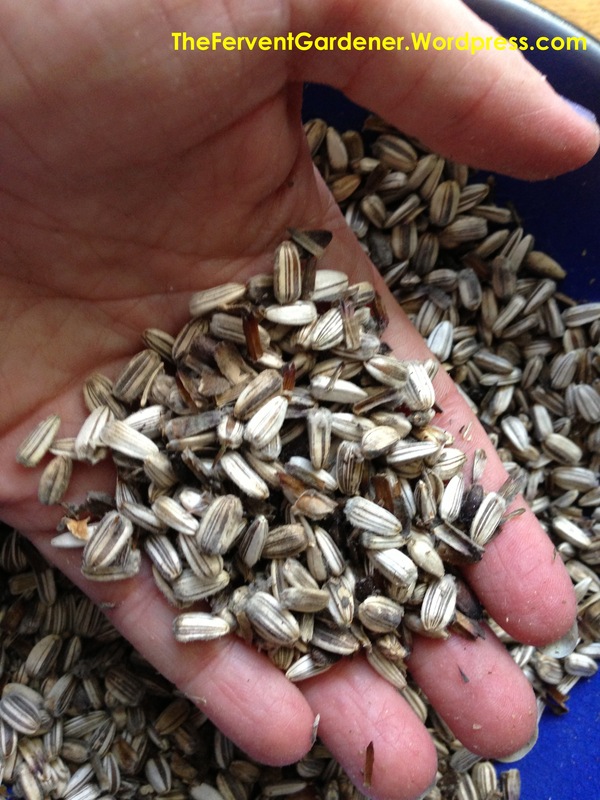 If you are hoping to eat your seeds, then choosing a variety with larger seeds will make that easier. 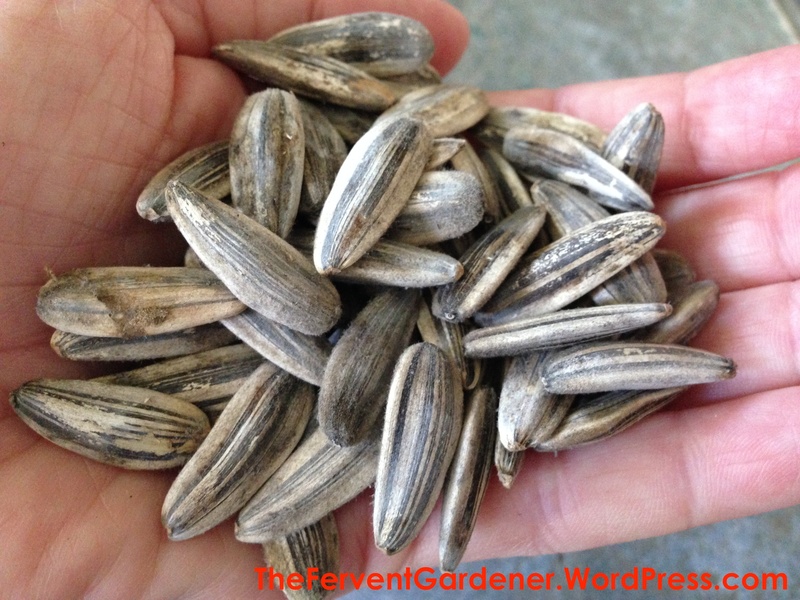 While you can still eat the smaller seeds, the process is not as labor intensive if you have a variety with snack sized seeds (what the seed catalogs call the bigger seeds). Here you can see the difference I’m talking about. This is a harvest of the smaller sized seeds. And here is a comparison with a larger variety. So when you are planning your garden for next season, please consider carving out a little space to plant a few sunflowers. You, and the bees, will be glad you did. Now get out there and garden!! I LOVE sweet potatoes. LOVE them. Tasty. Pretty. Healthy. Easy to grow (seriously, super easy). Store well. You don’t need to devote a lot of space to them, either. As a result, they are a staple in my little backyard garden. Growing these little orange jewels in Texas is pretty straight forward and relatively problem free. The biggest issue I have with them is controlling the wealth of vines the sweet potatoes try and spread out across the garden. 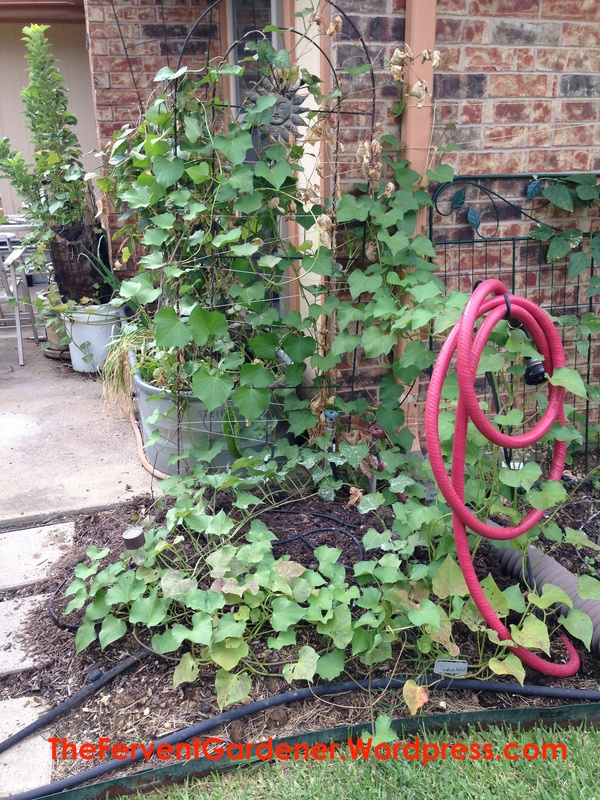 Left to their own devices, those vines would cover half my backyard like something out of a sci-fi film! But as long as you don’t leave them to fend for themselves for long periods, you can tame those enthusiastic vines. So…where do you start? 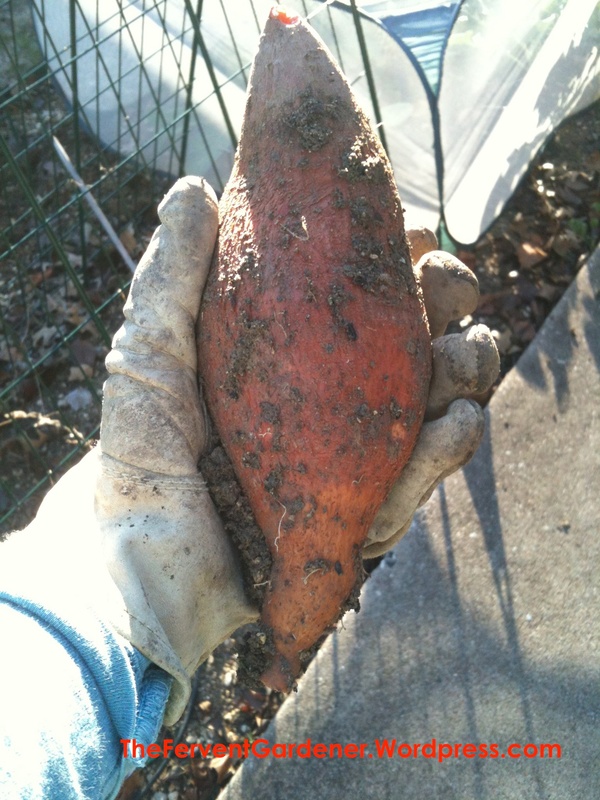 Well, you are going to plant your sweet potatoes in the Spring, so you need to start preparing your slips in February. 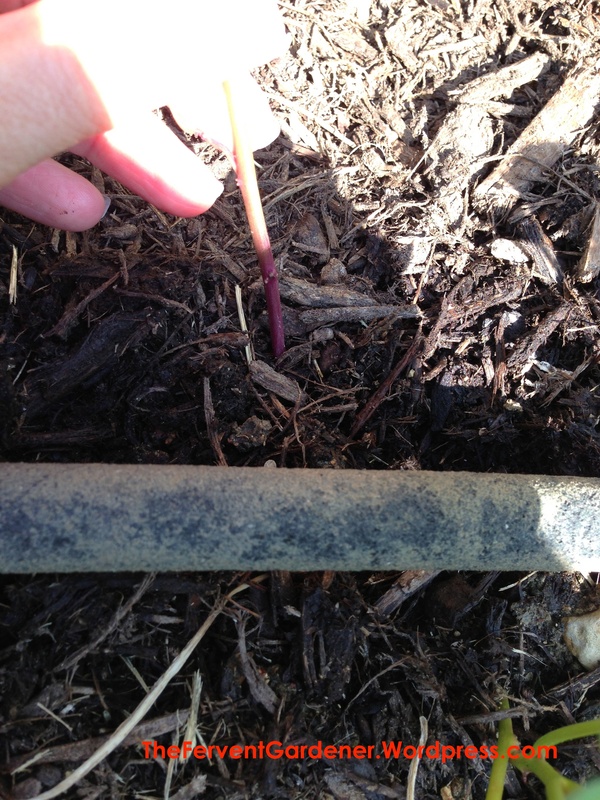 “Slips” are the little sweet potato shoots you plant in the garden that grow into your sweet potatoes. 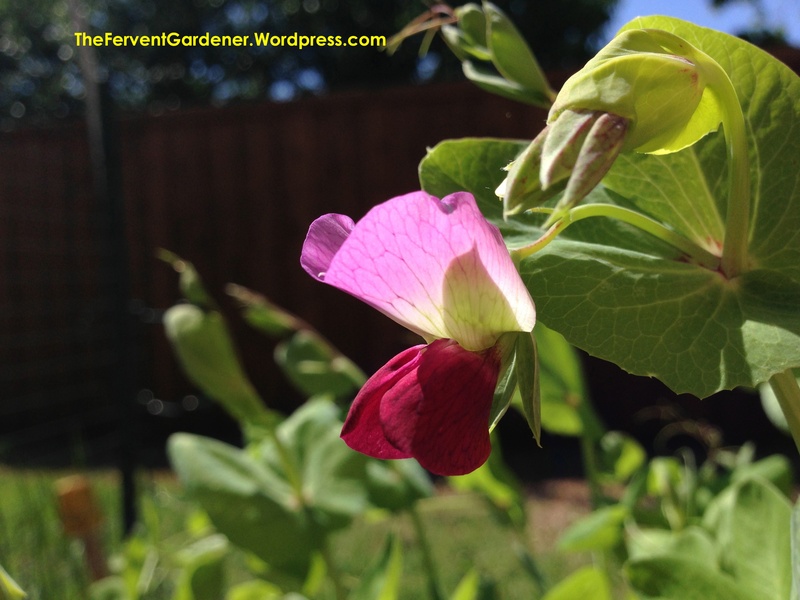 You can buy them from nurseries and from many sources online….or you can grow your own, like I do. 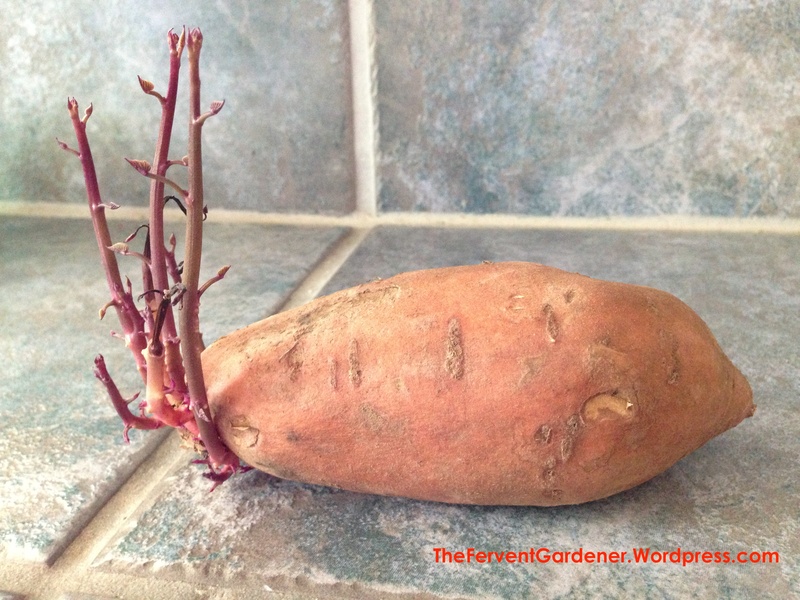 Much like my post about growing white potatoes, if you want to grow your own sweet potato slips, you need to head to the store and buy a few sweet potatoes. If you buy from a nursery or online, you will know the exact variety of sweet potato you are growing, but if you buy from the grocery store, you will not. I know that I prefer sweet potatoes that are dark orange, so I look for that type in the store. I buy a few, bring them home, and cook one. If it is the tasty thing I was hoping for, I sprout the remaining sweet potatoes. If it wasn’t what I was looking for, I head back to the store. 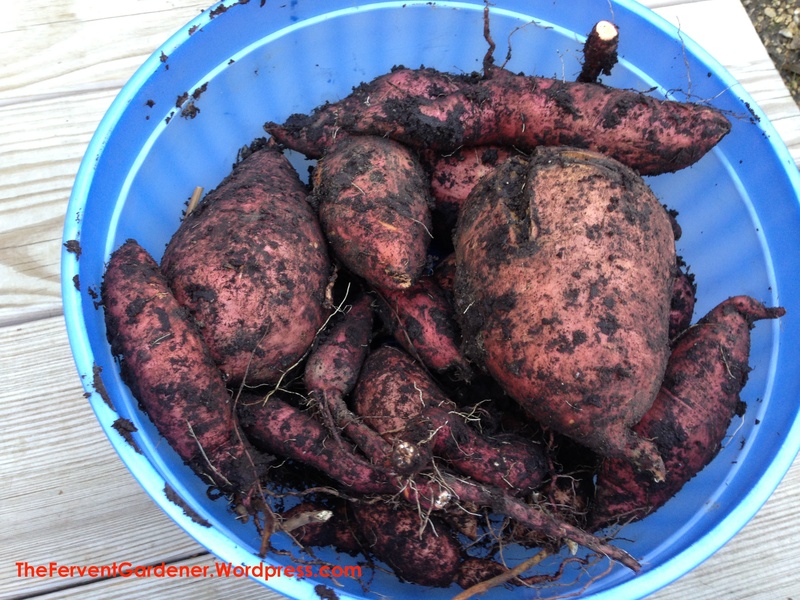 You will have the most luck sprouting organic sweet potatoes, so opt for those if you can. 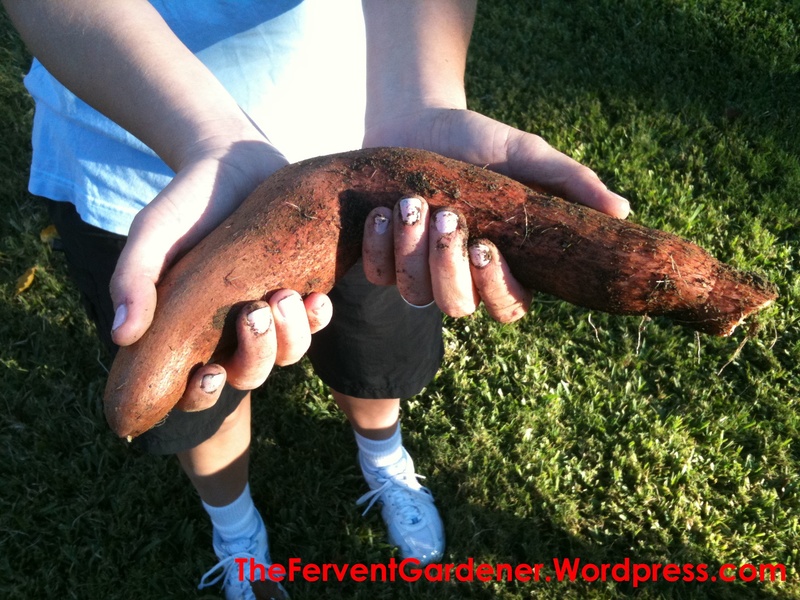 Okay, so now you have a handful of sweet potatoes you know you like. Now what? Here’s the super hard part. Ready? You set them out on your kitchen counter and leave them alone. Difficult, right? Just let those sweet potatoes sit there until they start to sprout out of one end. 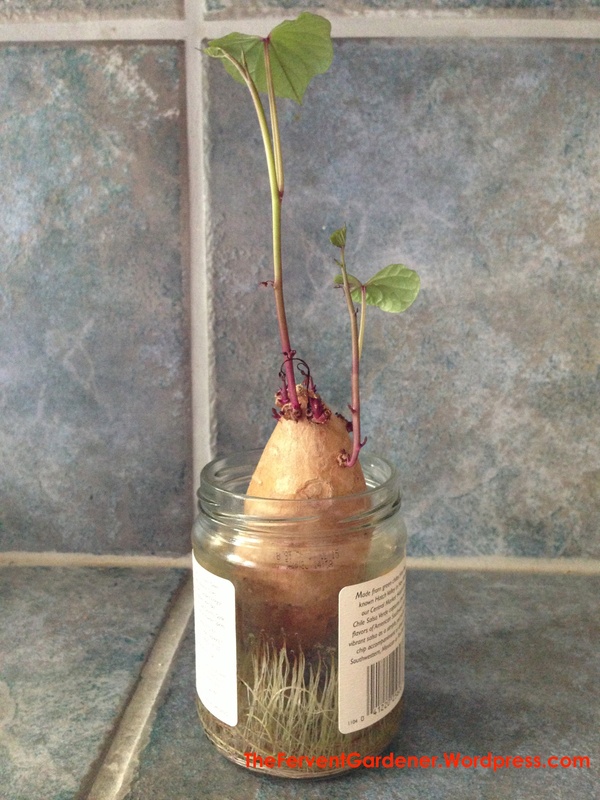 Now that you have some sprouting going on, you need to put the other end of the sweet potato in some water and set it in a sunny spot, like on a window sill. I usually use a small jar for this. To be clear, you put the end with NO sprouts coming out of it in the water, and the sprouted end is the one on top. As you can see from this picture above, the potato will continue to grow sprouts out the top, and little roots on the bottom. Each of those little sprouts on the top are a “slip.” You can get quite a few from one potato. I usually just need to sprout two sweet potatoes to get all the slips I will need, and then some. Once your slips are several inches long, and have a leaf or two forming, you can remove them from the sweet potato and plant them immediately in the garden. It doesn’t matter if they get a little longer and more leafy before you plant them (like the one below), so don’t feel pressured to rush them into the garden if it’s not warm enough outside yet. You want to set them out when it is warm during the day and all danger of frost has past. 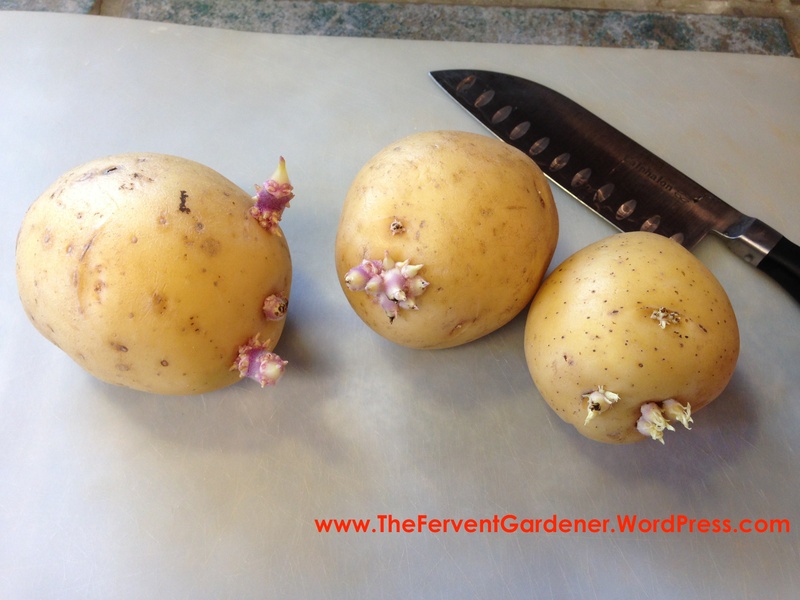 If you feel good about it being the right time to plant, then you are going to want to snip each slip off the potato with sharp, clean scissors – right at the point where it comes out of the potato. One note – you don’t have to cut them all off at once. If several are big enough to cut off and plant, but a few aren’t, then remove the ones that are ready and set the potato with the remaining sprouts, still attached, back on the window sill. Once they have grown a little more, you can snip them off and plant them with the others in the garden. Now that you have your slips ready to go, you need a good spot for them in the garden. Sweet potatoes are root vegetables, so they will a need nice, deeply tilled, sunny patch that is relatively free of rocks. 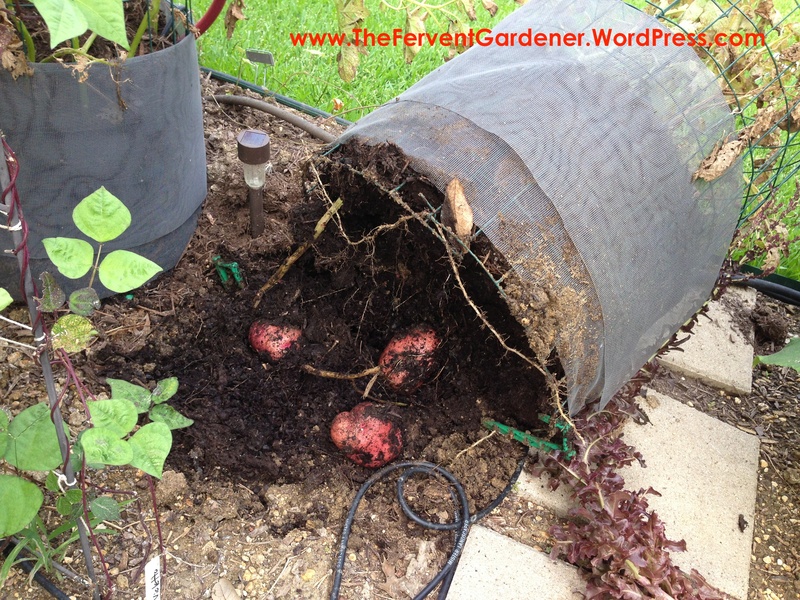 Rocks, and other obstacles, will cause the sweet potatoes to grow crooked. Root vegetables also need well drained soil – they will rot in the ground if they get water logged. 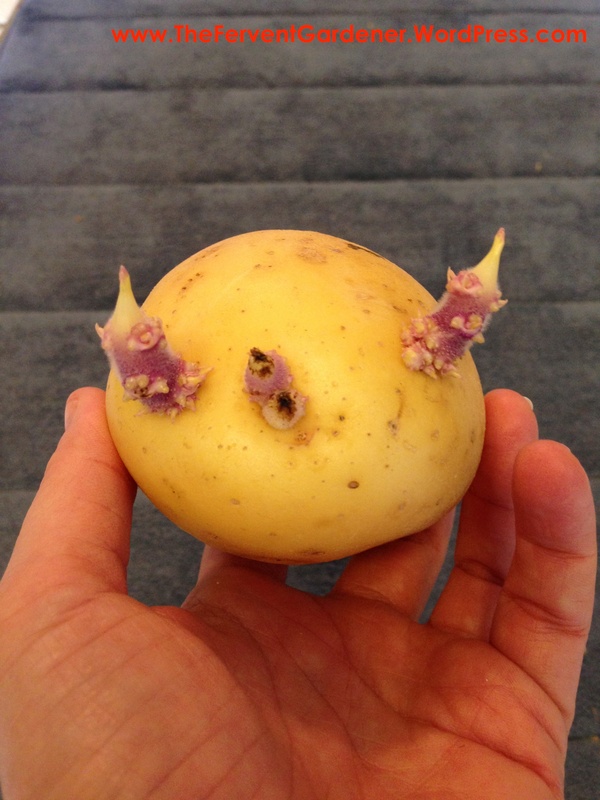 Squishy, rotted, potatoes….ew. How big a patch you decide on, will depend on how many potatoes you want to grow. I usually plant about 7 slips in a square that is roughly 2′ 6″ x 2′ 6″ – and from that small space I am harvest enough sweet potatoes to get me through the Winter. So, pick your spot, make sure it gets plenty of sun, make sure it doesn’t get water logged, till it up nice a deep, remove all the rocks and other debris you can, and add in a little compost if you think your soil needs it. Time to plant! 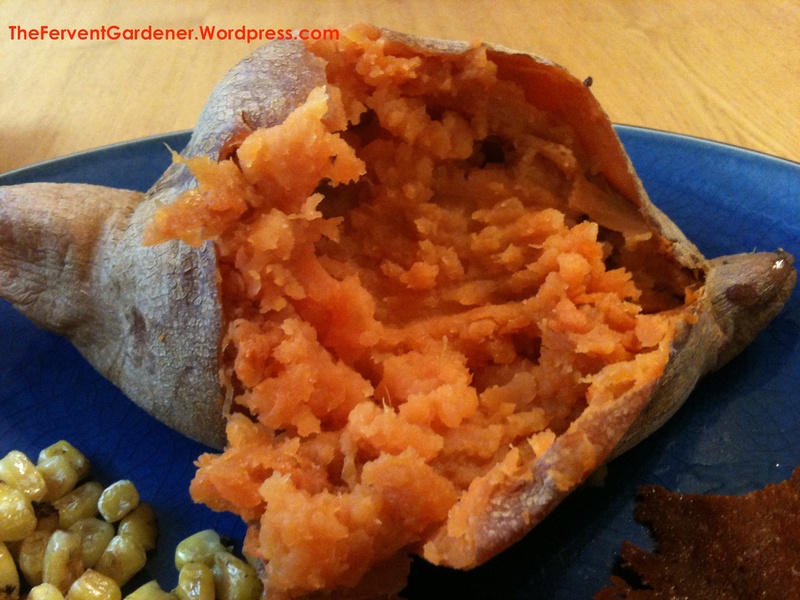 Sweet potatoes grow in a cone shape below the main plant (which will be the grown up version of that slip you are about to plant), so you want to leave a least a 8 inches or so between slips. Planting the slips is almost as hard as that “setting them on the counter” thing you did earlier. You take that cute little slip and…drum roll….stick it into the dirt. That’s really it…you just gently push the slip into the soil a few inches. Boom! Sweet potato planted! The little baby slips will need to be kept watered for a few days till they establish roots and can move on to a more regular watering like the rest of your garden. You don’t want them soaked all the time, just don’t let the sprouts dry out completely for a few days. After that, your sweet potatoes will be off to the races – meaning they will start sending out vines like you wouldn’t believe! Seriously, they will grow all over the place if you let them. 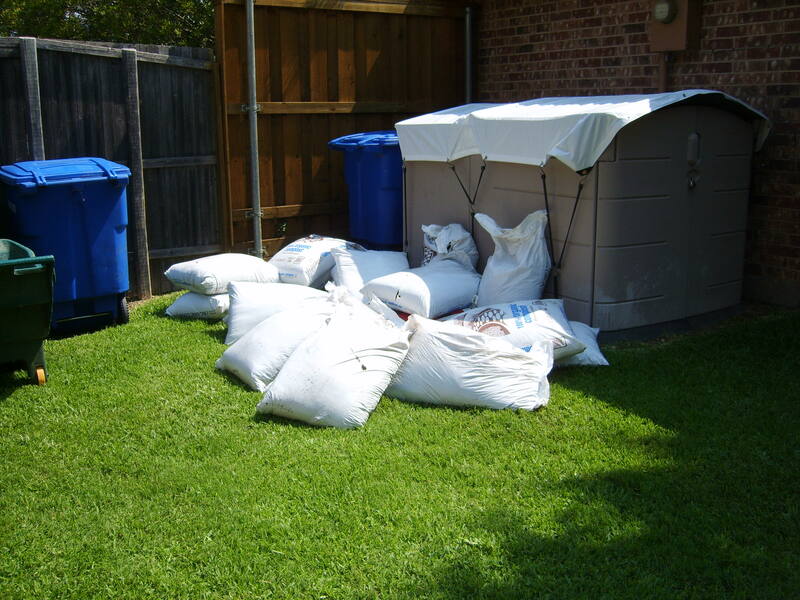 So before that starts happening and your garden is overrun, you will need a plan. 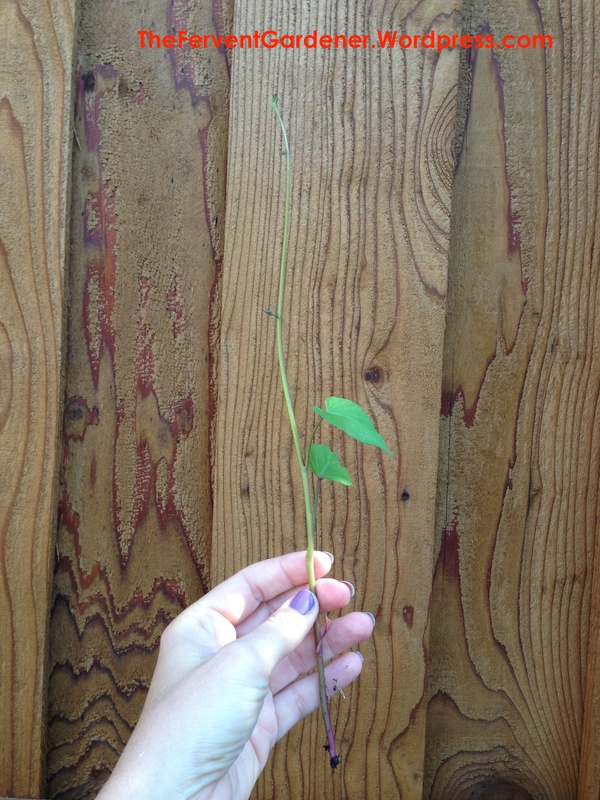 I have found placing a trellis in the ground right behind the sweet potato patch when I plant a good solution. Then as the vines grow, I toss them up on to the trellis (they won’t agree to this on their own, you will have to direct the vines yourself). Don’t be fooled by this picture – this was still early in the season when the vines were just getting going. 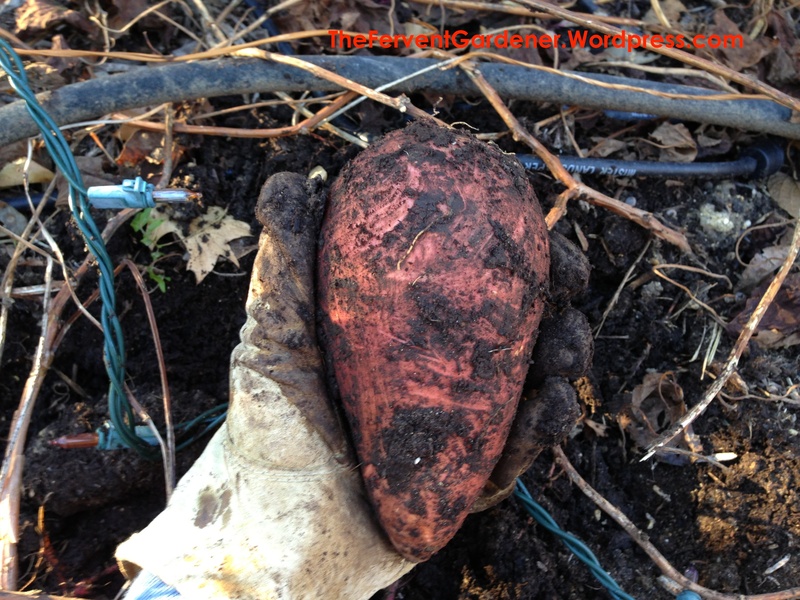 You can trim back particularly long or unruly vines if you need to, but since the vines are the potatoes’ source for gathering sunlight you will need to leave plenty to feed the sweet potatoes. One note more on the vines. 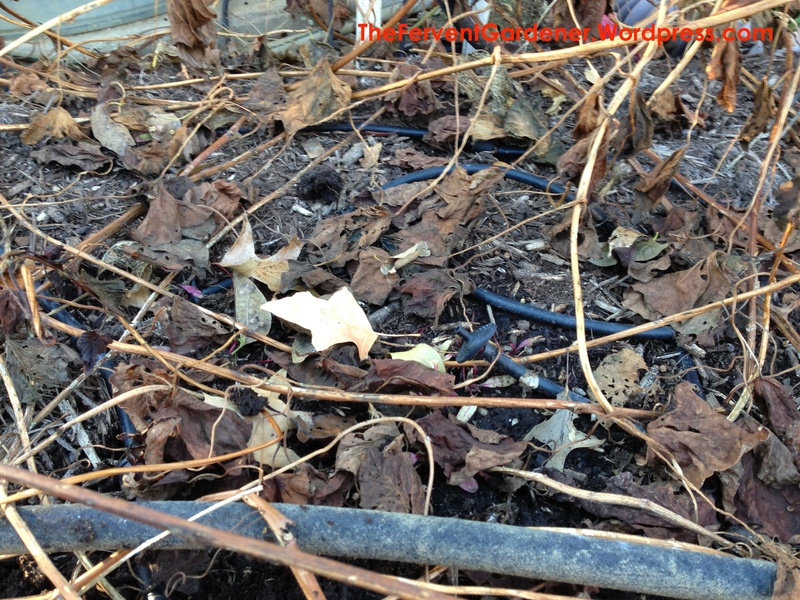 Vines laying on the ground will, eventually, send down roots that will grow more sweet potatoes. Those sweet potatoes won’t grow fast enough to really show up this year – they will be the ones that spring up in your garden next year. So, if you allow your vines to sprawl happily through your garden, then next year you will have little sweet potato plants sprouting in unexpected places. This may, or may not, be okay with you, so plan accordingly. Since one or two vines are bound to get away from you somehow, even with your diligence, this is going to happen to you a few times. Depending on where they pop up, it might be a pleasant surprise. On the plus side, it’s not like they are invasive in some way. Just a few errant sweet potatoes now and then. When to harvest? It will take all Summer long and into the Fall for your sweet potato crop to mature. If you are in the mood for a sweet potato in late Summer, and your soil is loose enough, you can gently stick your hand down into the soil near one of the plants and see if you can find a potato of adequate size for your dinner. They are attached to the main plant by a small root, so they are easy to snip off, leaving the rest of the plant undisturbed. As for the remainder of the crop, you will know all the sweet potatoes are ready to harvest when the vines begin to die off. When this happens, it’s time to dig. Ever so gently, so you don’t damage the potatoes, dig up the entire patch. 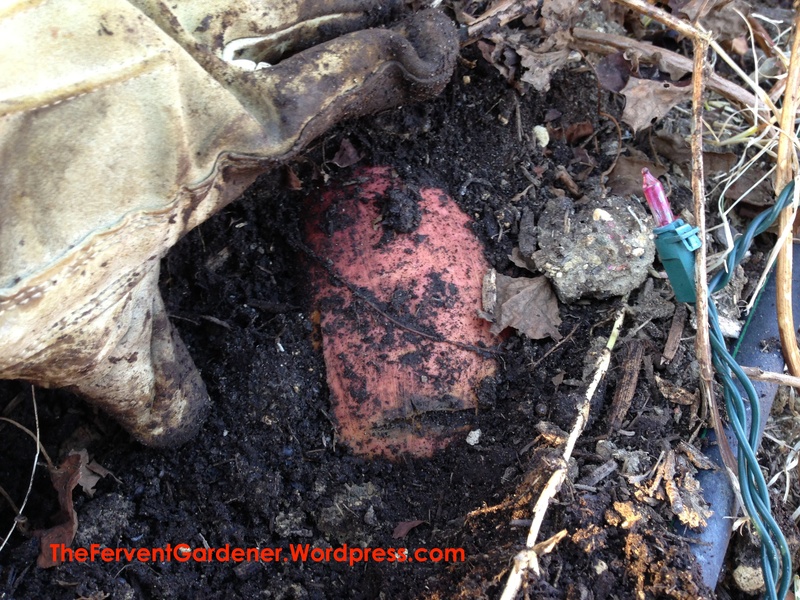 I tend to go about it like an archaeologist – I dig slowly and carefully, unearthing one potato at a time. Be sure to over turn the entire area in your hunt – some sweet potatoes manage to wander a bit from the rest of the group. A pretty big reward, for relatively little work. I’m sure you have your favorite way to prepare these nutritious powerhouses, but here are two of mine. 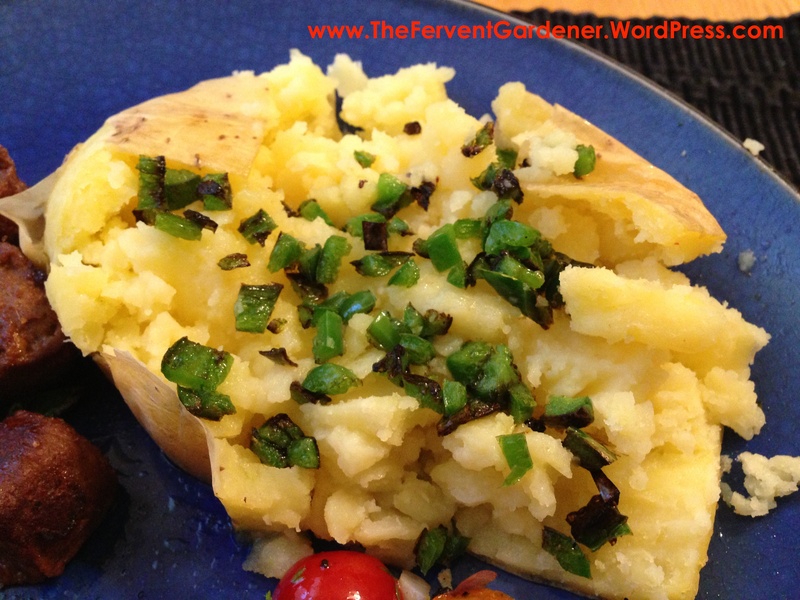 You can’t go wrong with the baked sweet potato – they also cook up nicely wrapped in foil on the grill. 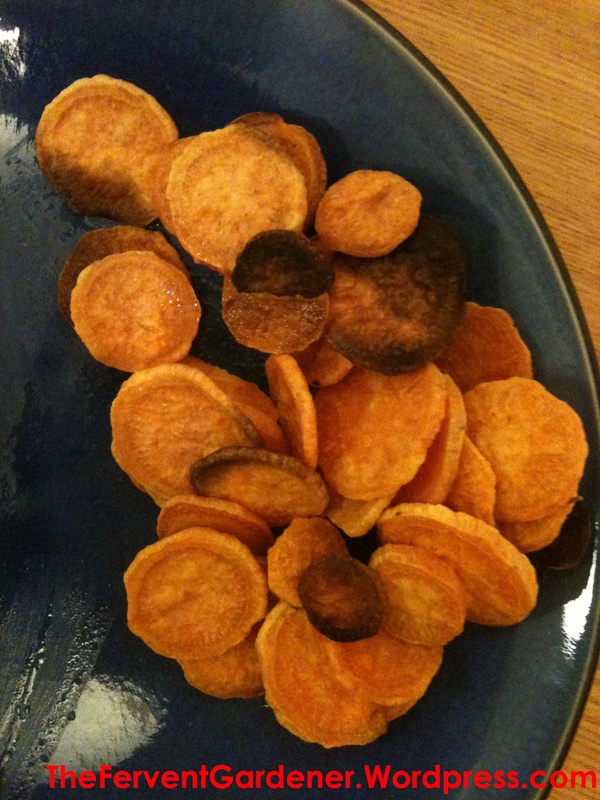 But one you may not have ever tried, is oven baked sweet potato disks. You just peel the sweet potato, slice really thin (like with a mandolin), toss with olive oil and pepper, spread on parchment paper, and bake at 350º till just starting to brown. You do have to keep an eye on them towards the end – they go from perfect to burned in seconds. That’s it! 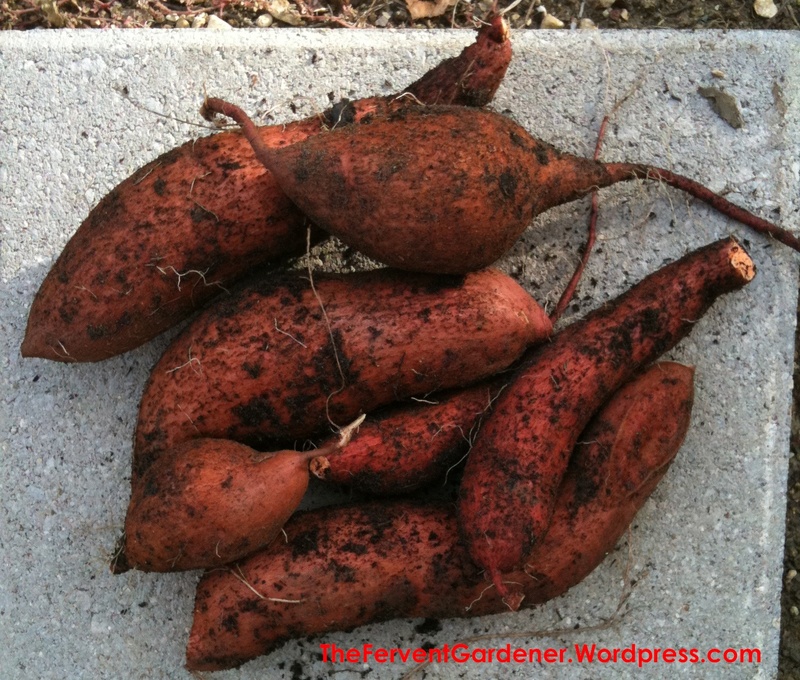 Even the garden with a small area to work with can grow sweet potatoes! And devoting the space for them is so worth it! Now get out there and garden! 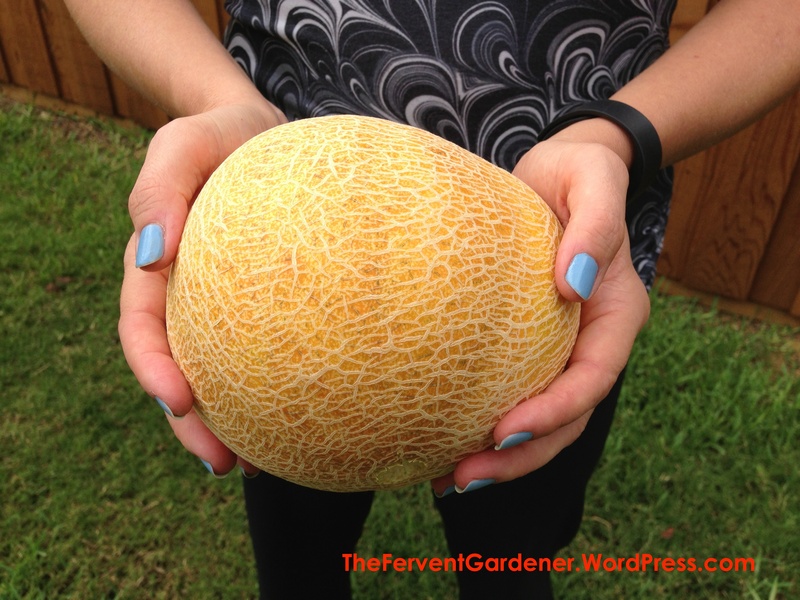 Cantaloupe fresh off the vine is a thing of beauty. It is so sweet and so juicy it will need to take center stage on your plate. 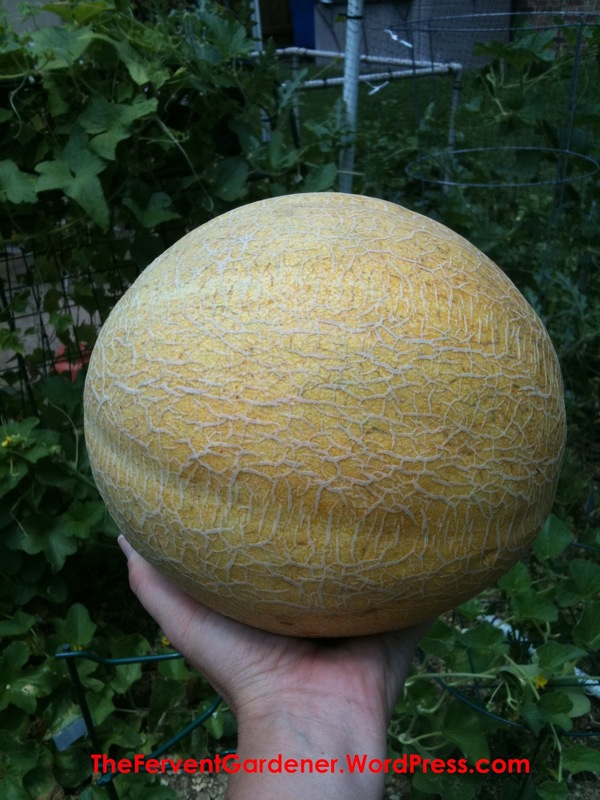 But some gardeners who love cantaloupe don’t grow it in their backyard garden because the vines take up so much space. I, for one, love cantaloupe far too much to let a little thing like limited space stop me. So what did I do? I did what I always do…I went vertical. 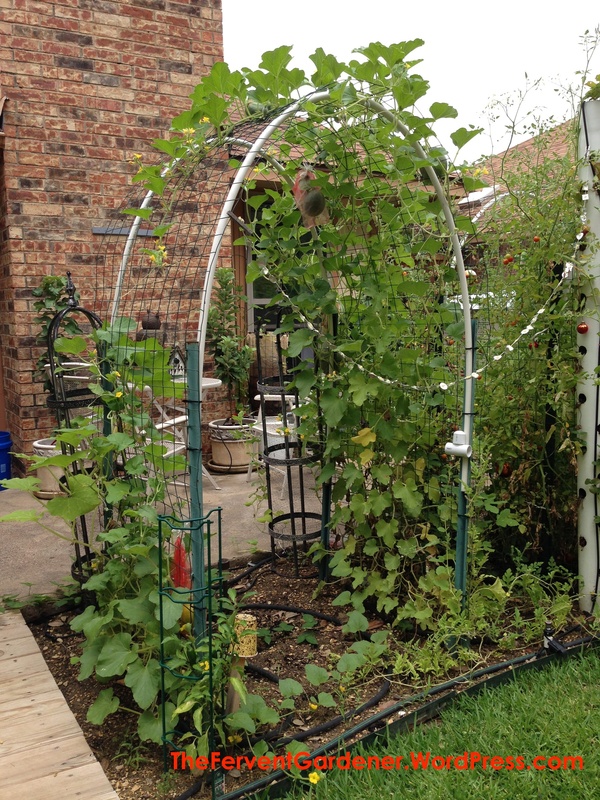 This simple arched trellis of mine can easily support eight cantaloupe plants – far more than I would be willing to plant if they needed ground room to sprawl. How did I build that amazing structure, you ask? Well let me tell you all about it. I knew there were a number of factors to consider when deciding what to use as a trellis for my melons. First, most cantaloupe varieties grow very long vines, so I knew I would want something that was tall enough to allow the vines to grow up and over. 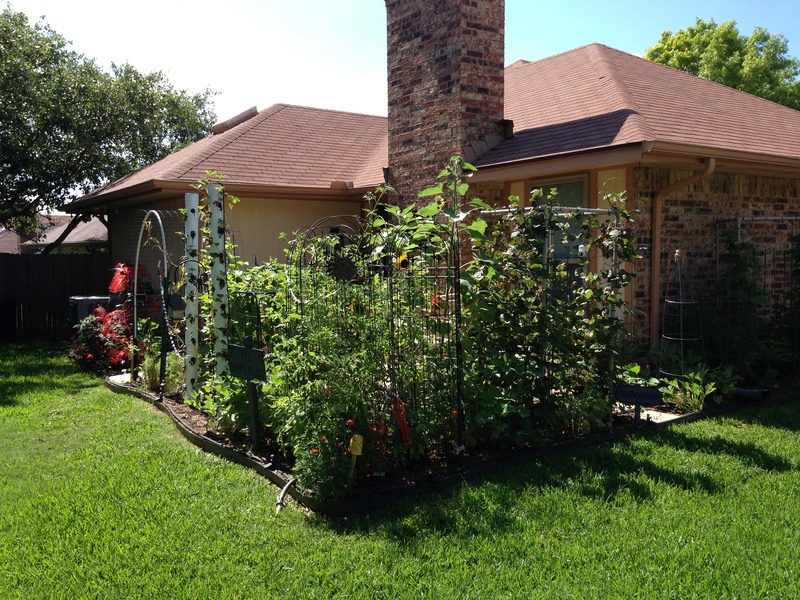 (This trellis is over six feet high, with the sides four feet apart.) 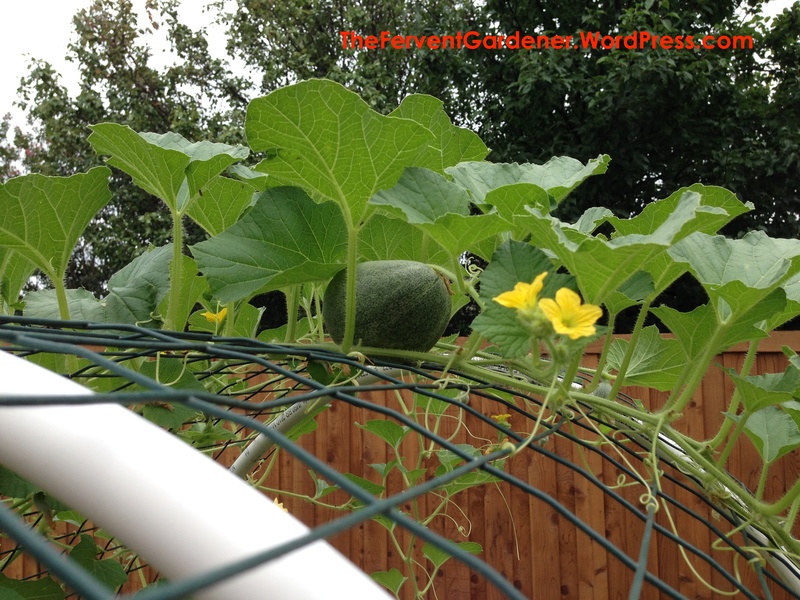 Second, since cantaloupe are a heavy, dense fruit, you need a very sturdy trellis that can handle the weight of a bountiful harvest without collapsing. And finally, I wanted something that had tight enough gaps to make it easy for the vines to climb the structure with minimal help from me. 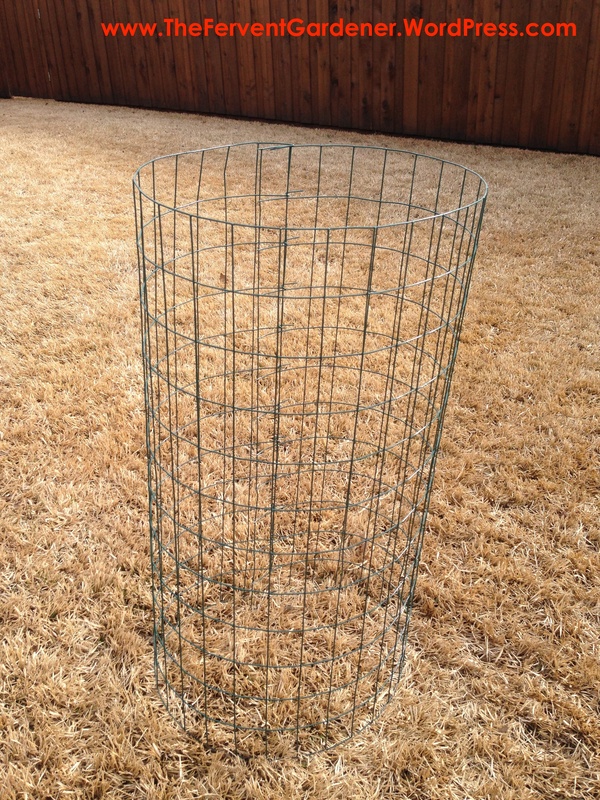 I opted for the same welded wire I used to build my potato towers. Like I mentioned above, I wanted a trellis that was a little over six feet high at the top and four feet from side to side. So I measured out my length of wire and snipped off the amount I needed. I then hammered four U-Posts into the ground just inside the points that would be the four corners of my trellis – since the trellis is going to hold a heavy load, I opted for slightly bigger U-posts than the wire might usually call for and I hammered then as deep as I could for maximum stability. 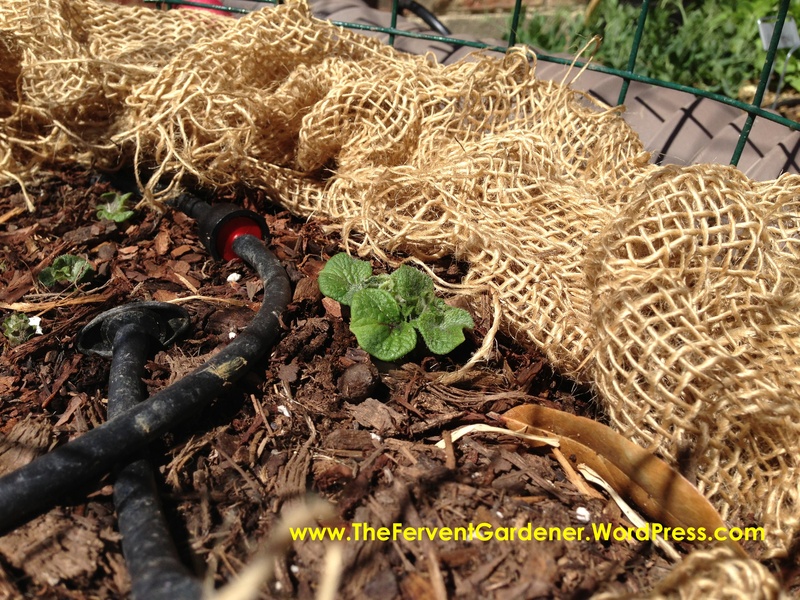 I planted my posts so that the open U was facing the inside of the trellis and the hooks were facing out. Once my U-Posts were in place, I attached the welded wire to the posts using the hooks on the posts and zip ties. My choice of the welded wire made it easy enough to bend into the arch I wanted, but lacked some strength in that very arch that needed some extra support. 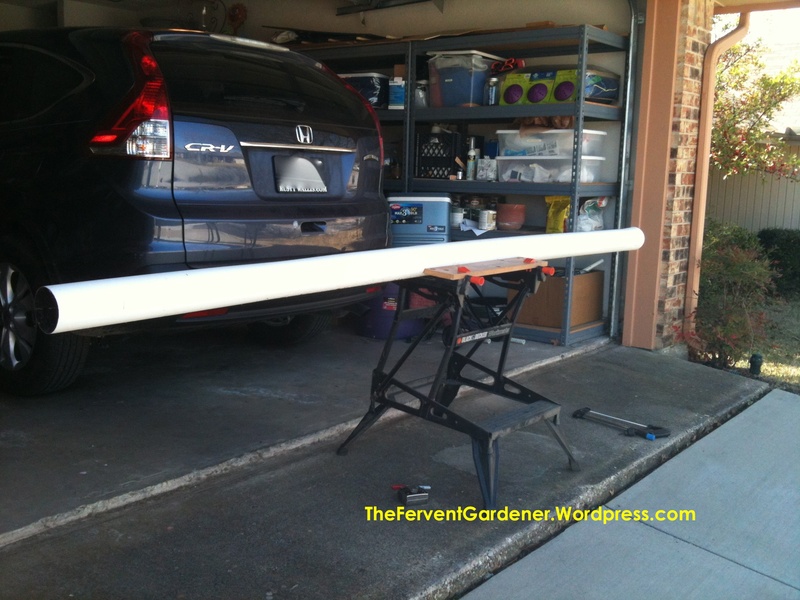 For that, I took a stick of 1/2″ PVC, grabbed it out towards the ends and gently bent it into a curve that matched my trellis arch. At the point it was simple as pie to slip that PVC curve up inside the arch with the pipe fitting fairly well into the open U of the posts. The final step was to add a few zip ties to hold the PVC in place. 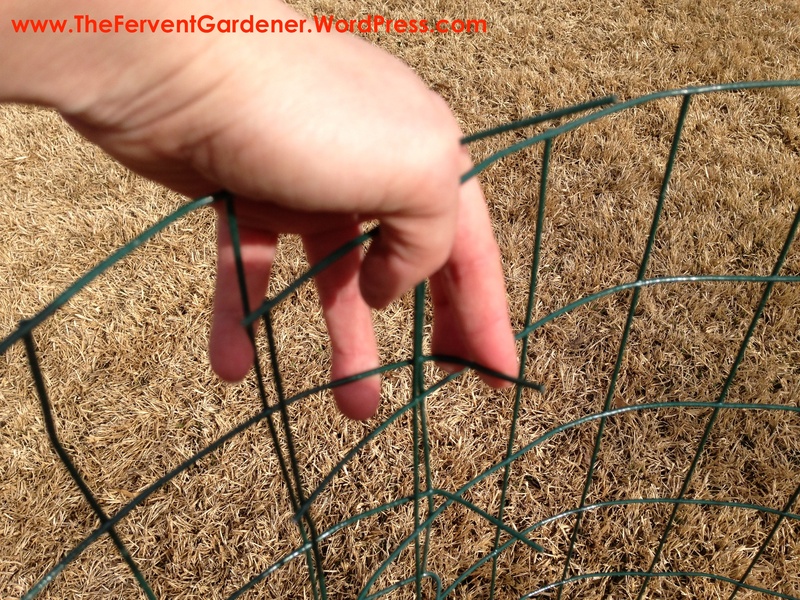 At that point, the pressure of the PVC pushing out against the U-Posts in an attempt to straighten, coupled with the zip ties, will make a very sturdy arch trellis that is all ready for your cantaloupe vines. For the watering of the cantaloupes, I ran a soaker hose on a timer along the sides of the trellis as you can see in the picture above. 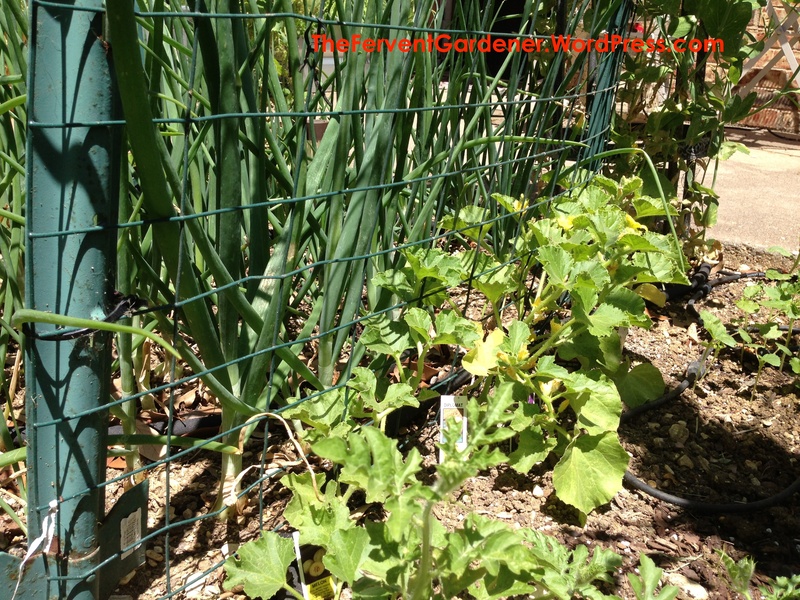 I also like to take advantage of any empty space in the garden, like the one in the middle of the trellis, to squeeze in another crop of something – in this case onions. I knew the onions would grow during the cooler season before I planted the cantaloupe, and be harvested before the cantaloupe vines took over the area. Next step was to plant the cantaloupe. 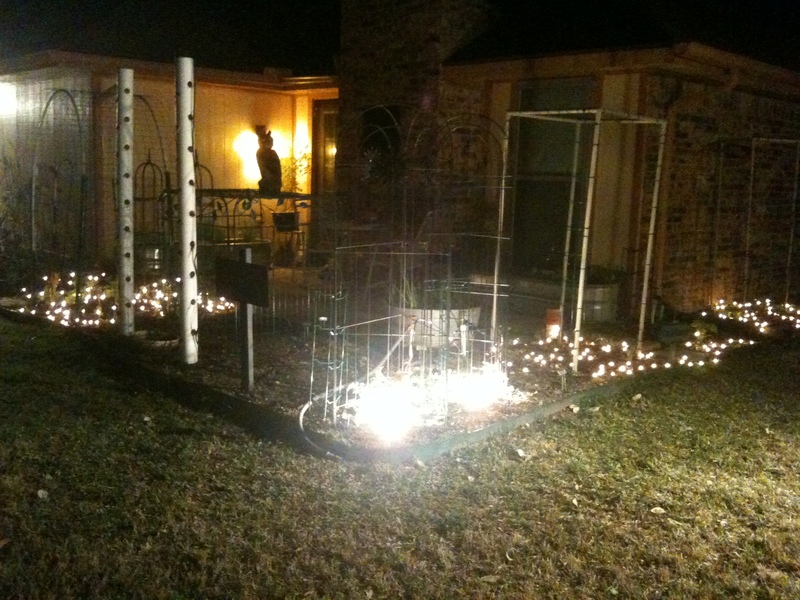 I planted several varieties, some from seed and some from nursery transplants, all along the welded wire sides. 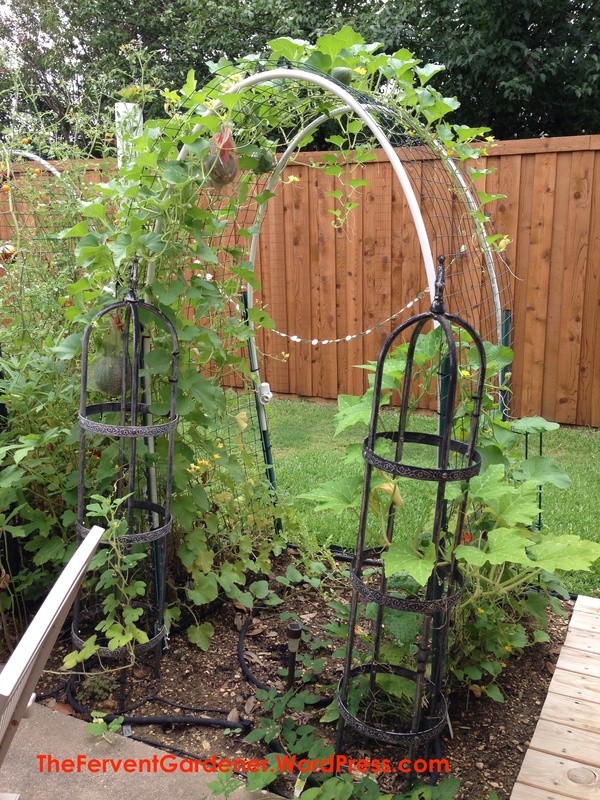 As they grew, I encouraged them to weave up through the trellis rather than grow along the ground. When they actively started climbing, they continued to weave through the trellis on their own, but I watched for vines trying to wander off the trellis from time to time and corralled them back onto the arch. 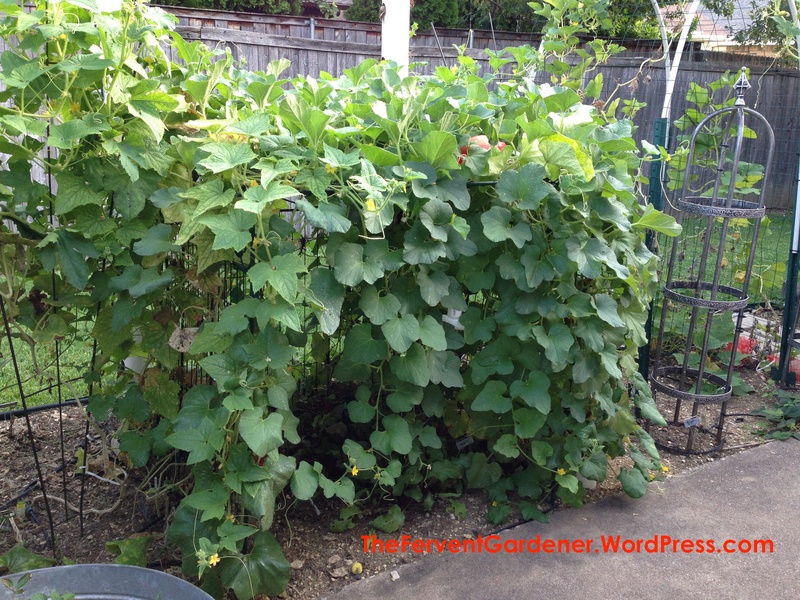 Once the vines had gotten long and happy on the arch, and the weather had heated up, I started getting little baby cantaloupes hanging all over the trellis. 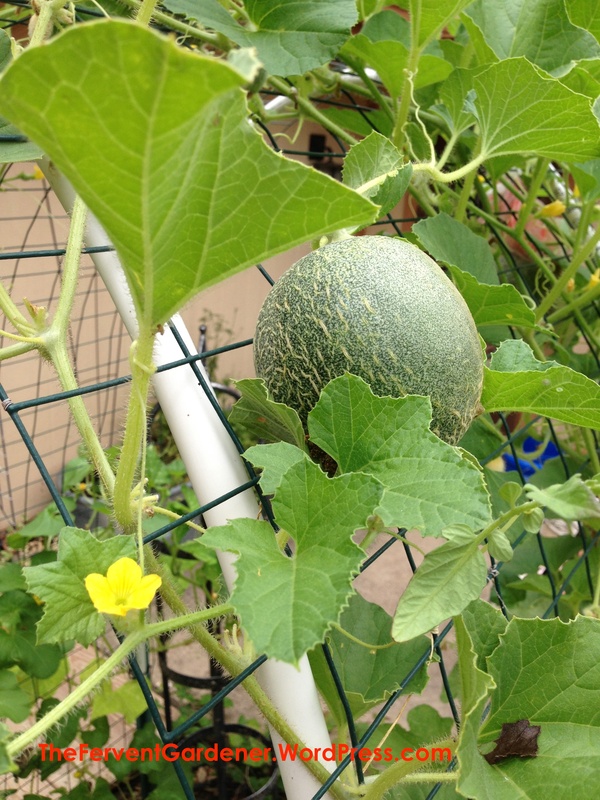 Cantaloupe vines are pretty strong and keep a tight hold on the fruit as it grows, but with the melons hanging out there in space, it is a good idea to offer them a bit of support. My choice was to buy these mesh produce bags with drawstrings in bulk online. The place I purchased these no longer carries them, so I have been on the hunt for a new supply. The ones I found at HarrisSeeds.com are not the same, but close enough. You want something big enough to hold the full grown fruit, but not so big that there is WAY too much bag. And that drawstring is pretty important, as you are about to see. 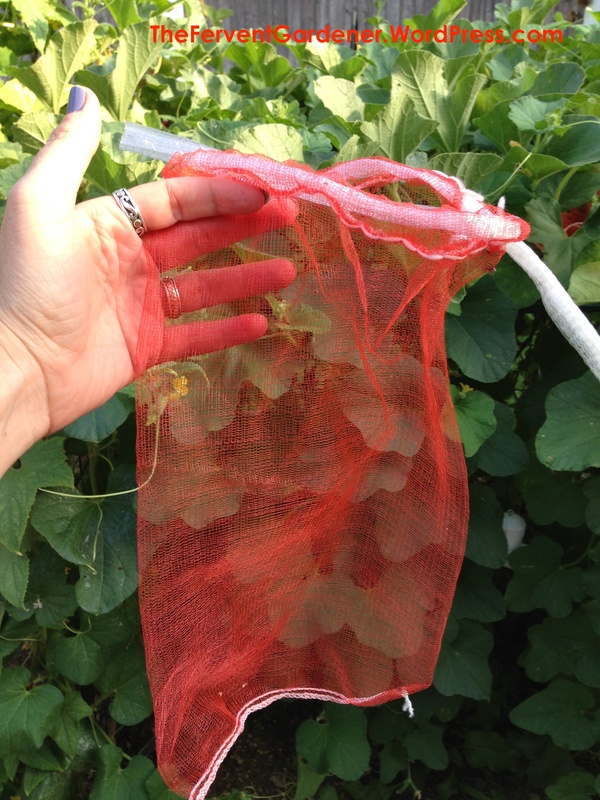 Once the fruit starts getting big, it’s time to GENTLY slip it inside a bag and then tie the drawstring to the trellis so that the bag takes some of the weight. 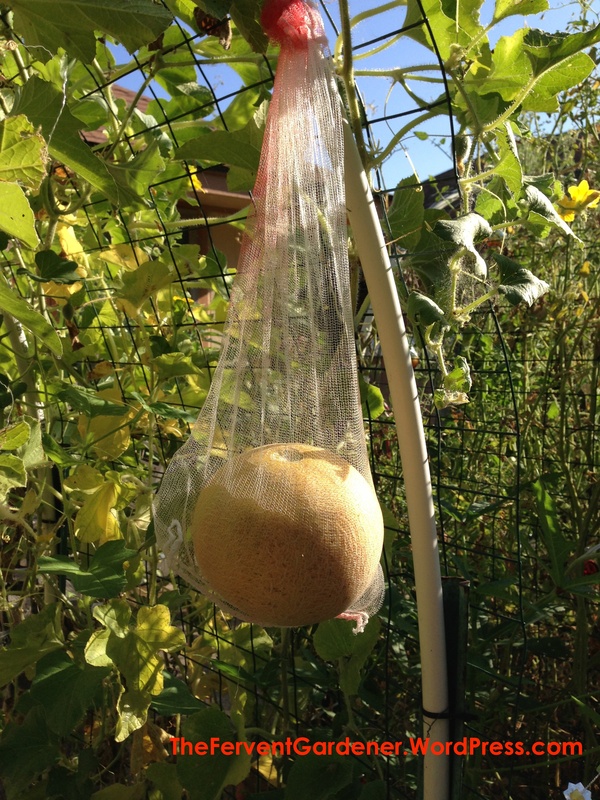 The bag will help protect the growing melon from birds and other pests, and take some of the stress off the vine. 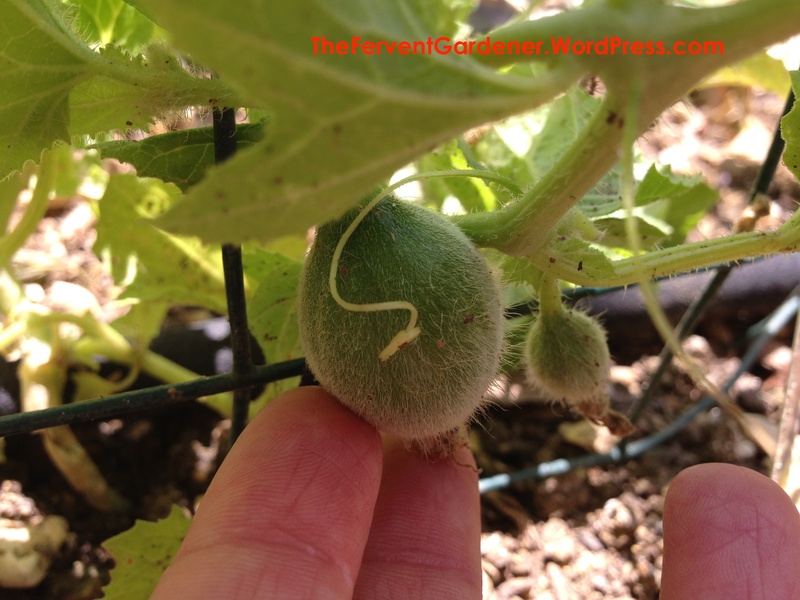 When it is time to harvest, you simple untie the bag and pop the cantaloupe off the vine. 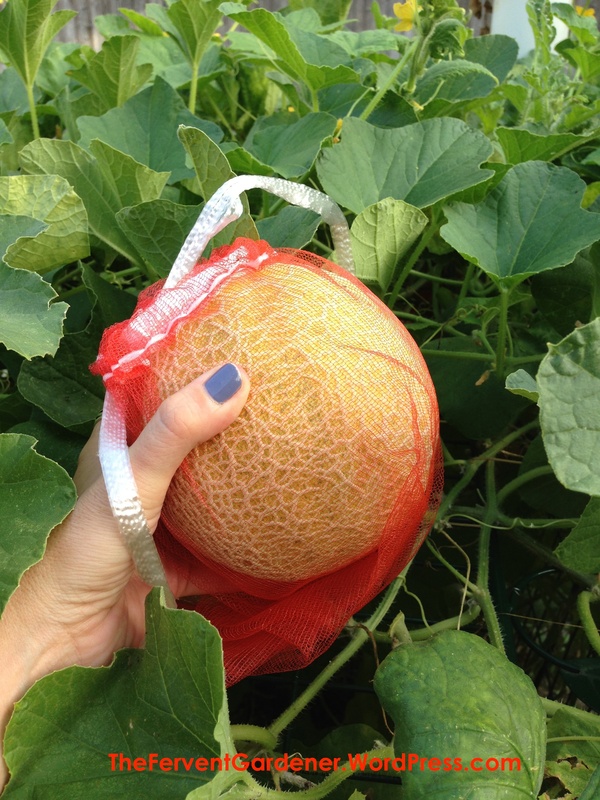 One of the other benefits of the mesh bags is that when a cantaloupe is perfectly ripe, it will separate from it’s vine. 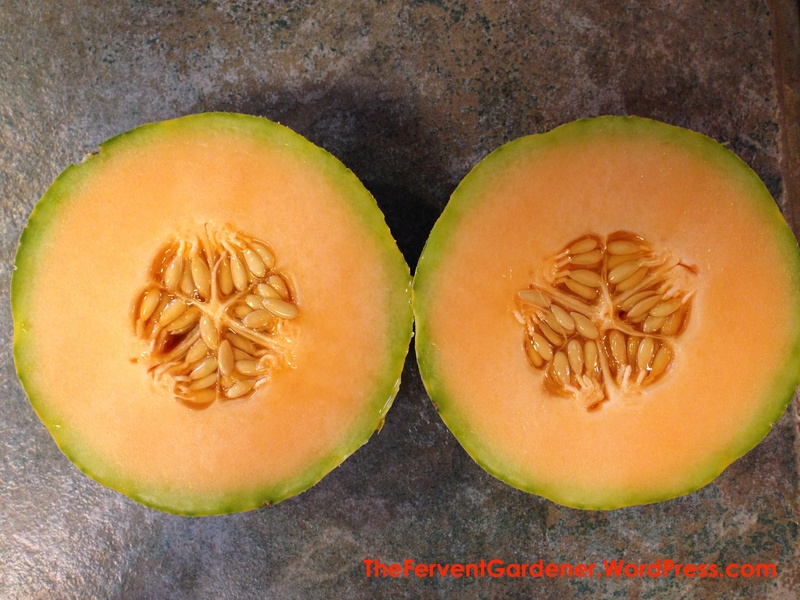 Should the cantaloupe reach complete ripeness before you harvest it, that beautiful melon will separate from the vine due to the fact that it is hanging from it and fall. Without the bag, tragedy might result. But with the bag, the fruit falls safely into the bag and waits patiently for you to come back out to the garden and find it. 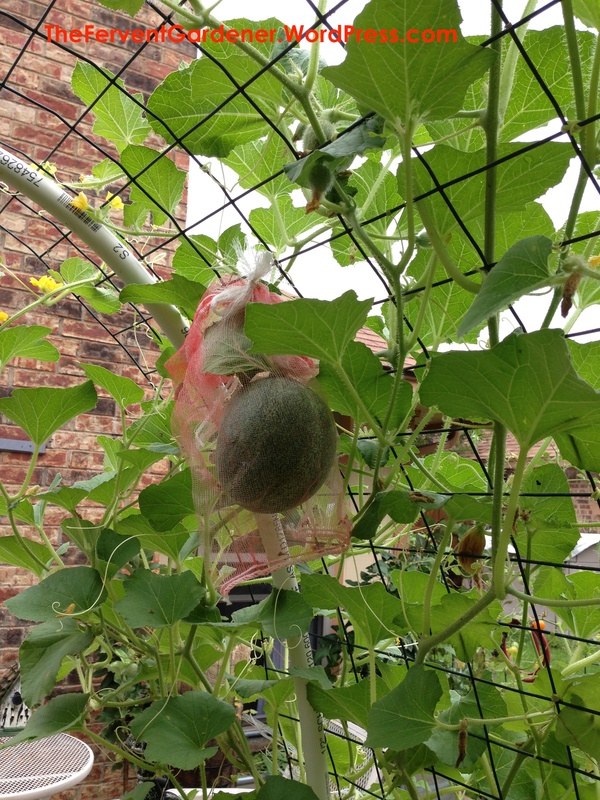 If, however, a melon forms on the OUTSIDE of the trellis wire where it is supported by the trellis itself, you can decide whether you feel a bag would be beneficial or not. This one that grew on the top of my arch, for instance, is safe and sound up there with no need for support. But this one, that grew on the side, is more of a question – it might be fine, but it still might fall to the ground when it ripens. In the end, I put a bag around this one for safety. Just couldn’t risk that awesomeness smashing to the ground. 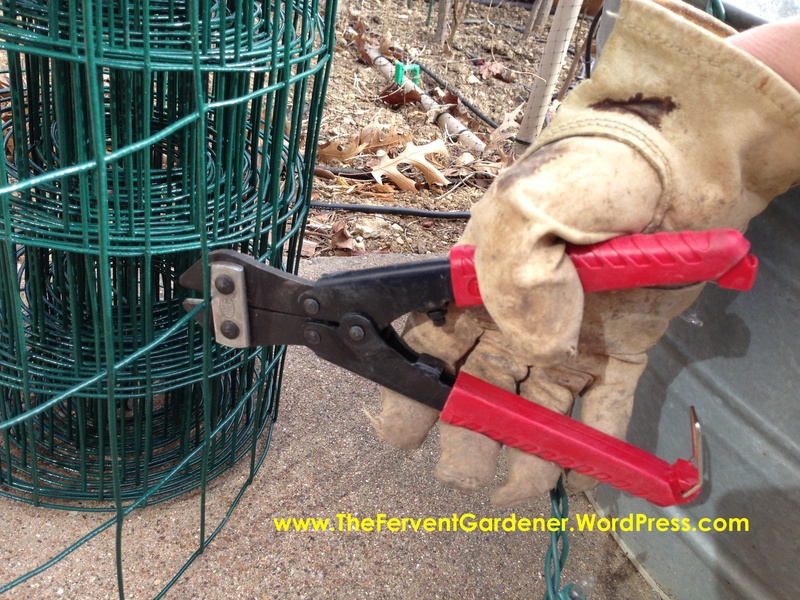 Now a quick word about trying a shorter trellis. 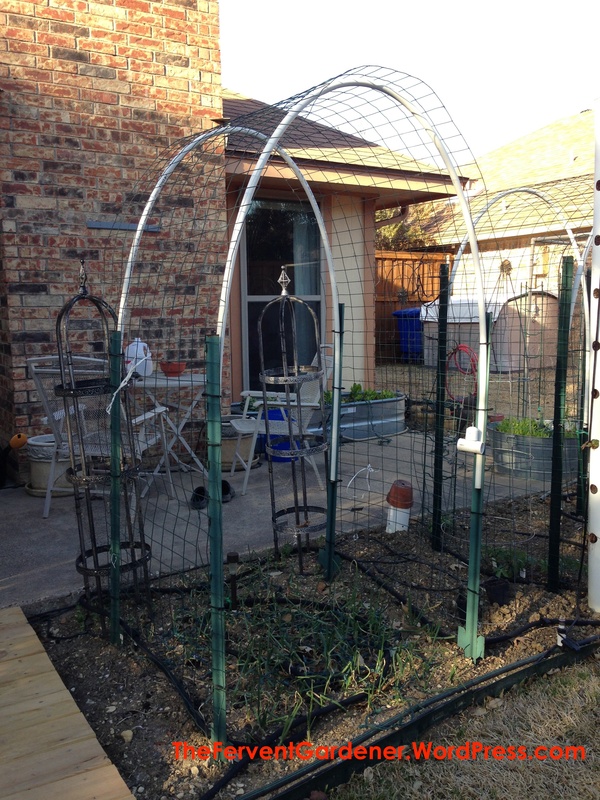 I did a shorter trellis last year with garden gate sections that was super sturdy, but only about three feet high. The vines enveloped it in no time and it took a lot of effort to keep them from wandering off into the garden. So I do highly recommend going with a tall structure for these vining fruits. All that is left at this point, it admiring and enjoying your fabulous cantaloupes. 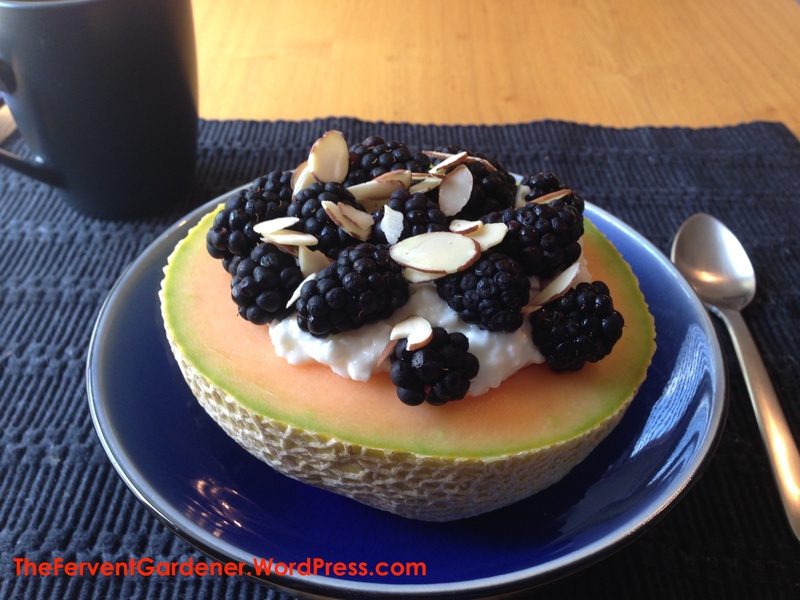 Fresh melon from the garden is a treat worth the work, so don’t let having a small area to garden keep you from planting them. So good! Oh my goodness! 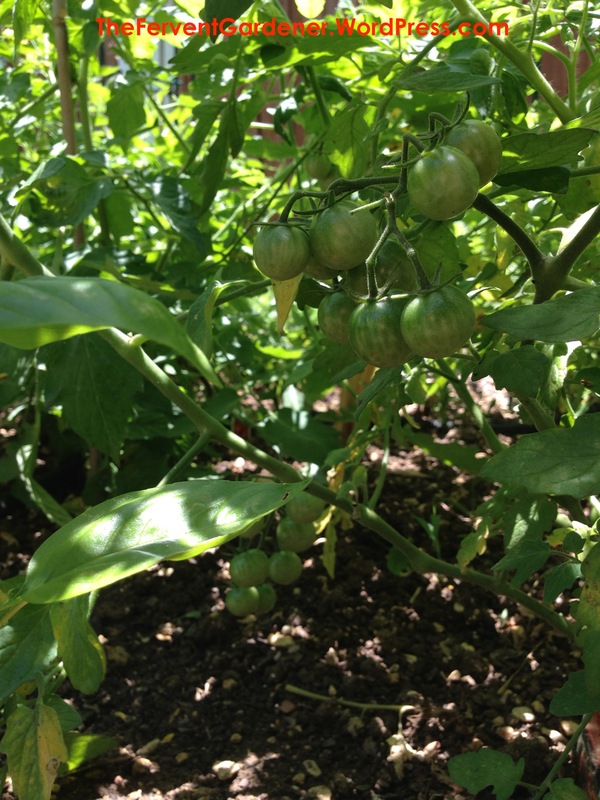 I love the tomatoes from my garden…but so do aphids and whiteflies. Both of those tiny little buggers, plus things like leaf miners, attack plants all over your garden, leaving devastated veggies in their wake. And to make matters worse, these teeny little pests can be close to impossible to get rid of once they are established. 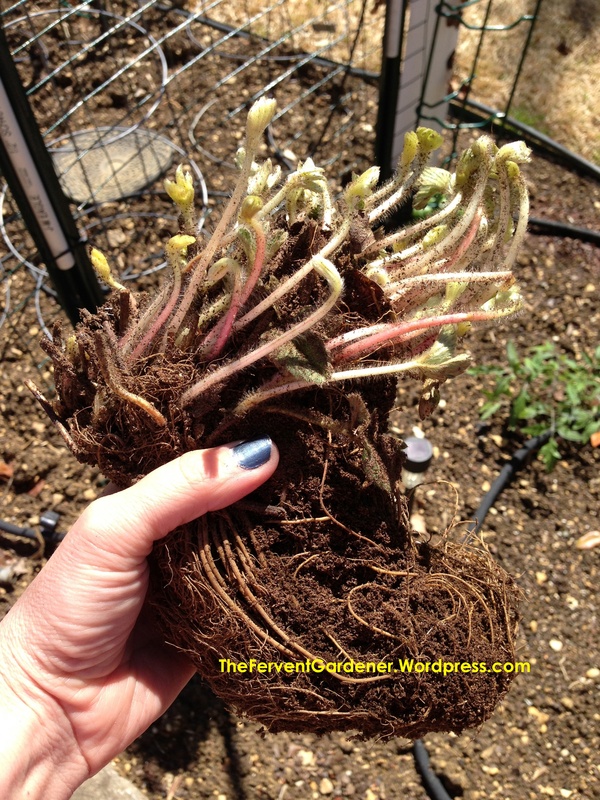 I am not a fan of using heavy chemicals – so what’s a gardener to do? When at all possible, I prefer to defend my garden in the first place and prevent or repel unwanted insects, reducing the number of pests that gain a foothold and have to be fought. And what defense are we going to talk about today? Sticky yellow cup traps. Cheap and simple, these yellow plastic cups are covered in a sticky substance that feels like a cross between glue and Vaseline. 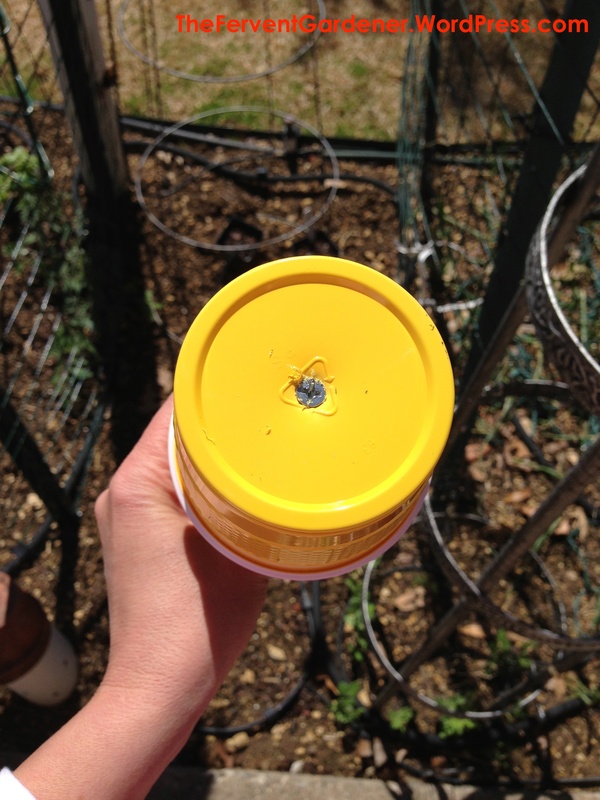 The idea here is that the pests that are drawn to all your produce with yellow flowers will see that big beautiful yellow cup, think it is a big delicious flower on their favorite plant to attack, land on it…and get stuck. Big insects like bees and butterflies can usually escape unharmed, but the nasty little guys you don’t want making a home in your garden get stuck and never have a chance to destroy your beautiful tomatoes, peppers, cucumbers, melons, etc. The cool thing about this product is that it never hardens like glue and won’t wash off in the rain, so it keeps right on working until the cup is too covered in bugs to still be effective. This is a preventative, not a cure, so be sure to set these out in the garden when you plant in the Spring and Fall so they can get right to work on helping stop the problem before it starts. Now, you can BUY yellow sticky traps that will accomplish much the same thing, but this suggestion is much cheaper…and I think easier to manage. 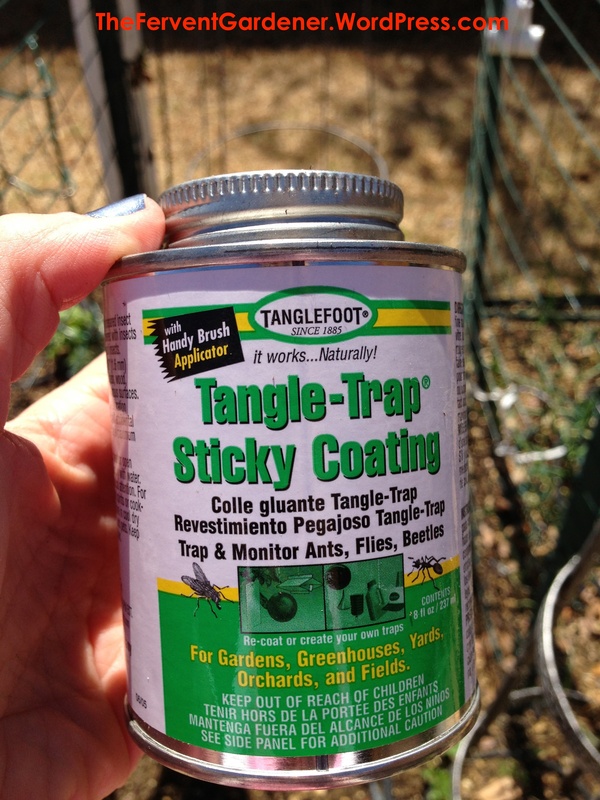 Now it’s time to coat the whole thing with the Tanglefoot – also called Tree Tanglewood and Tangle Trap. You can purchase this at some nurseries and home improvement stores – or on the internet from lots of sources. 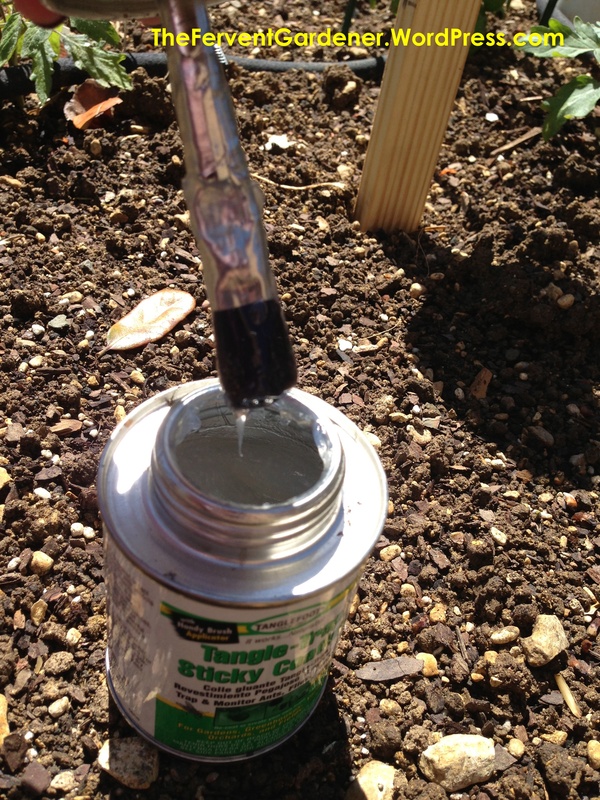 I like to buy a can with the brush attached to the lid for easy application of the gooey contents. While trying not to get this sticky stuff all over yourself, coat the entire outside of the cup with the Tanglefoot – don’t forget to do all the way around and the top as well. You want a nice thick layer, but it doesn’t need to be perfectly smooth or pretty. You just want to make sure there is Tanglefoot on the entire exterior of the cup so that an aphid will be stuck no matter where it lands. That’s it! The trap is set. 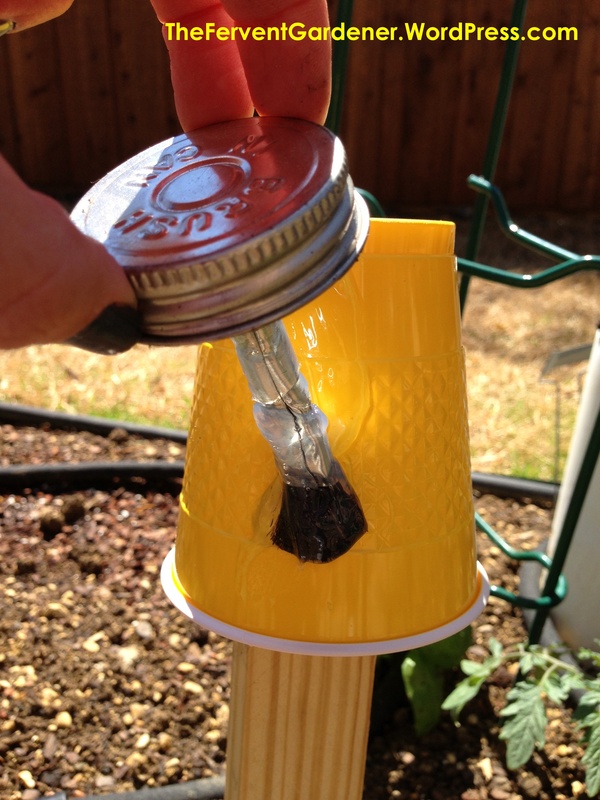 It won’t take long at all for you to start seeing flying insects stuck fast to your cup. Eventually, you will have enough insects stuck to the cup that it will be need to be replaced. You can toss the whole thing and start from scratch, or you can carefully remove and toss the cup, and reuse the stake and screws. A word of caution. As I keep saying, this stuff is sticky! It never hardens like glue, so if you brush against it, you will get sticky stuff stuck to you…usually with a few bugs as well…yuck! I can’t tell you how many times I leaned over near one of these and ended up with sticky goo and dead flies in my hair. Luckily it washes out…but…ew! There you have it! 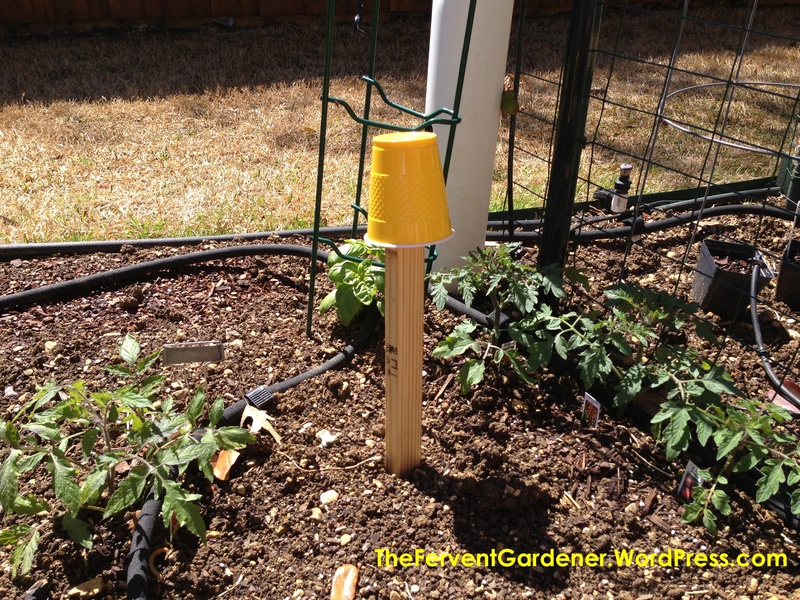 A simple, cheap, non-pesticide way to help prevent an infestation of aphids, whiteflies, and the like. Happy Gardening! I love potatoes. LOVE them. Baked, fried, mashed, in soups and in curries – you name it, I love it. With such a deep fondness I had no choice but to try my hand at growing these starchy little jewels in my small backyard garden. 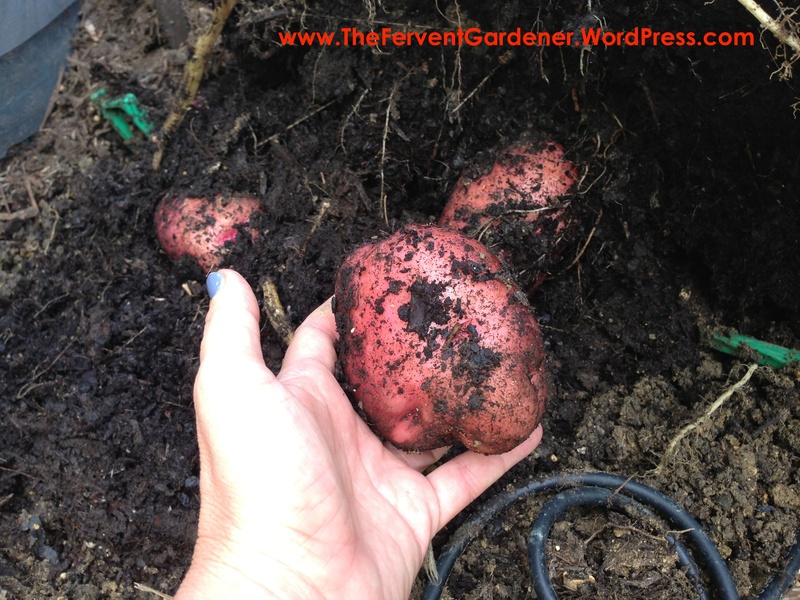 But what is a fervent gardener with a love for potatoes and a tiny space to grow them in to do? 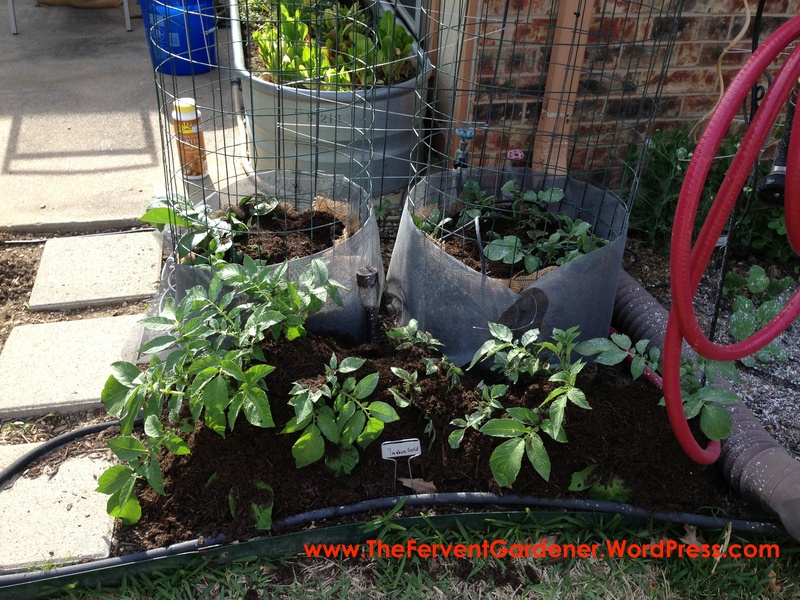 My solution for most space related garden issues is to go vertical, so naturally that is what I did with my potatoes. Not only were the planting and hilling processes super easy with these towers, but harvest was an absolute snap. Potato towers are now a permanent addition to my Spring garden. The first thing you are going to need are seed potatoes. You can buy them online from garden sites, get them from your local nursery, or take your chances with that store bought potato that started sprouting on the counter. 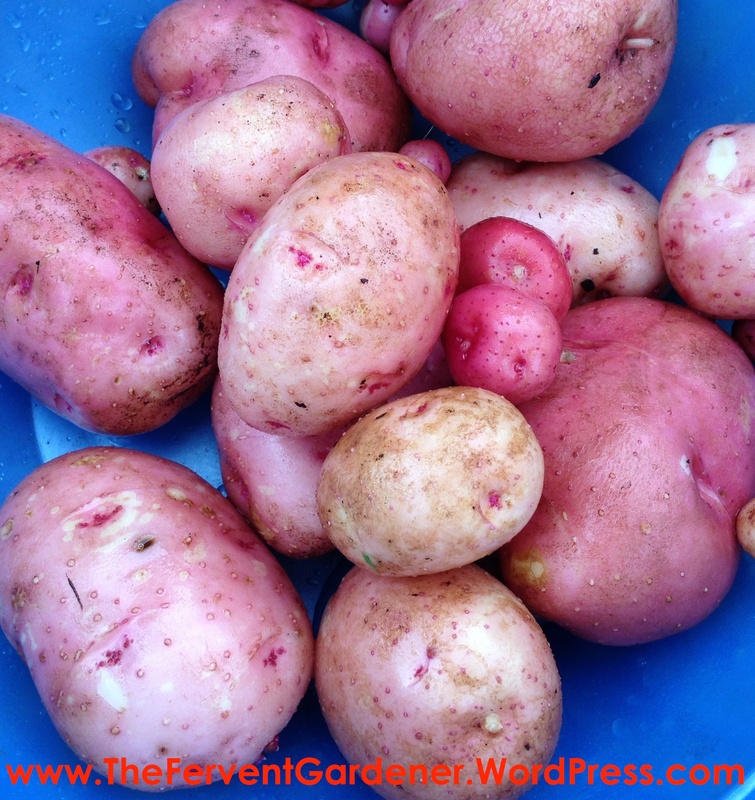 Online you will have to buy in large quantity – way more quantity than my little garden needed – but at your local nursery, you may be able to buy by the potato instead. As for the store bought one that you didn’t get around to eating before it started sending out shoots, the only real issue with those is that they are often treated with a chemical to slow the sprouting process, which is not awesome when what you are after is a thriving potato plant. But if what you purchased is an organic potato, or if it is sprouting with great enthusiasm, then I say plant it. 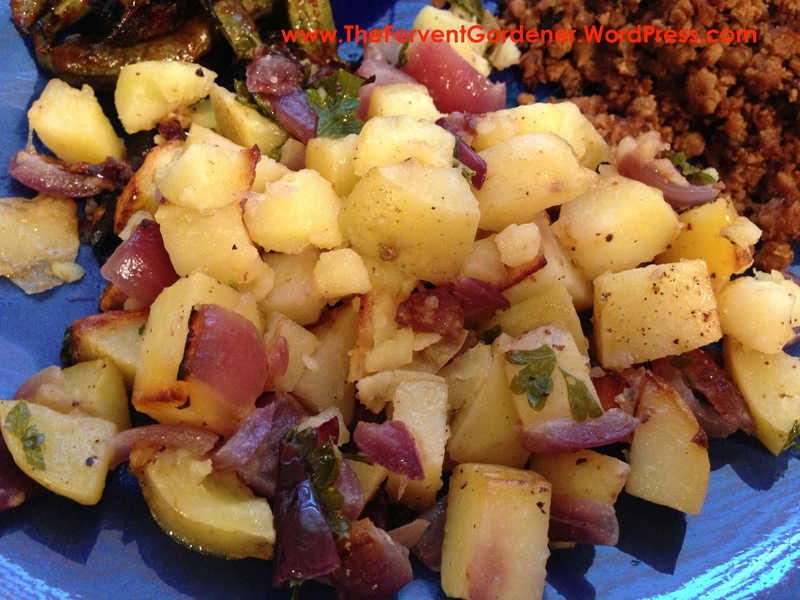 The red potatoes in this post were all purchased as seed potatoes from my favorite local nursery, but the Yukon Gold potatoes were ones that managed to sprout before I had cooked them up and stuffed them in my face. I got a pretty good yield from both. If you purchased seed potatoes, you are going to need to get them to sprout before you can move on to planting. You will want to place them in a warm dry place for a few days to a week to get those little buds going. Be sure to buy your seed potatoes early enough to allow time for this. 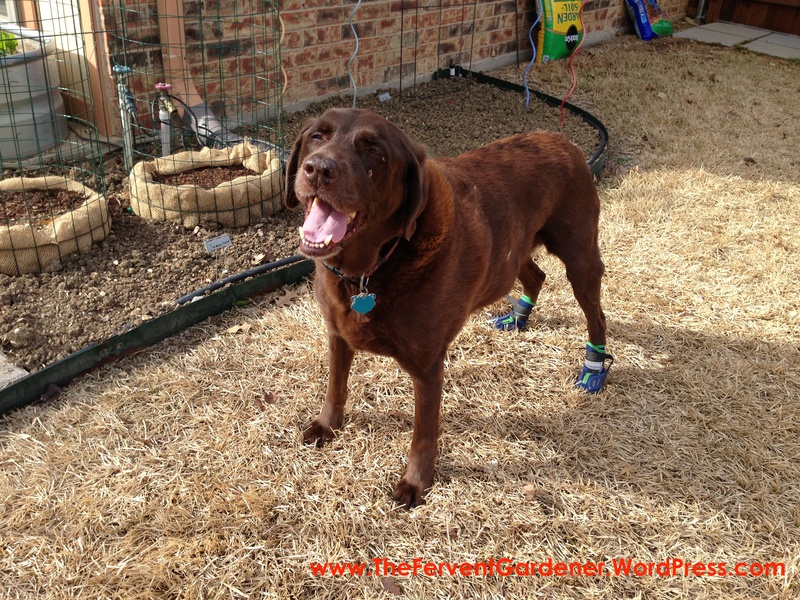 In Dallas, you will want to plant your potatoes sometime in February, so it is a good idea to get your seed potatoes by mid to late January to give them time to sprout, as well as cure (I’ll talk about that in a minute). Alrighty, so you have a nice little pile of potatoes with sprouts on them…now what? First, be careful not to break off any of those cute little sprouts. Those babies are the potato plants of tomorrow – the parents of your potato harvest to come. Second, you need to decide whether or not to cut the potatoes into smaller pieces. You want at least 2 or 3 sprouted eyes per planted potato, so if you potatoes are small, you may want to leave them in one piece. But if you have larger potatoes, you may want to cut them…which is what I decided to do. 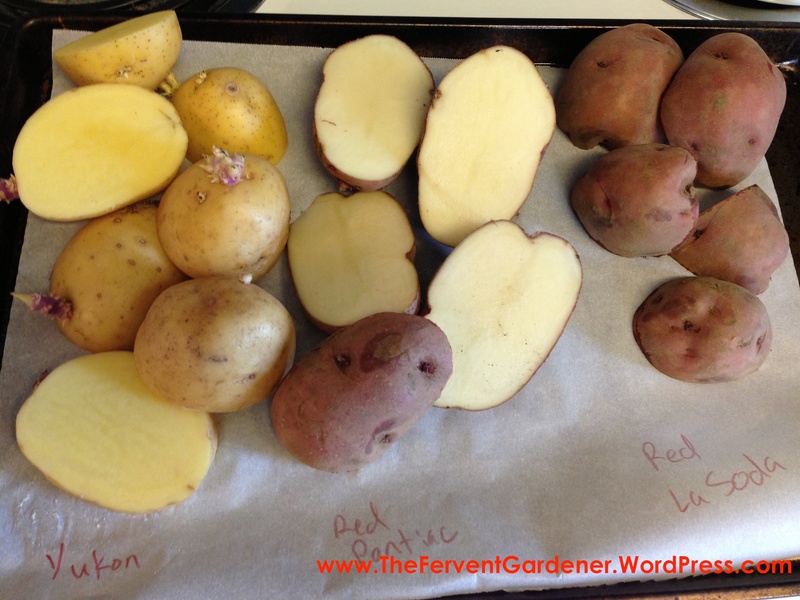 After I finished with the Yukon Golds, it was time to do the same with the red potatoes. 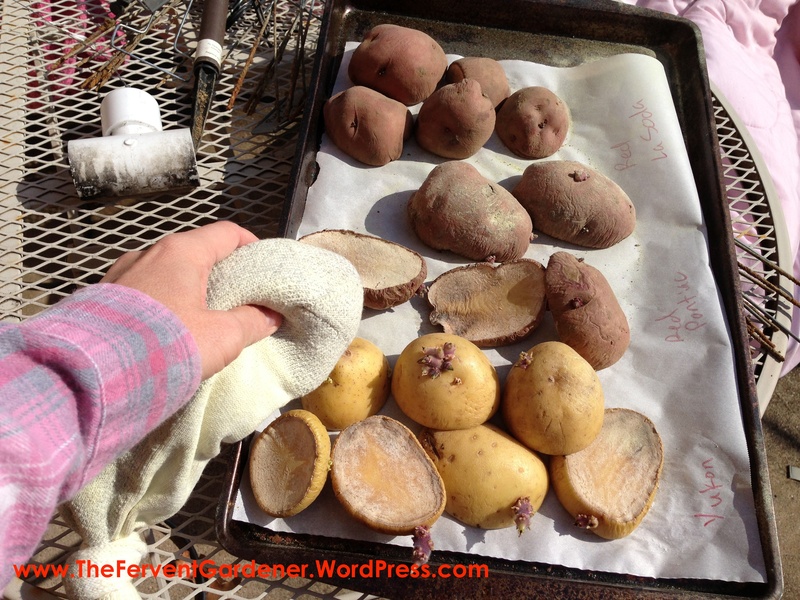 Next step is let your potatoes dry, or cure, for 3 or 4 days so the cut sides can scab over. I laid mine out on a baking sheet with parchment paper and wrote the variety names on that parchment paper so I wouldn’t loose track of which ones where which. You don’t want to put them in an airtight container since you want them to dry out at this point, not rot. While your potatoes are busy sprouting and curing, you can get their new home in the garden all ready for them. 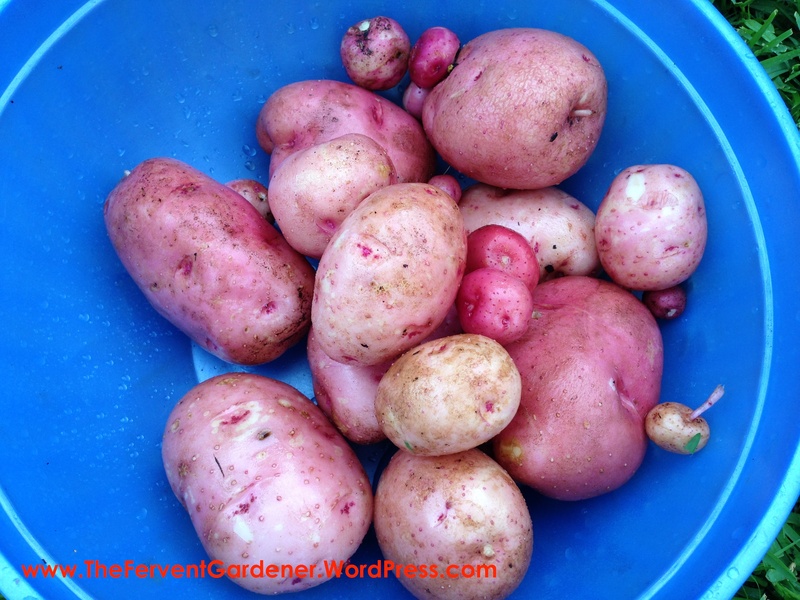 I decided to grow the two varieties of red potatoes in towers and plant the Yukon Gold in the ground – giving me a good comparison of the two methods. 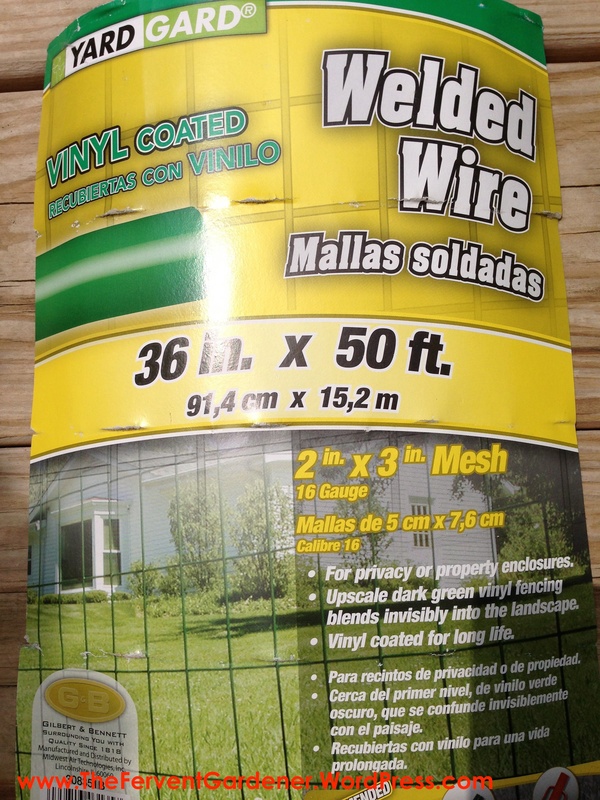 For the towers, I used part of a roll of this green welded wire. Here is a view of the label so you can see exactly what I used, but anything similar that is easy enough to form into a cylinder, but sturdy enough to hold it’s shape will do the trick. Figure out how large a cylinder you want to make, measure out that much of your wire mesh, and snip snip snip. Form your mesh into a cylinder and secure it. In the case of the mesh I used, I was able to secure the structure by bending in the ends of the wire on one side and wrapping it around the wire from the connecting side. I apologize for bad focus on the following picture…it’s kinda hard to take pictures and bend wire at the same time…and the dog is no good with a camera. You get yourself a nice big strip of burlap and measure it into a length slightly more than the circumference of your tower and about two feet tall. And roll it into a nice little tube of burlap. 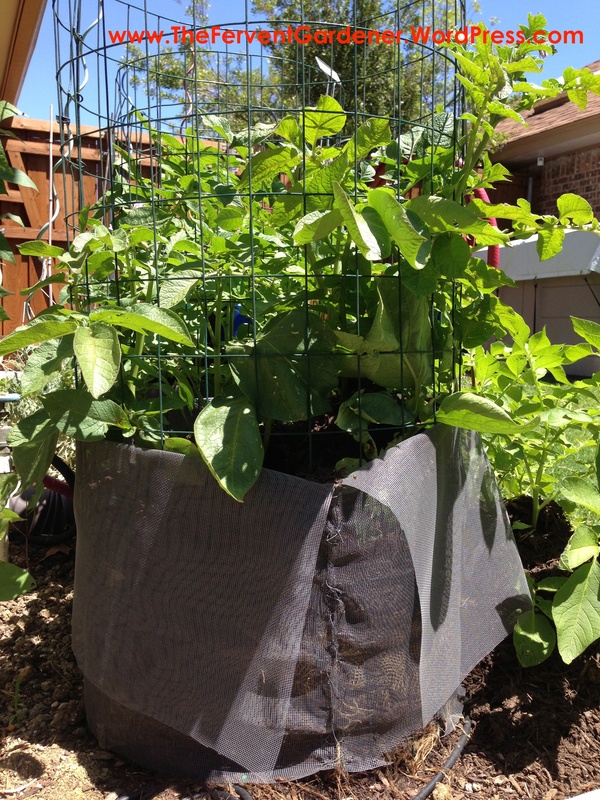 Put your potato tower in place, secure it will some sort of stakes, and put the burlap roll into the base of the tower, with the loose end facing down. 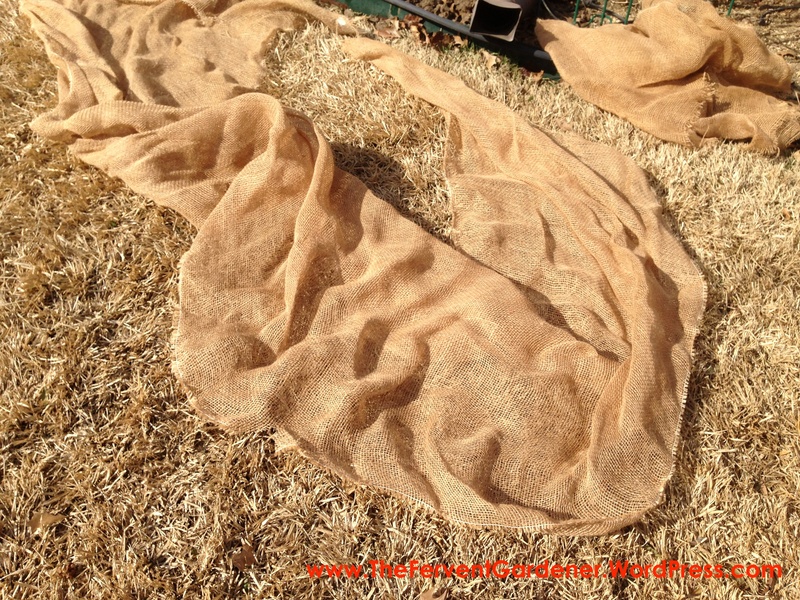 You want it arranged so that as you unroll the burlap up the sides over time, you unroll from the inside out. Part of growing potatoes, is hilling up dirt around the plants as they grow. 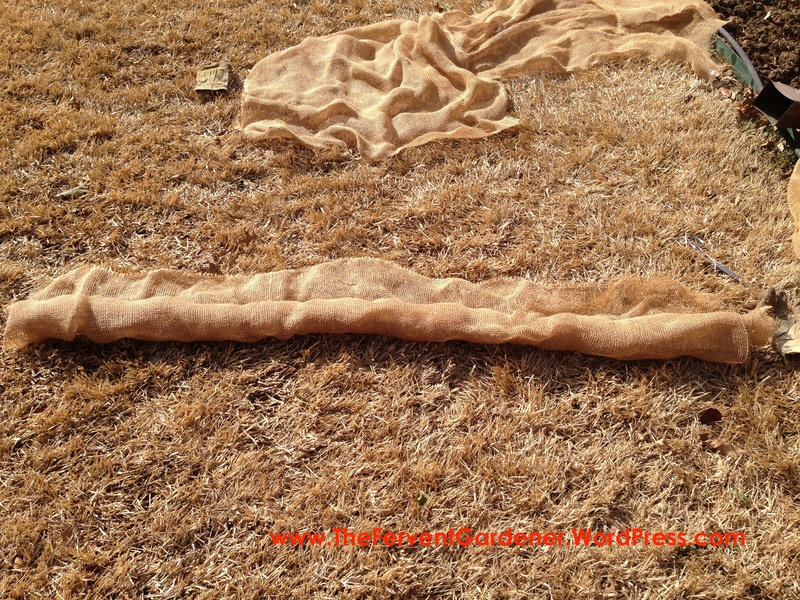 This burlap roll lets you do that without having to add new strips of burlap each time you hill. The plan is to tuck the end under the dirt at the bottom of the tower, and then as you need to hill up the dirt over time, you can just unroll the burlap up the inside of the tower and then add your dirt – allowing for maximum sun for your plants, and minimal effort for you as the dirt level needs to rise. Next, you add a layer of dirt to the bottom of the tower, securing the loose end of the burlap underneath it. Isn’t it adorable? Of course it is. Let’s talk dirt for a moment. 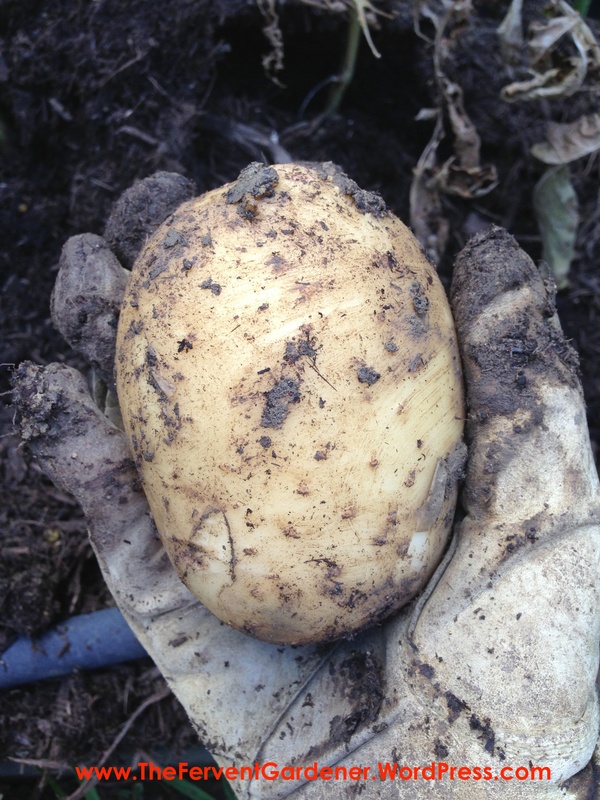 Potatoes need loose soil that is free of rocks, sticks, and other debris. One of the many reasons these towers are perfect is the fact that you can give your potatoes the perfect soil in which to grow. I used a mixture of Miracle Grow’s garden soil and a nice organic compost. Mmmm, delicious. Hopefully, by now, your potatoes are all sprouted, cut and cured. Just one more step for them before they nestle into their new garden home. They need a little dusting of sulfur. 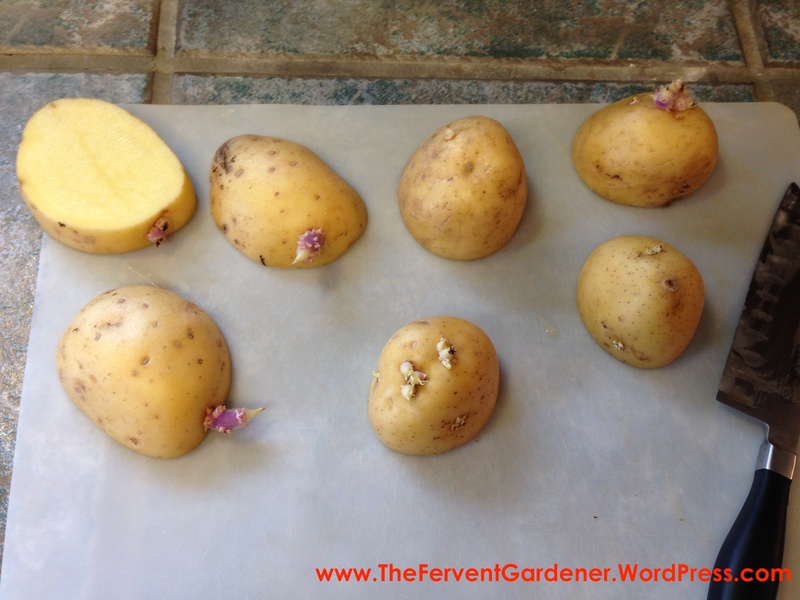 The sulfur will help protect your little seed potatoes from disease an help keep them from rotting. You can buy dusting sulfur at that same nursery where you bought your seed potatoes. I live in Texas, the land of the evil chigger. If you are not familiar with the chigger – lucky you – it is a nasty little insect that drills hole in your flesh that itch like nothing you have ever felt. I love to hike, which can take me to places inhabited by the evil chigger and give them a chance to climb up my legs and make my life miserable for days. To combat the evil chigger, I keep what is called a sulfur sock on hand – you fellow Texans know exactly what I’m taking about – to smack around my shoes and ankles before heading out into chigger country. It is basically a tube sock, filled with dusting sulfur, and tied in a knot at the top. I found my trusty sulfur sock to be the perfect way to dust my little potatoes with sulfur without risking damage to those cute little sprouts. Be sure to avoid getting the sulfur in your mouth or eyes, and wash your hands thoroughly after you have finished handling the sulfur. …and covered them with more of that tasty dirt. Last step was running my drip irrigation system into the towers…with enough slack to raise the emitters as the dirt level rises. The Yukon required a little more work. I needed to dig a trench for them in front of the towers. 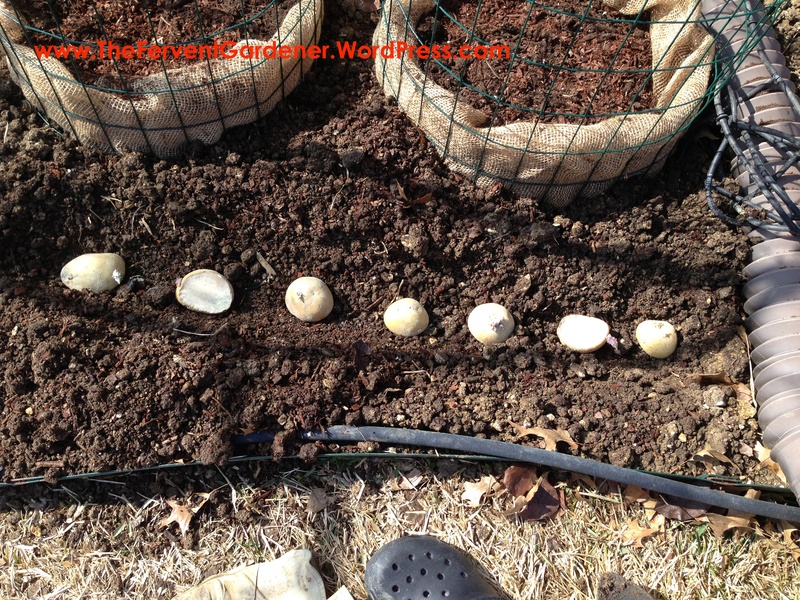 Once I had a nice trench, I placed my Yukon Gold potatoes in neat little row. They were then covered in the same delicious mix I used in the towers and were given water emitters as well. Potatoes like water, but need to stay well drained or they will rot – another benefit of the tower is it’s natural drainage. Alrighty. The potatoes are all planted…nothing to do now, but wait. The dog approves of our day’s work. Soon, sweet little baby potato plants will appear. Once they have grown up a good ten inches or so, you will want to start hilling – this basically just means adding dirt to your towers around the plants. 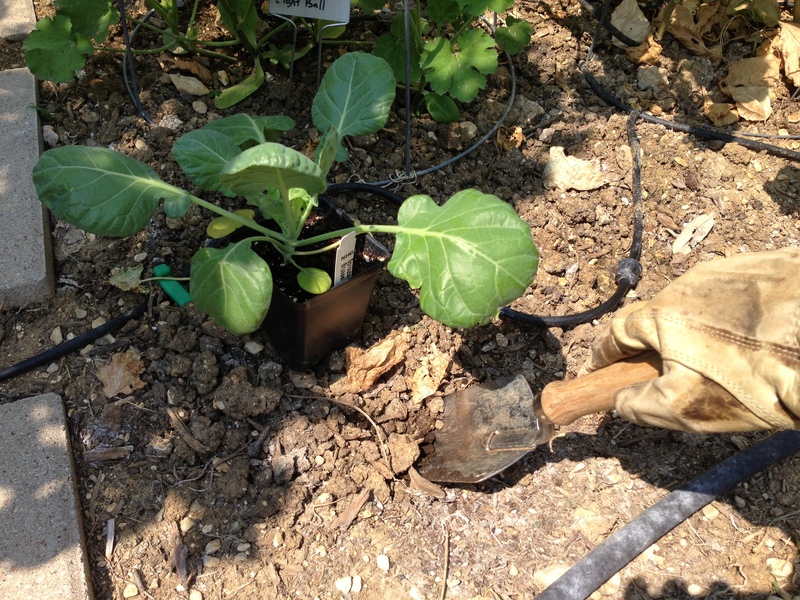 At the same time that I added soil to my towers, l hilled around my in-ground potatoes as well. 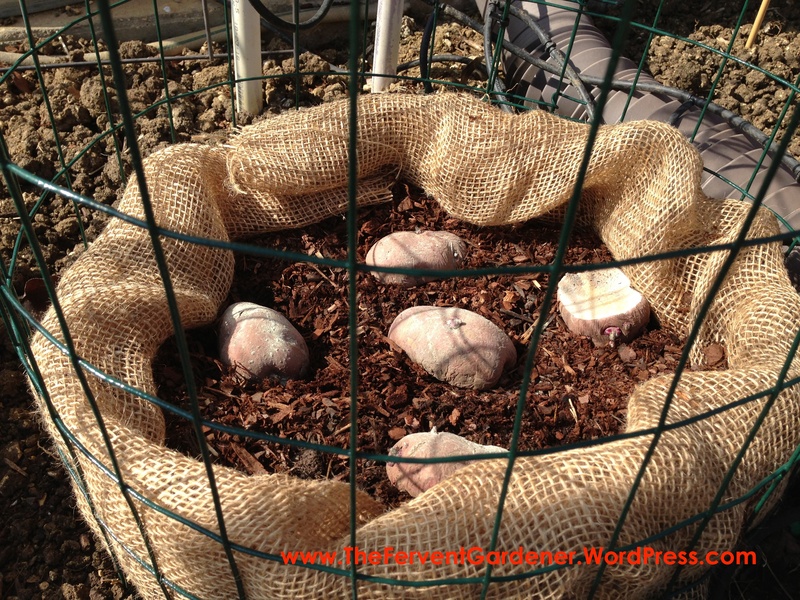 Your new potatoes will form from shoots sent out by the plants in this hilled dirt, so it is an important process. 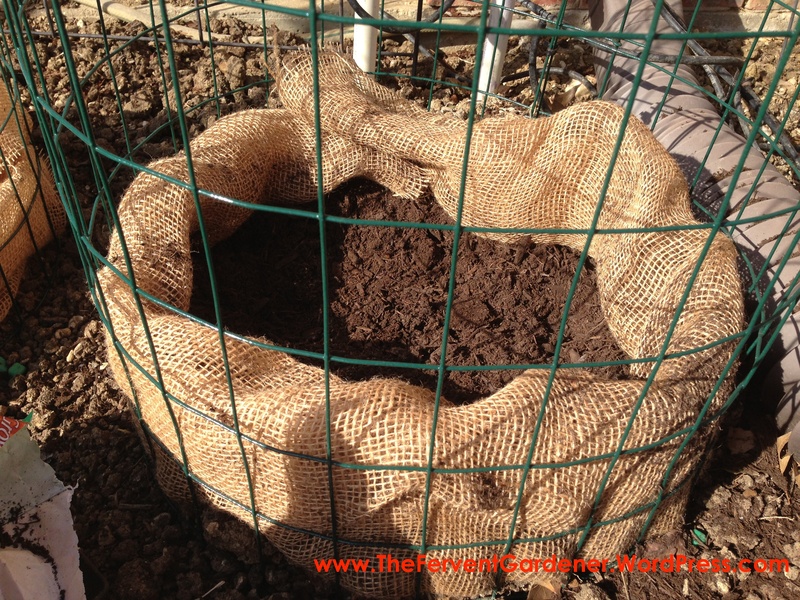 As you add soil to the towers, just unroll a bit of the burlap up the sides to hold the new dirt inside. Super easy with the towers. A little harder with my Yukons. It was a little bit of a challenge to try and make an effective hill in such a small space without the walls of the tower to hold the dirt in place. And sewed it on with wire. Take that, squirrels. It worked. For the record, the burlap would have worked perfectly if I hadn’t had thieves in my garden. Grrrr…..
As the plants grew, it became harder and harder to hill dirt around the Yukons in the small space, but hilling the towers was a breeze every time…just pour a little more dirt in and spread it around with your hand and move on to other garden adventures. 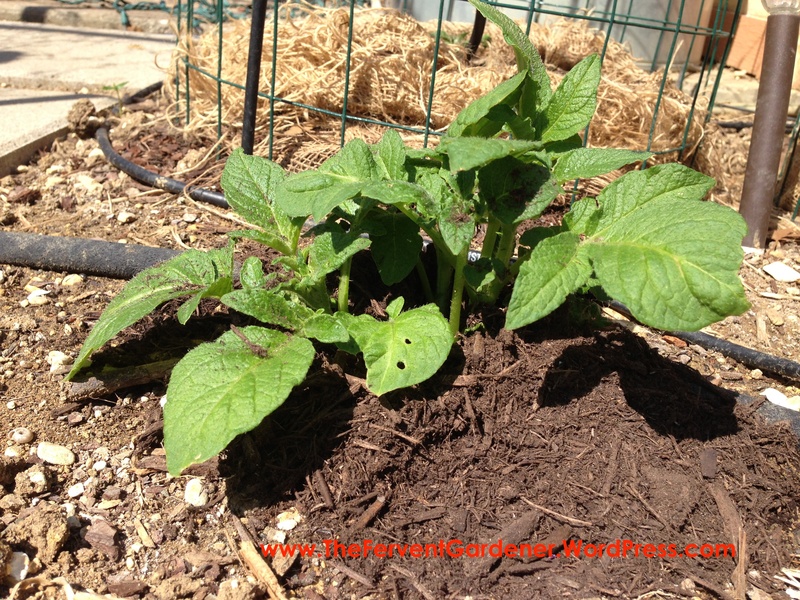 You continue to hill your potato plants periodically until they flower. When they start flowering is when they are also busy growing potatoes under the surface. So exciting. You can start sticking your hands down in there to hunt for baby potatoes a few weeks after flowering, or wait until a few weeks after the plants die to harvest larger potatoes. I chose to wait. 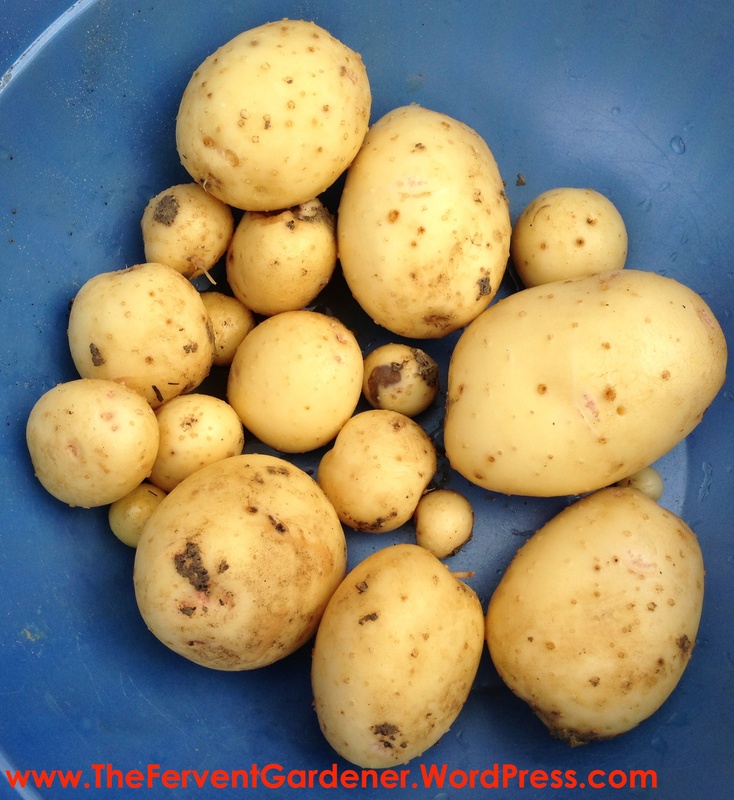 I harvested the Yukon Gold potatoes first, mostly because they were in front. The harvest went fine, but required a lot of careful digging to find all the potatoes without damaging any of them. With the Yukons out of the way, I just pulled up the stakes holding the towers in place…and tumped the first one over. And joy, oh joy, potatoes just spilled out the bottom. In short order I had dumped all the dirt out of the towers, collecting all the potatoes as I went. Easy breezy. Although I got similar yields from the towers versus the in-ground method, I found the towers to be a better solution for my small space. Easier to prepare the dirt, easier to hill, and WAY easier to harvest. And since the towers, themselves, survived the whole process without incident, they will be able to do this all over again next year! All that remains now is to get washed up and start eating! Bake them up and top them with roasted poblano peppers…also from your garden. Roast them with garden onions. Shred them, stir in a smidgen of olive oil, and cook them up in your waffle iron to make what I call Waffle Browns. Outstanding. However you like to eat them, with a potato tower, you can grow delicious potatoes in your garden even if you don’t have a lot of space. Would love to hear your ideas on space saving ways to grow potatoes, or your experiences trying potato towers. 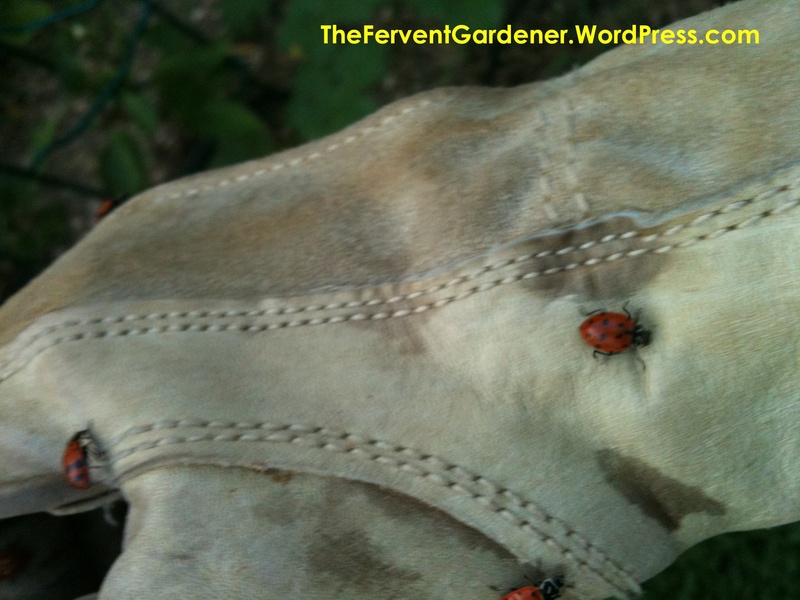 Lady bugs are awesome in general, but amazing when it comes to your garden. These little beauties love to snack on aphids, mites, and other nasty little soft bodied larvae that want to destroy all your hard work by slowly killing your beloved plants. That, and they are adorable. Since having lady bugs living in your garden can help keep some of those destructive pest populations under control and is just plain awesome, what should you do to make that happen? First off, try and attract them to your garden. 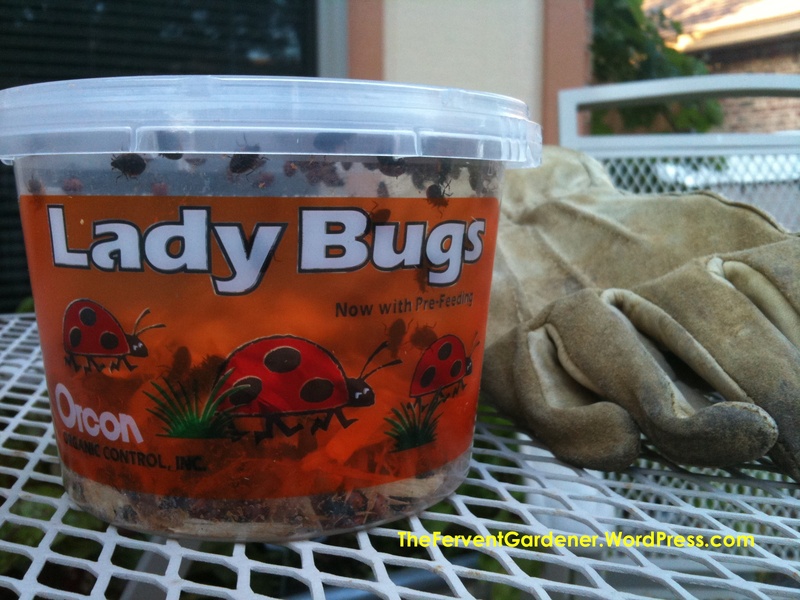 This is a good option if it is the first of the Spring season when the pests aren’t really an issue yet, or if you don’t really have a pest problem, but want to help prevent developing one by inviting the lady bugs to set up shop in your garden and eat up any bad pests as they arrive. How do you do that? 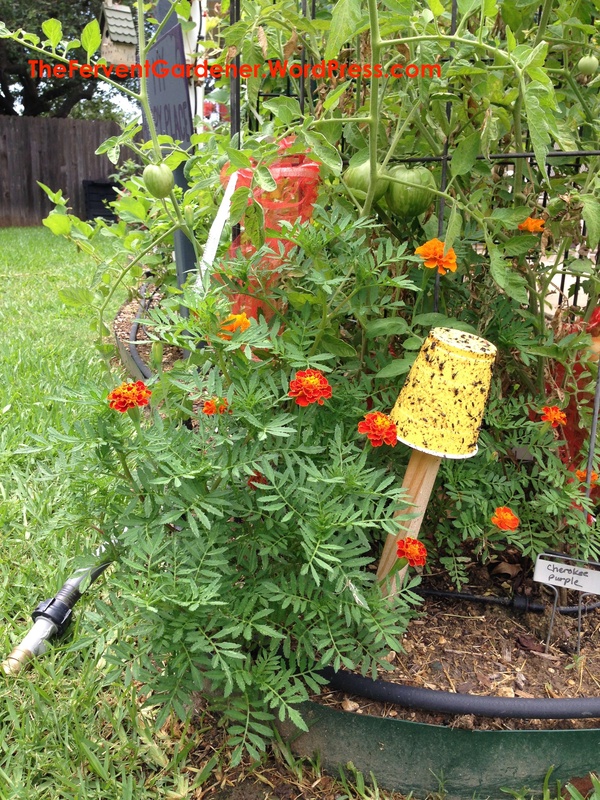 Create a safe place for your lady bugs to live and make sure they have water to drink and tasty pollen to eat. Give them those things and they will be hanging out in your garden ready to pounce on any aphids or mites that decide your garden looks nice to them, too. 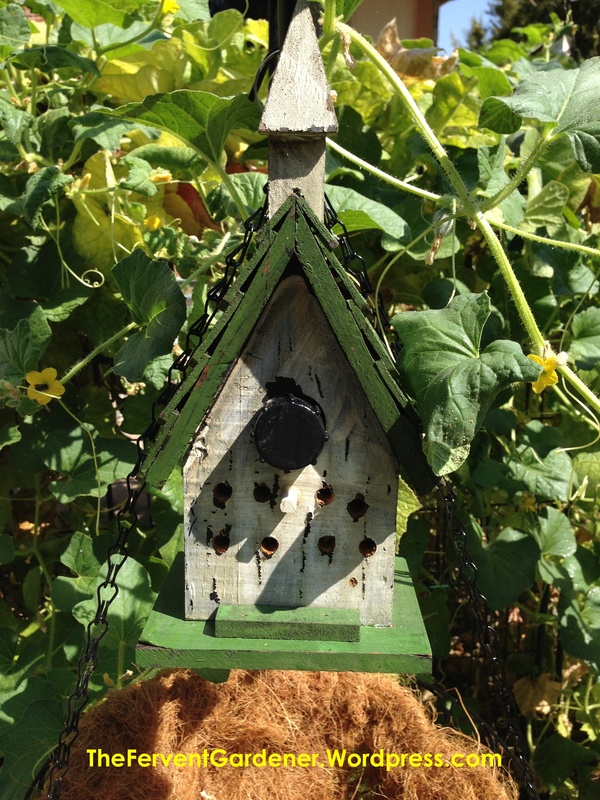 Housing: Lady bugs need a little cover…a nice safe place where birds and other predators can’t easily spot them. 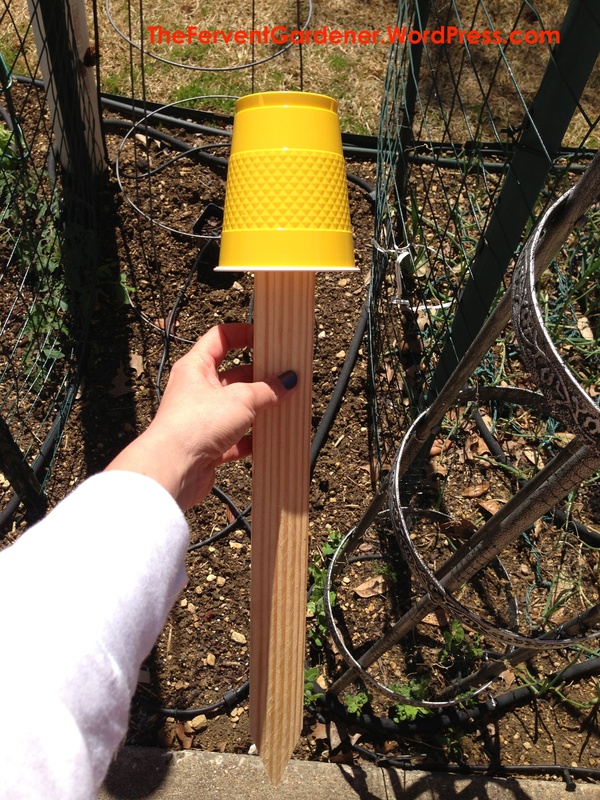 Mulch, foliage, tall grass, dense plants, etc… Or you can go and get all cute about it like I did and build a little lady bug house and hang it in your garden. I took a little bird house I had in the garage, covered the larger hole that was meant for birds (since part of what you are trying to do is keep the birds AWAY from your lady bugs), drilled smaller holes the lady bugs could use to crawl in and out, and filled the inside with straw. A few months after hanging this in my garden last year, I started spotting lady bugs climbing around on it, and this year, I saw lady bug larvae on it, so I am going to call it a success. Water: You need some source of water that the lady bugs can use. It doesn’t need to be a large source, and you don’t want something that will just stagnate and invite mosquitoes to move in and start having babies. I have a few misters in my garden that water certain areas and leave a few nice puddles of water every morning. The potted plants on the patio inside the garden area have saucers that overflow a bit each day to keep the water fresh, but collect enough to feed the small community of beneficials living out there. If you don’t have a naturally occurring source of water, you could create one or set out small saucers of water – just make sure you freshen the water frequently. Pollen: FLOWERS!! Flowers in your vegetable garden are a good idea all the way around. Many of them deter bad bugs, and attract and feed the good ones. And then there’s the part where they are lovely to look at and smell nice. Having the right flowers in your veggie garden will draw the lady bugs to the area in the first place, and then when they see all the other lovely accommodations you’ve made for them, they might just stick around and settle down for a while. They like lots of different kinds of flowers: dill, fennel, yarrow, zinnias, cosmos. My personal favorites, and the ones I have in my garden each year are Alyssum, Sunflowers, Peas and Marigolds. 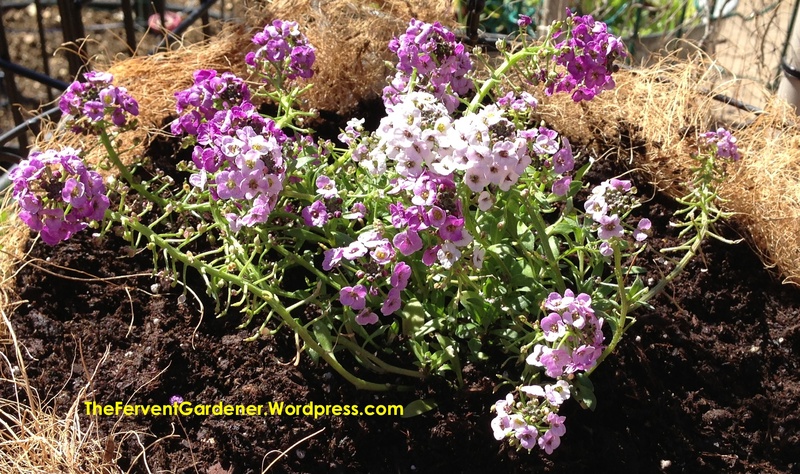 Alyssum is a sweet little flower that comes various shades that is low growing. Not only do lady bugs find this flower delicious, but so do the pollinators like bees and butterflies. I have this in a hanging basket on the edge of my garden – a tempting treat to draw lady bugs and the pollinators to my garden. 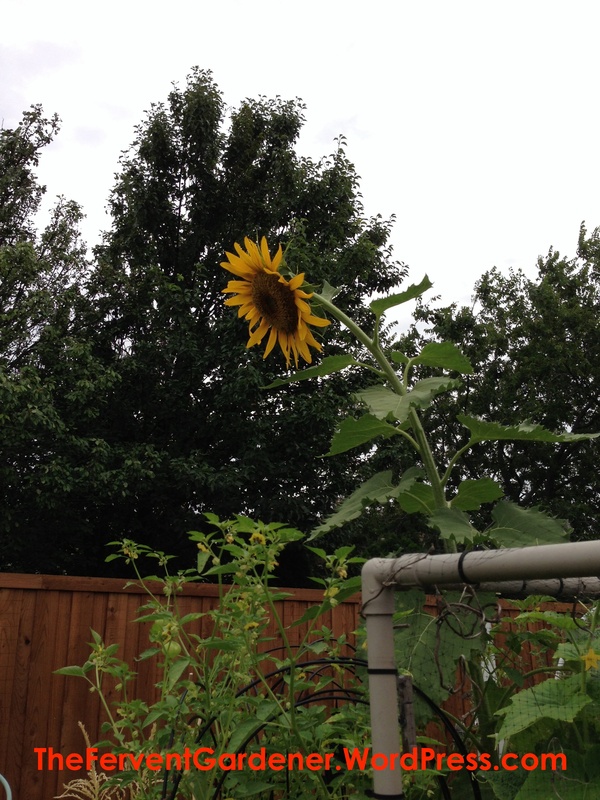 Sunflowers are a fun addition to the garden. If you plant a tall variety, they will tower over your garden during the peak of the summer with their bright happy faces. Much like the Alyssum, bees love these flowers, too, and will be pleased you planted them. 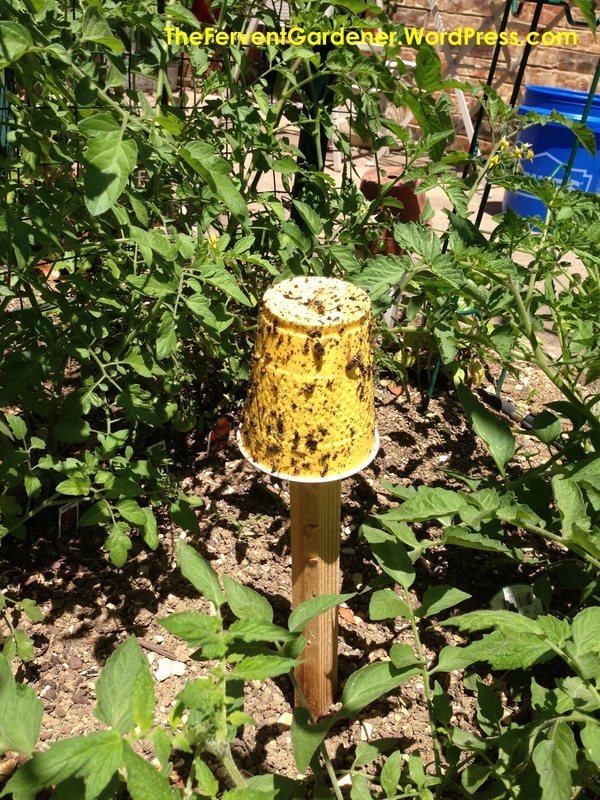 If you plant them near your cucs, it can improve the cuc’s flavor – a nice prize for feeding the bees and lady bugs. And one more happy benefit of planting this sunny flower for your lady bugs is that you can harvest and eat the seeds! Yummy! 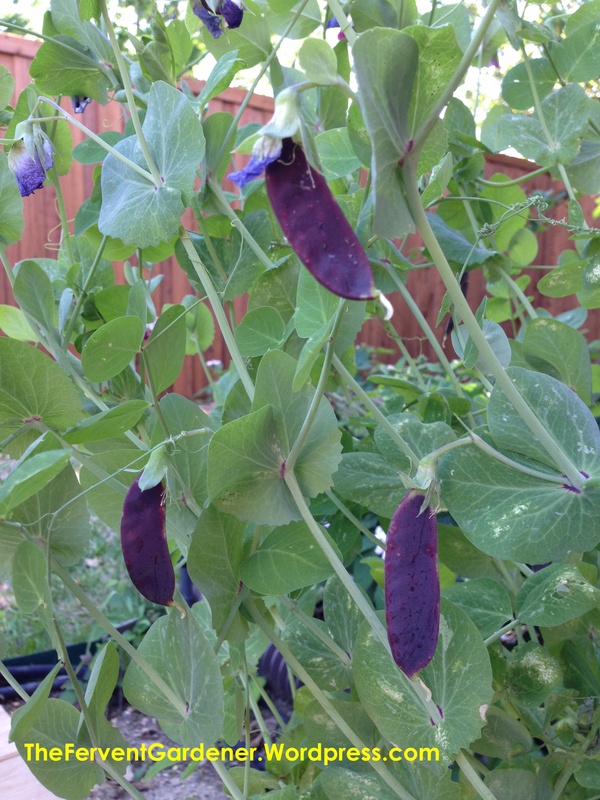 Pea plants form sweet little white flowers that turn into pea pods – or in the case of the picture above, purple flowers that become purple podded peas. Lady bugs love to snack on the pollen in these delicate little flowers. And then, of course, you get peas out of the deal. What a delicious bonus! Now let’s talk about Marigolds. 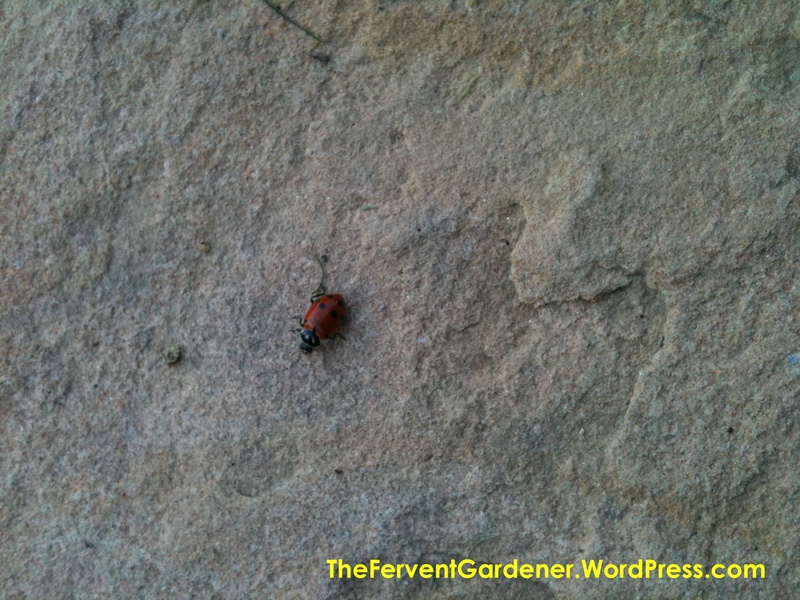 I consider these little guys one of the powerhouses in my fight against garden pests. One year my tomato plants were devastated by aphids. I was heartbroken. In my desperate search to find a solution, I read that marigolds help protect your tomatoes, and other plants, from the evil aphid. I tried them the next year and it worked. Now I plant these mighty warriors around the base of all my tomato plants every year…and have no issues with aphids at all! Then you have the added benefit that they are one of the pollens your lady bugs are fond of – everybody wins. If you plant the tasty flowers, provide water and a place to live, hopefully the lady bugs will show up all on their own. But if you haven’t managed to attract them naturally, and find you are having a pest problem they can help with, you may need to pop down to your neighborhood organic nursery and pick up a little tub of them to release in your garden. 1. If your pest problem is truly out of control, the lady bugs may enjoy the feast, but it probably won’t be in time to save your plants. 2. 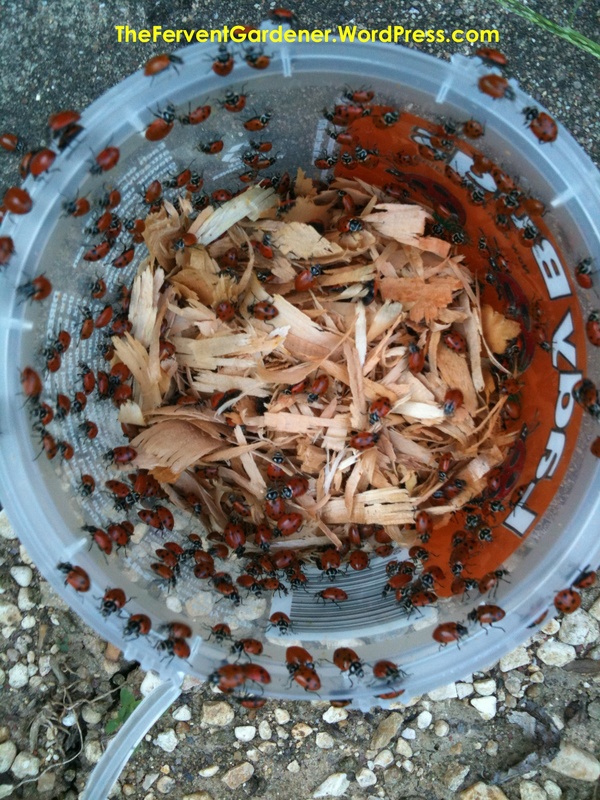 Once you release the large number of lady bugs that come in the container, you still have to have an environment where they want to stay. If there isn’t sufficient food, water and shelter, they will just head on out as soon as they can. Many many of them will leave anyway, but if your space is lovely to them, hopefully enough will stay to help combat your pest problem. 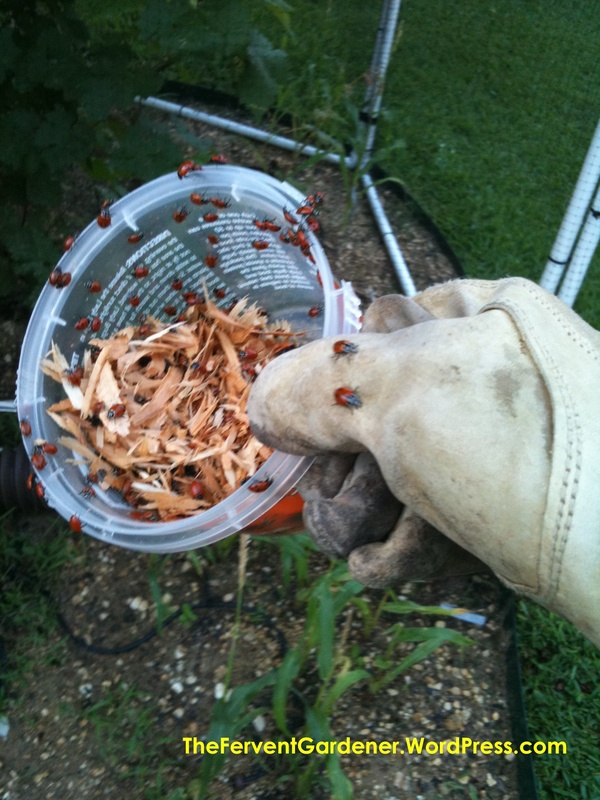 That said…let’s release some lady bugs! Keep the tub in the refrigerator until you are ready. Wait until evening, and then water your garden well so there will be plenty of water for them to drink as they warm up and start moving around the space. I have read in several places that one way to get them to stay in the garden and not fly off right away is to spray them with sugar water so they will be too sticky to fly off and will already like your garden and want to stay by the time they can fly – I’ve never done that and have no idea if it works or not. Once you take them out of the fridge and open the tub, they will start to warm up and move around. My approach was to walk around the garden and sprinkle them in different places so there wouldn’t be too many in one spot competing for food and water. Warning: they WILL crawl out of the tub and on to you – like something out of a horror film. Since they don’t bite or do anything harmful, this isn’t a big deal unless bugs crawling on you freak you out. Luckily someone had warned me about this part and I had prepared myself emotionally. They are adorable, after all. Once all the lady bugs have been released into the garden. Find yourself a comfy spot to sit down…and wait for all the lady bugs that made it inside your clothes, to wander back out. At this point, the ladybugs should start doing their thing – wandering around your garden chowing down on tasty treats like aphids. Two days after the batch pictured below got to snacking, I couldn’t find a single aphid left in the garden. Good job, Ladybugs! 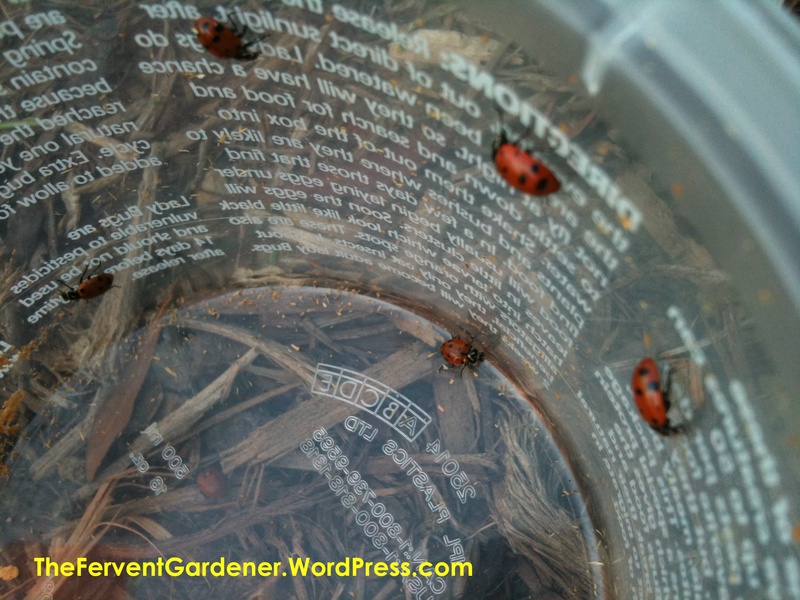 If you have been successful in getting a few lady bugs to make their home in your garden space, then it is very important that you learn to recognize not just the adults, but the eggs and larvae too. You certainly don’t want to undo all your good work by accidentally squishing the eggs or freaking out and killing the larvae as they bop around on your plants. Here are a few photos courtesy of Michael Botos (http://www.botos.com/weekly/ladybugs.html) that will show you what your lady bugs look like before they are all grown up. Lady bug eggs are bright yellow ovals that are clustered together and standing on one end. And the larvae look like ugly little alligators. If you see these little guys in your garden you will know you have done a good job making a happy place for lady bugs to settle in and build a family. Hooray for you! The last point I would like to make about lady bugs concerns pesticides. If you are looking to control pests with lady bugs, then chances are good you are already committed to an organic approach in your garden. But in case you are tempted to use pesticides, keep in mind that they will kill your lady bugs and other beneficials as well as the bad bugs you were trying to get rid of. Hope this helps you lure and keep these beautiful little aphid eaters in your garden! I love strawberries. I know what you’re thinking, “Laura, you are a vegetarian with a garden…you love all produce, don’t you?” Why, yes, I do…but berries rank among my most beloved. Here in Texas it is hard to grow my very favorite, the blueberry, because it gets a little too hot for those little blue gems. But strawberries love it here. And strawberries are delicious! The challenge for a gardener with limited space, like me, though, is that to get much of a harvest, you have to devote a good deal of space to your strawberries. And since space is something I don’t have, but strawberries are something I MUST have…I went vertical and built strawberry towers. Above is picture of those lovely towers last Spring, shortly after the berries were planted and were just getting started on growing. As you can see, you can cram a whole lot of berry plants into a very very small garden footprint with these babies. Below is a closer shot of how they looked a little later in the season when they were growing strong and producing berries. Is your mouth watering yet? Mine is…hmmmm….berries….okay….focus, Laura. If you are still reading, I’m guessing that means that you are interested in these tasty towers, so I will now do my best to tell you how I built mine. The pipe itself is PVC drain pipe. 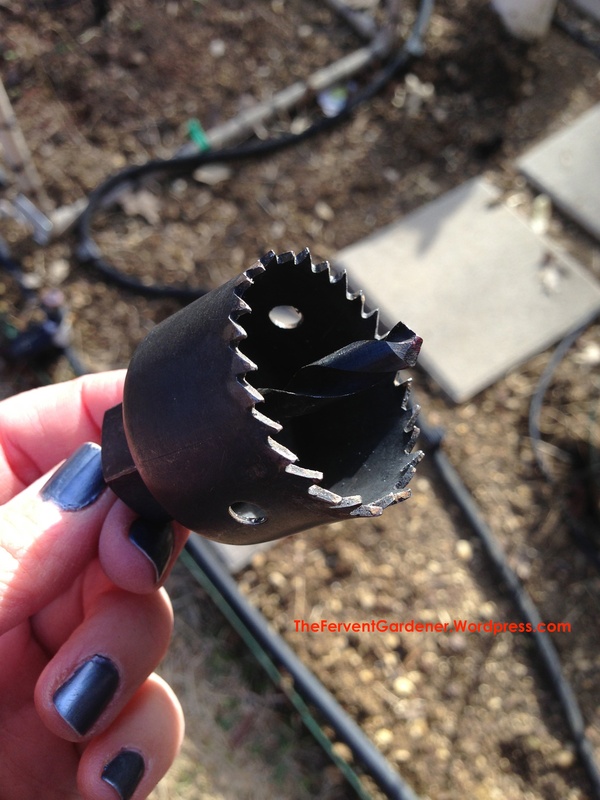 I used drain pipe instead of standard PVC because it is thinner – giving a dainty flower like myself a shot at cutting all the necessary holes in the pipe with minimal cussing on my part. I cut my pipe to about 8 feet in length so that after I buried about 16 inches of it, I would still have over 6 feet of strawberry tower. I see no reason you couldn’t leave the pipe whatever length you purchase, if you want to carry a ladder out to reach the top berries, or if you are really really tall. Here is the pipe before I started work on it. Hard to believe that, soon, this plain, boring tube will be the home of sweet deliciousness. Okay…next you need to cut all the holes for your berries. You don’t want the holes so small that it is hard to get the berries in, and not so big that you have a hard time keeping all the dirt from running out. I used a 1.5 inch hole saw and it worked just fine. I’ve had the towers for two seasons now and feel that size is just perfect. If you aren’t familiar with holes saws, here is a picture of the one I used. 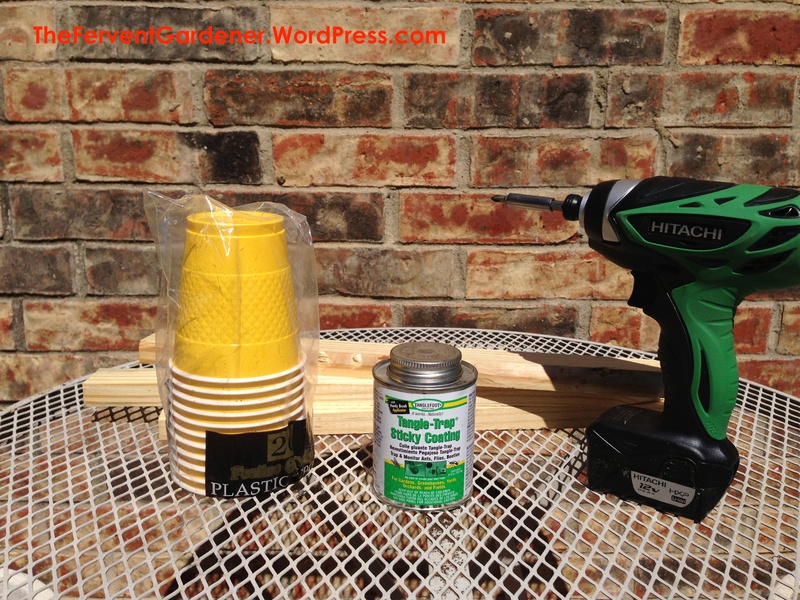 It fits onto a drill just like a regular drill bit, and you use it just like a drill bit. Now you drill holes. As you can see, I offset my holes so I could fit more on the pipe and not weaken the whole thing by having them too close together. 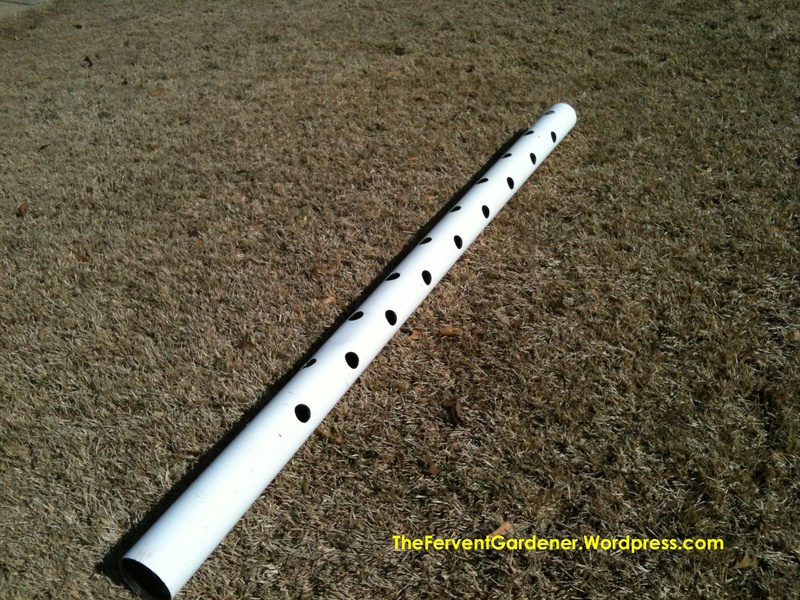 I also put holes on only three “sides” of the pipe since I knew that the remaining “side” would not be facing the sun. Tada! Pipe with holes. Notice that I didn’t put any holes in the bottom end – we will be burying that part in the ground, so it doesn’t need holes. I allowed for 16 inches to be buried, since I wanted my towers to be good and sturdy. Here they are buried in the garden. 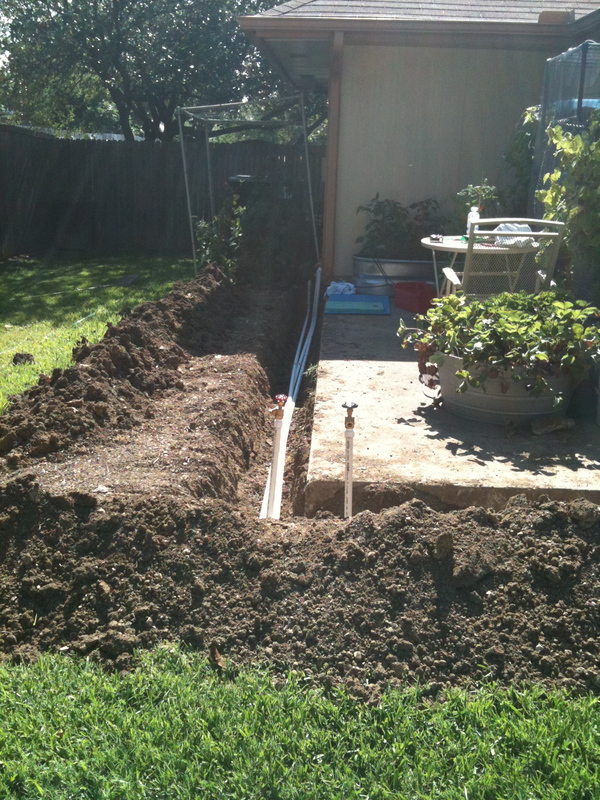 For each one, I dug a deep hole, stood the pipe in the hole, and then tightly packed the dirt in around it. Now, before we fill those towers with dirt, let’s talk about watering. 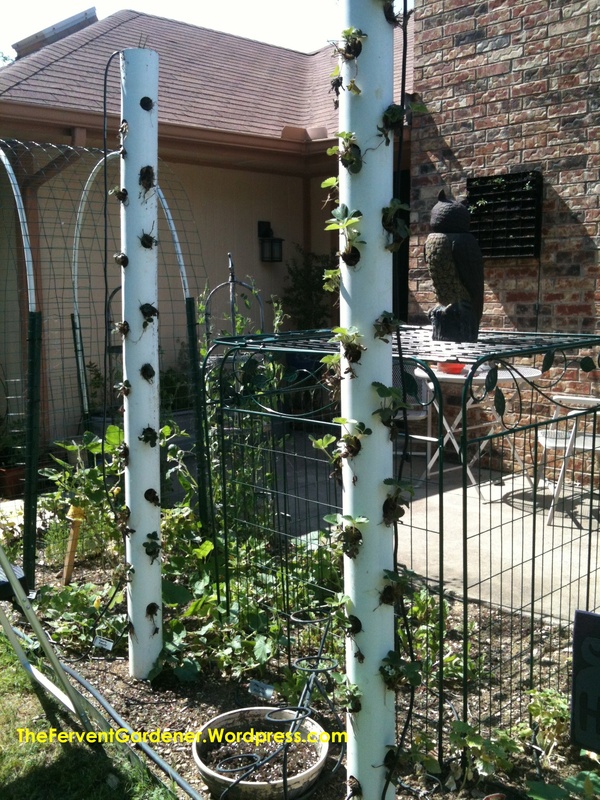 The nature of the towers makes them very difficult to hand water, and since adding a watering system to the inside of the pipe would be close to impossible to do AFTER the strawberries are in place, the time to put something in is after they are standing, but before you add dirt and plants. I am sure there are many awesome and creative ways of handling this problem – here was my solution. 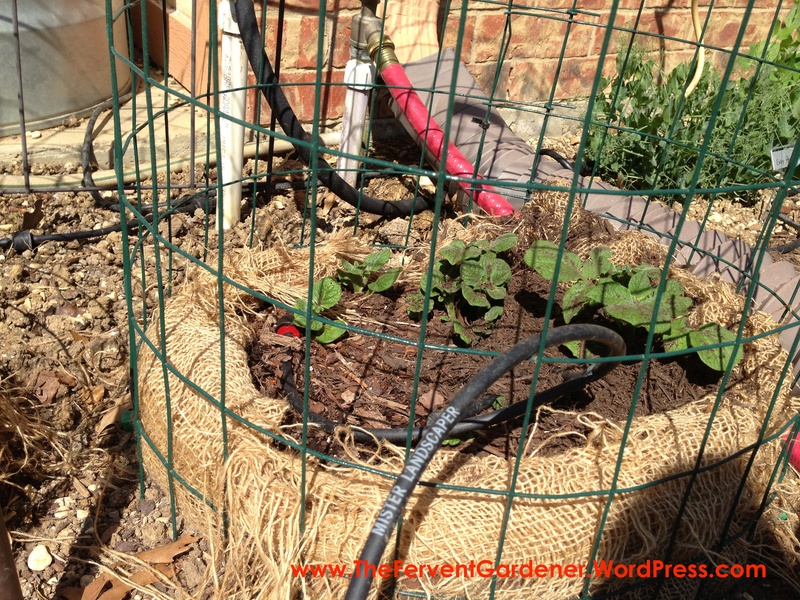 I use a drip watering system for my entire garden. 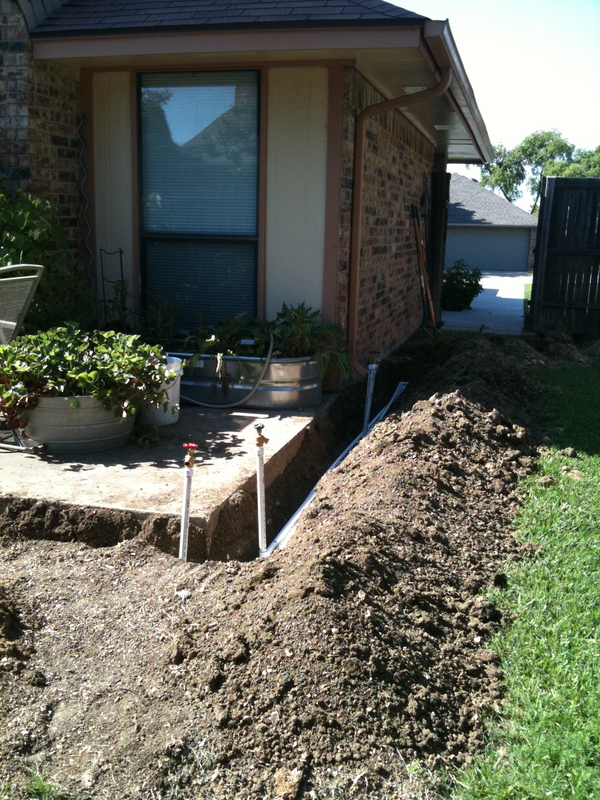 If you wander the aisles of your neighborhood home improvement store, you have probably seen all the parts and pieces for a drip system over near the plumbing and sprinkler parts. If you saw my earlier post about how I put in my garden (if not, click here), you saw all the PVC we added to run water right to the plants. Several of the valves that poke up out of the ground in my garden run on a sprinkler timer – and it is to these valves that I connect my drip system. You have to connect a pressure regulator to the water source to reduce the water pressure so it can flow into the small tubing of the drip system without blowing the whole thing apart, and then you need the adapter that reduces the size from a hose fitting down to the small tubing size – you can see both attached to the valve in the picture below. 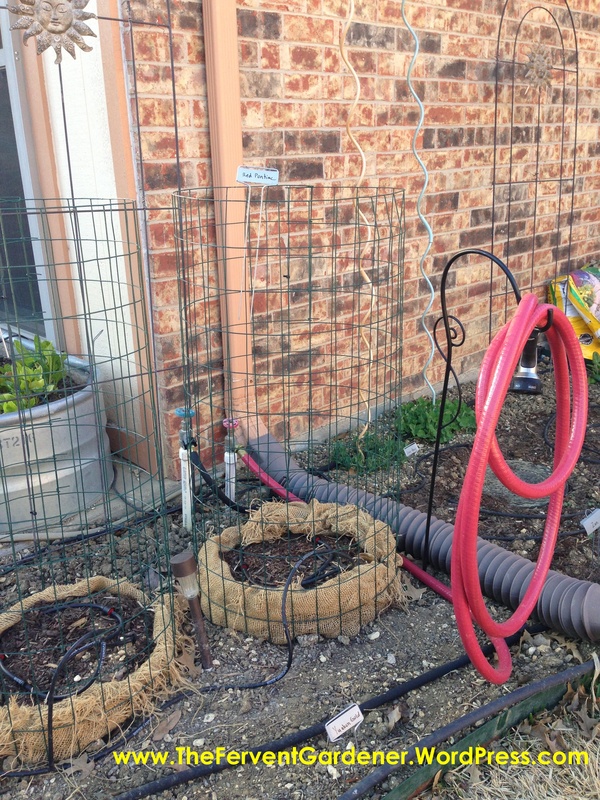 The little black tubing you see in the picture then carries the water all around my garden to all the little fruits and veggies -with small emitters at each plant. 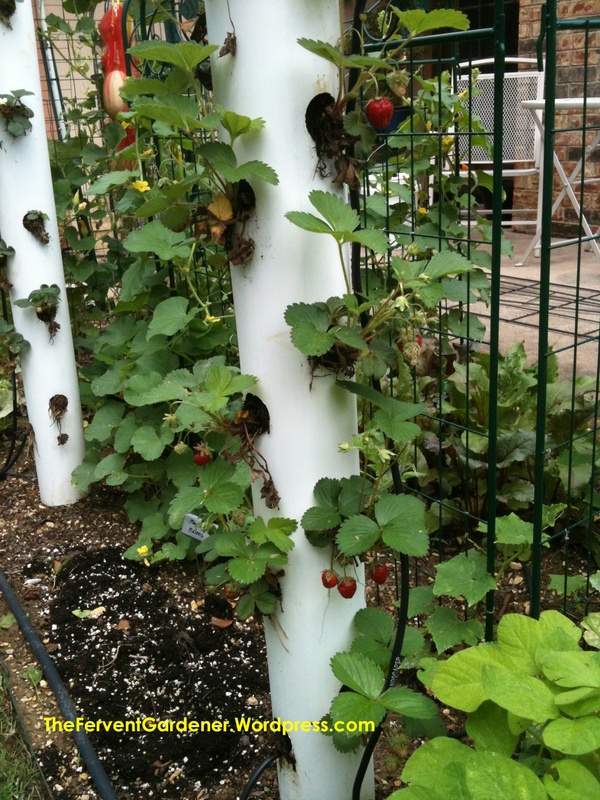 For the strawberry towers, I found they make a soaker hose that fits with this system and knew that it would be perfect to run down the inside of the towers. A teeny tiny soaker hose. Isn’t it adorable? 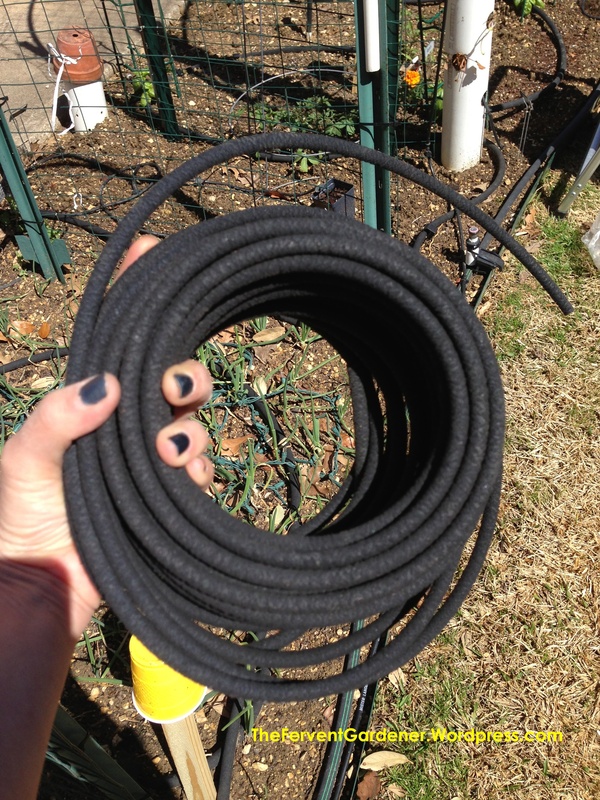 I attached the solid black tubing to the watering system, ran it up the outside of the towers, connected it to a length of soaker hose that I ran down through the inside of the pipe, and then used one of the system’s little plugs to cap the end of the soaker. Here you can see what the connection at the top look like – a little dirty, but you get the idea. 1. You do want to run the water up to the top of the tower with the solid hose and let it run down the inside in the soaker hose. If you try and run it from the bottom, it is very hard for the water to make it all the way UP in the soaker hose. 2. Because it takes a lot of pressure to push the water up even the solid hose, it will need a home run of it’s very own – meaning that there should not be any other emitters on that line from the time it leaves the water reducing adapter. You CAN use Y adapters off the main valve to create more water pathways – each with their own pressure and size reducing adapters – but the towers should each get their own run after those pressure and size reducing adapters. 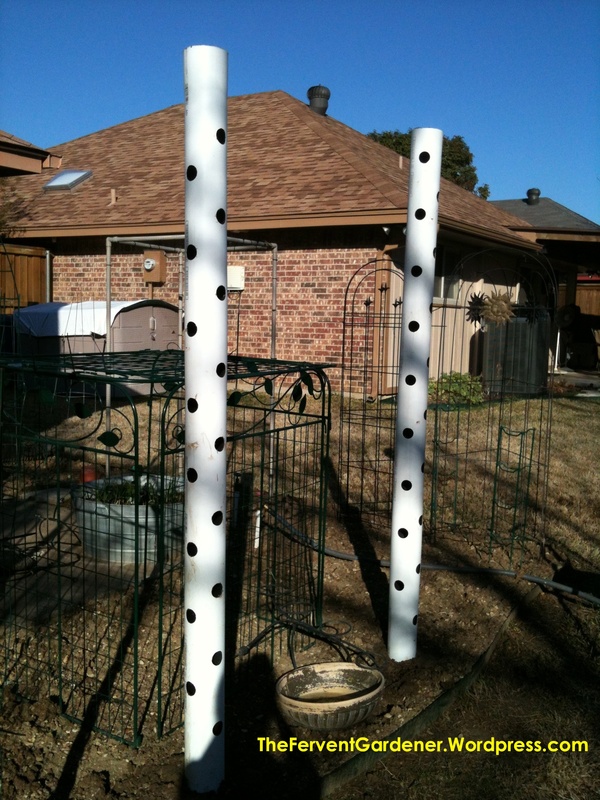 Okay…so the towers are drilled, standing, and have a watering system…time to add dirt. I wish I had pictures of this next part, because they would be funny, but all hands were needed to handle the tricky business of getting dirt in the towers…and getting it to stay. Since part of my main concern with the towers was them drying out too quickly, I used a moisture control potting soil mixed with compost as my filler. Wearing protective eye-wear, I put my hands over the holes at the bottom of the tower, while Todd poured the soil mixture in the top. It was messy and hilarious. 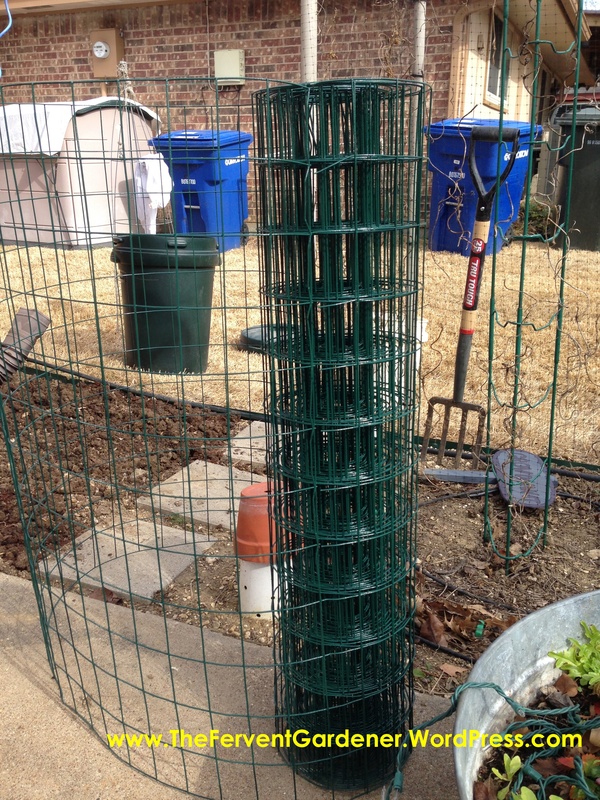 As we filled, I moved my hands up the tower to cover the holes as best I could – soil did spill out the various holes as we went, but in the end we got the job done. The mixture was slightly damp as we put it in, which helped keep it from just pouring out the holes – you wouldn’t want the mixture really wet, but slightly damp did seem to be a benefit. First order of business is to find the rubber band holding that bundle together and give it a little snip. 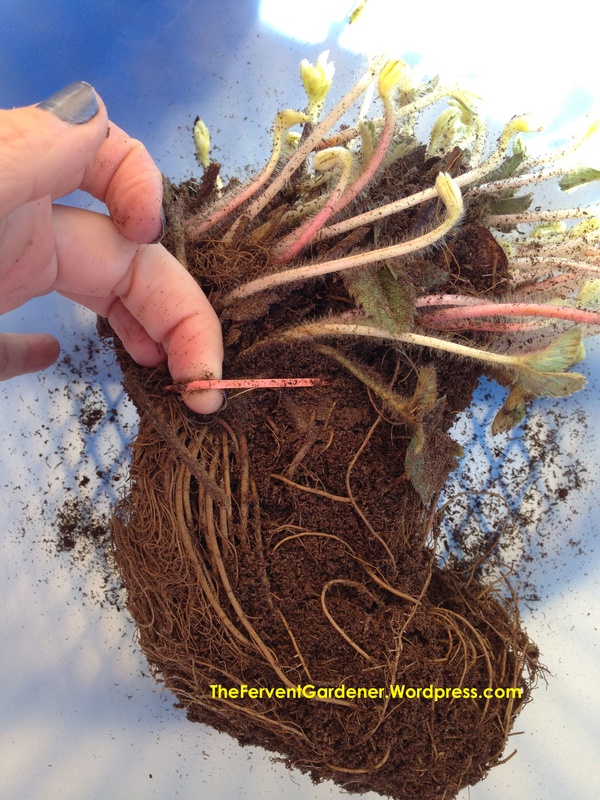 Next, you need to break the bundle gently apart into it’s separate little strawberry plants. 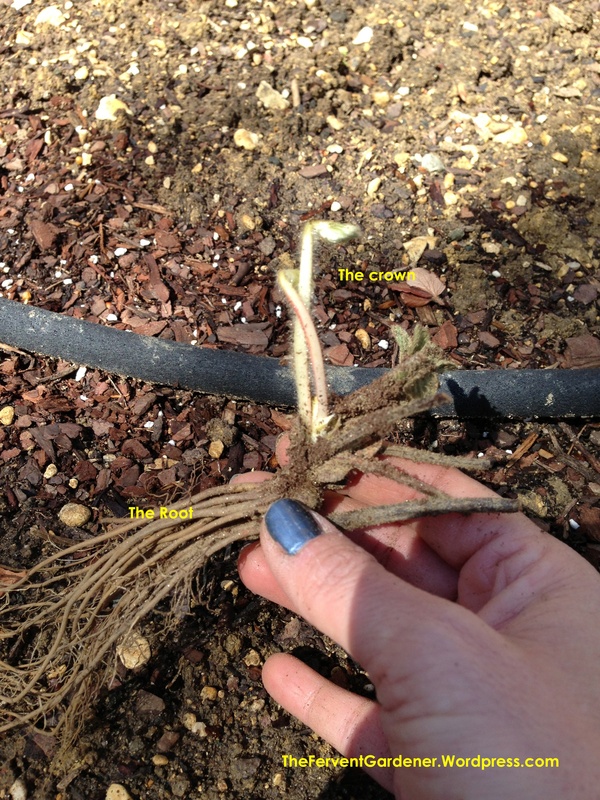 You will need to identify which is the root end, and which is the crown of the plant. With these healthy specimens I got from Henry Fields, that is pretty easy to do. Now for the actual planting process. 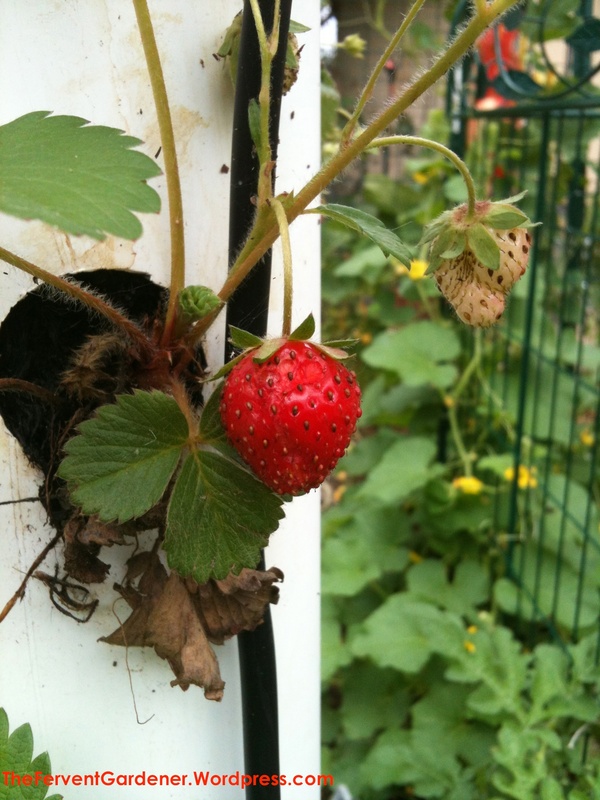 You take your cute little bare root strawberry, use your fingers to dig a spot for it inside one of the holes in the tower, then gently stuff it in the hole root first, using your fingers to snug the soil around it until all that is sticking out of the hole is the crown of the plant. 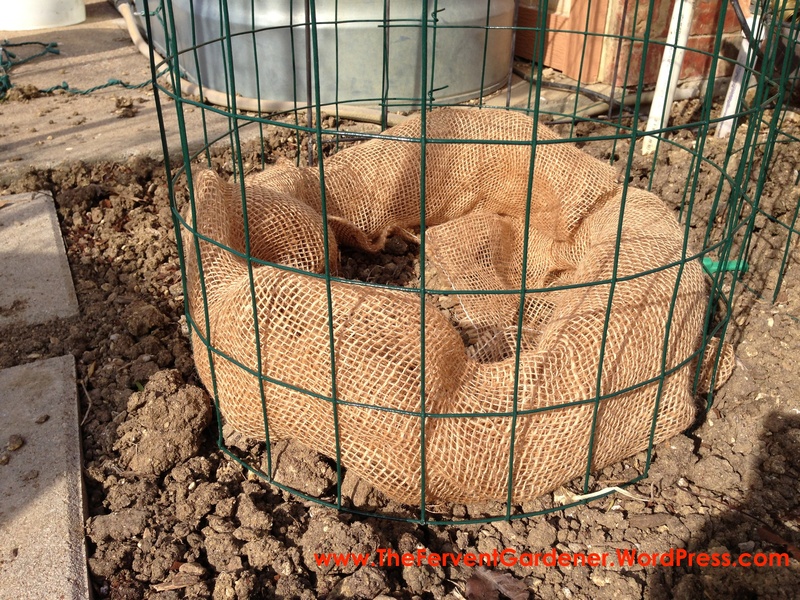 To keep the dirt and the plant from just falling out of the hole before it’s had a chance to stretch out and root itself, I use strips of burlap. Just cut a little strip of burlap, wrap it around the base of the plant and tuck it in the hole. 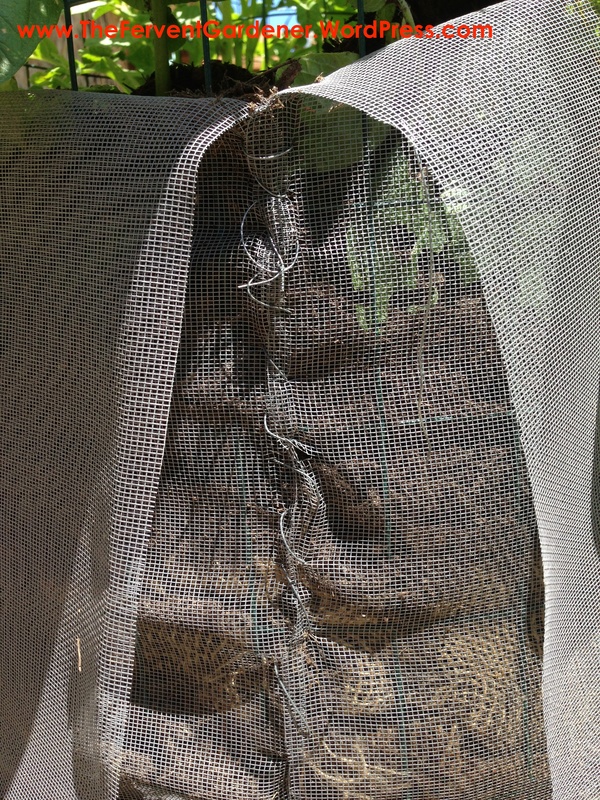 By the time the burlap deteriorates, the plant will be established, and the soil will stay in the hole. 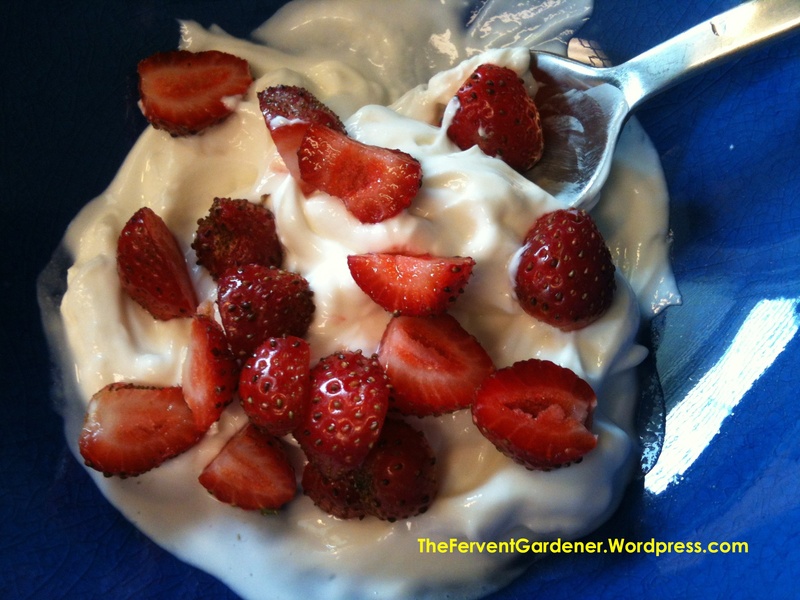 …you will have fresh berries coming out of a very small footprint in your garden. To add fertilizer to the tower in coming years, you can just tuck a few alfalfa fertilizer pellets in each hole, or squirt a little compost tea in each hole. Easy Peasy. Good luck! Now get out there and garden! 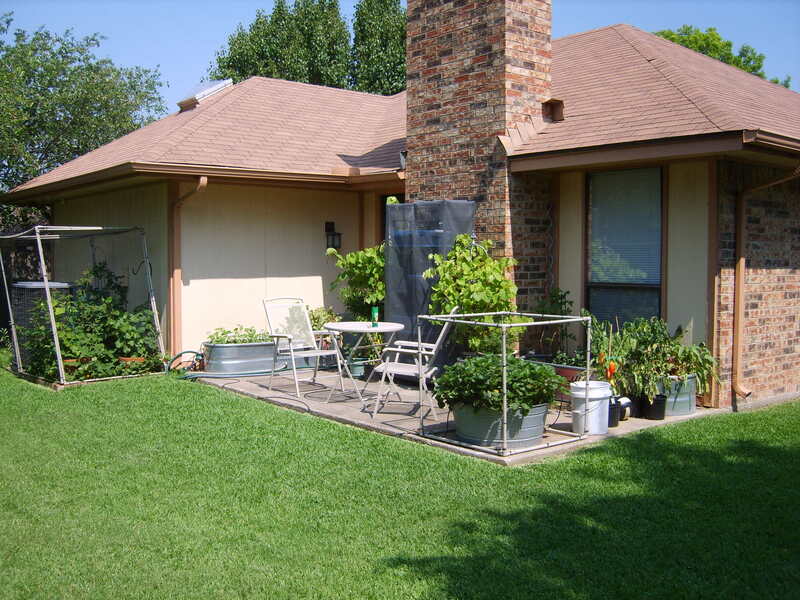 With it still being Winter in Texas, this is no time to be thinking about a Spring garden, right? Wrong…oh so wrong. If you already have a garden space, it is time to be planning what you will be planting this year, prepping your garden, and planting things like onions. If you don’t already HAVE a backyard garden, but are thinking of starting one this year, and I hope you are, it is time to start planning AND building. 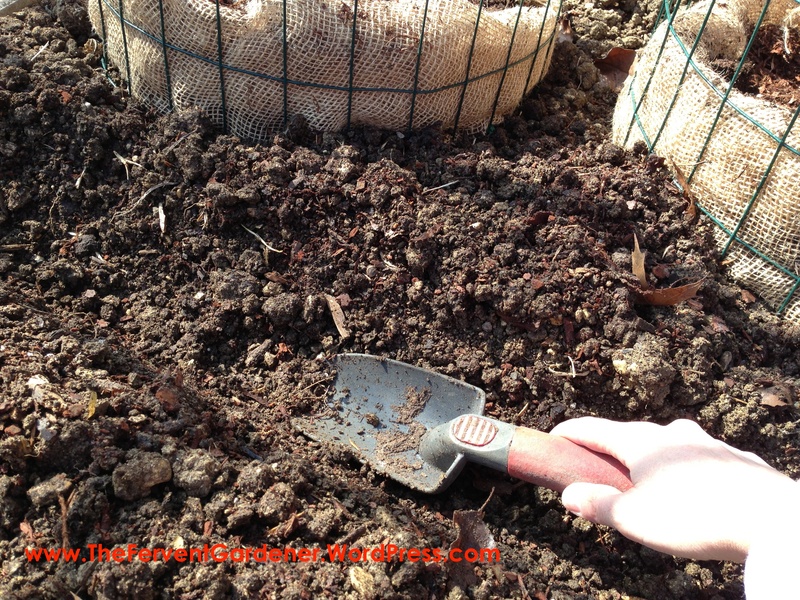 The success of your garden depends greatly on the quality of your soil and proper planning of what to plant where, so you don’t want to wait until it’s time to plant and rush though the prep process. So what kind of garden should you go with? When it comes to backyard gardens there are many directions you can go: container gardening, raised beds, in-ground, or a combination. Containers are good for small spaces, but need a lot of water in the heat of the Summer. 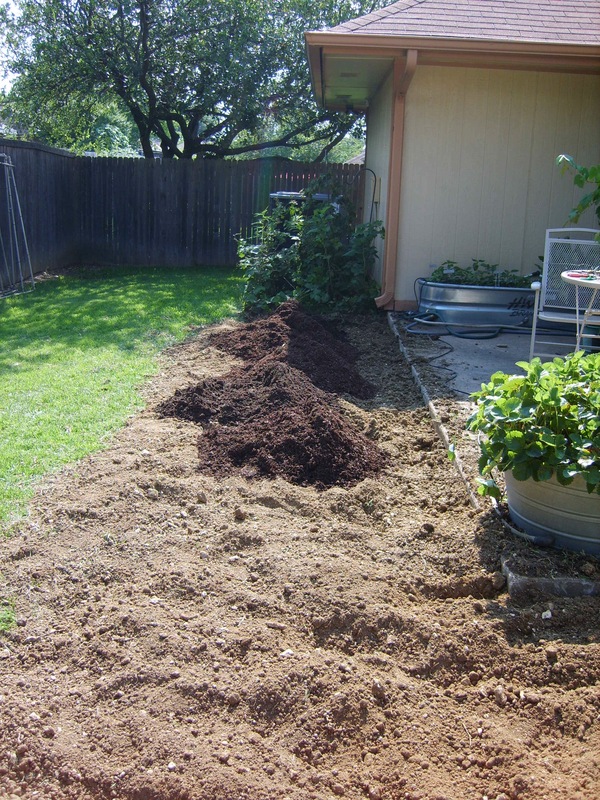 Raised beds are good if you have bad soil and don’t want to have to amend what you already have, but you will have to fill those beds with soil and compost, and the cost of that can add up. 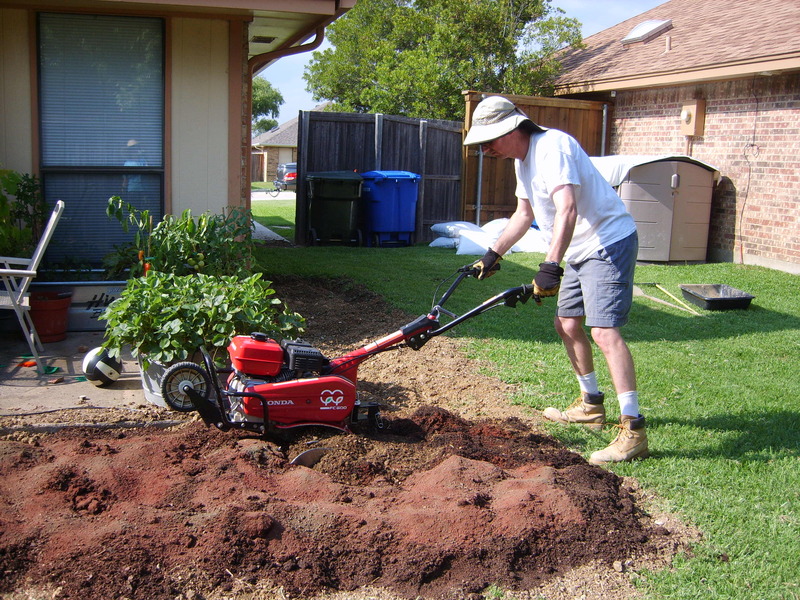 In-ground let you use a lot of what you already have and don’t require as much water as containers or raised beds, but do require a lot of labor to break up the existing soil and get it ready for planting. Each one has it’s benefits – it’s really up to you to decide which will work best for you based on space, money, and time. When I was taking my first baby steps into gardening, I started with containers. Mostly standard pots at first, then I added a large tubs and a couple of sheep troughs. I learned a lot from this small garden and got some tasty produce, but my ambition grew and soon that patio space was just not enough for all the things I dreamed of planting. No question about it, I needed to expand. The main problem I faced was that I have a tiny backyard, and most of it is graded for drainage…so not suitable for a garden. Hmmm….what to do? The only part of the yard that wasn’t part of the drainage slope was the 5 foot space directly around the patio. Perfect! Now what? I decided I wanted an in-ground garden – building raised beds around the patio would have hemmed me in a little too much, and while raised beds allow for a longer growing season since they warm sooner than in-ground gardens, they also require more water during the hot months to keep them from drying out. Unfortunately, my yard soil was atrocious (almost entirely clay) and would need some serious amending to make it usable for the garden. Time for the fun, and the hard work to begin. After a bunch of online research and talks with area nurseries, I decided I would amend my gross clay soil with compost (lots of compost), lava sand, Texas Greensand, and regular sand. 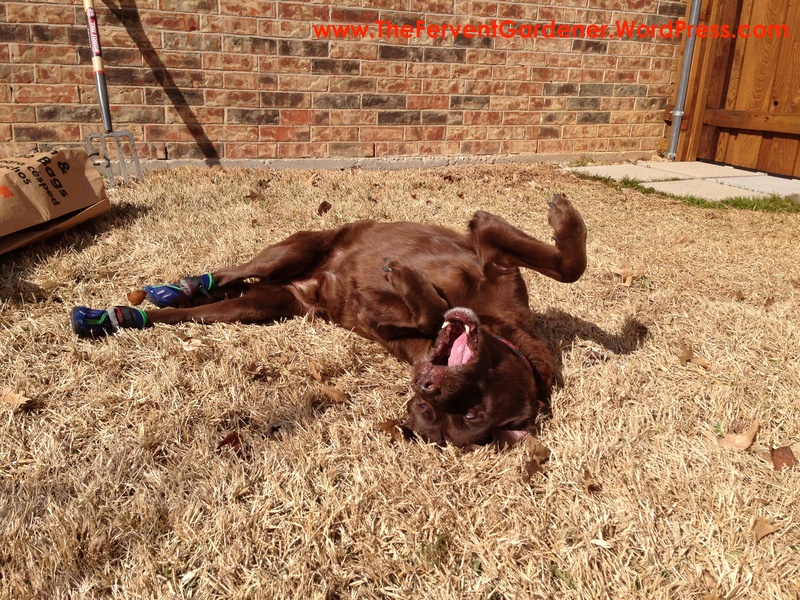 A note about compost – I am not a fan of manure based compost. I know a lot of people swear by it, but since it is made from livestock animal manure, if it is not cured properly for any reason, it can carry things like E. coli. Most of it is probably completely safe, but since I want to eat the food from my garden, it is a risk I am unwilling to take. 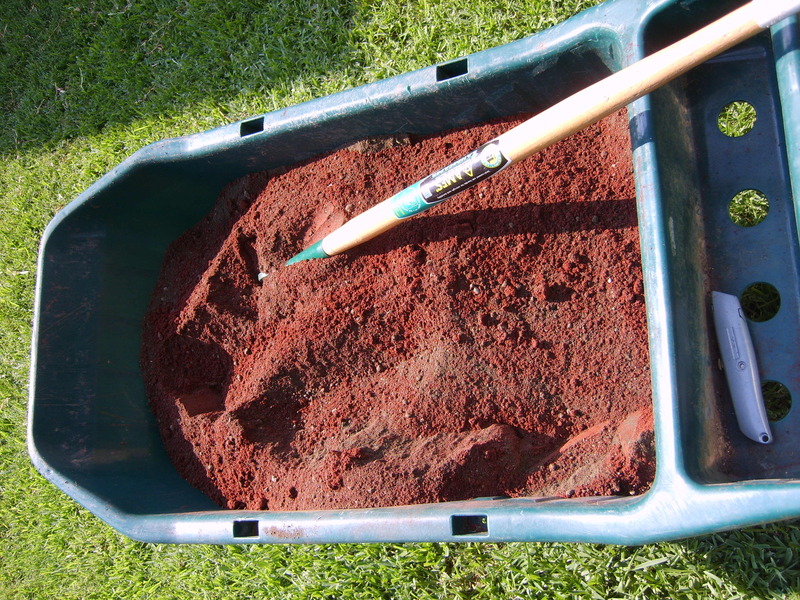 As for the other amendments; the lava and Texas Greensand add nutrients and minerals that my plants will love, and the regular sand helps to further break up the dense clay of my original soil. If your soil is not as clay based to begin with, the regular sand it probably not needed. We needed to rent a small trailer to gather up the bags and bags and bags of amendments. Little trailer piled full of garden goodness. And then pile it all in the backyard. 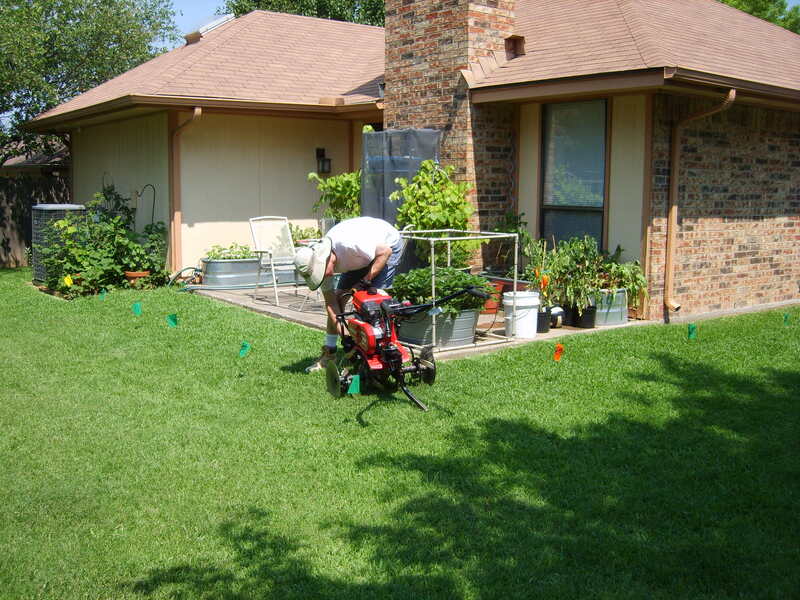 We marked off the perimeter of the garden, and Todd brought out the rented tiller. Todd getting ready to start the tilling process. It took a long time and a lot of blisters to till up the hard clay soil. Luckily, Todd is a determined man and doesn’t give up easily. Once the clay had been thoroughly broken up, it was time to start mixing in the amendments. We decided to do it in stages to be sure the whole garden received enough of each amendment. 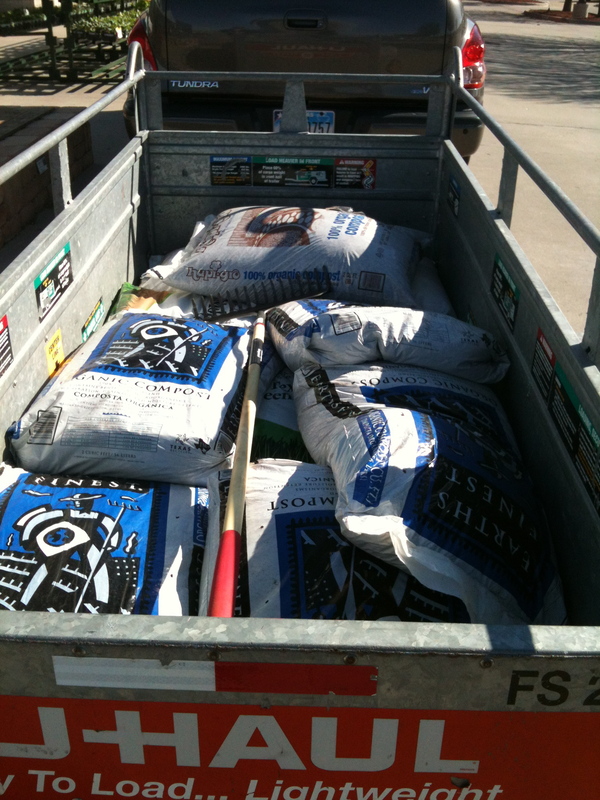 First up was the compost…lots and lots of compost. We dumped the bags in the center, then I spread it over the surface with my hoe, then Todd came through with the tiller. Next up: lava sand and Texas Greensand. I mixed them both together before tilling them in to the garden. The lava sand and Texas Greensand made such a pretty color. Tilling in the lava sand and Texas Greensand. Finally, with all the amendments tilled in, my new garden soil is something my plants will find delicious. Good dirt for growing happy plants. 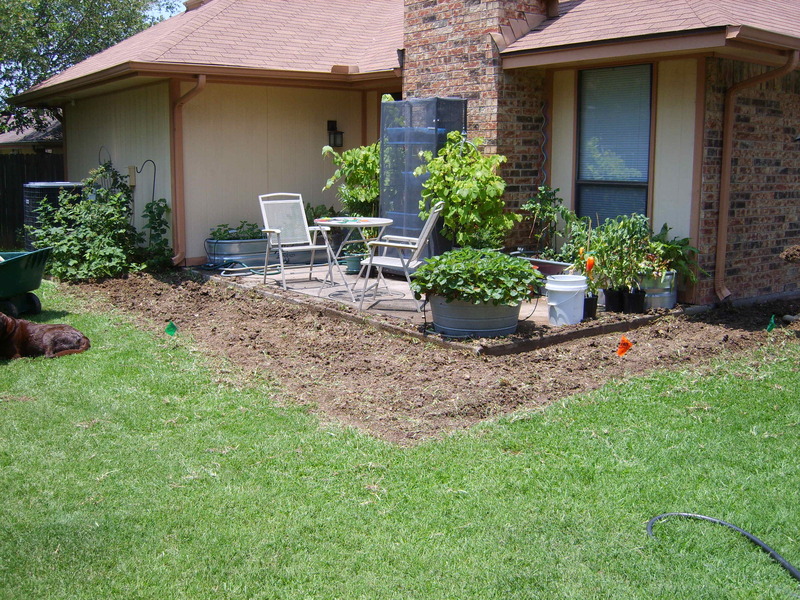 With my busy schedule, we knew that if we didn’t put in a good watering system, my poor garden would perish in the Texas heat when I became too busy to water it every day. Todd, the man who can do just about anything, came up with a plan to supply my garden with water. 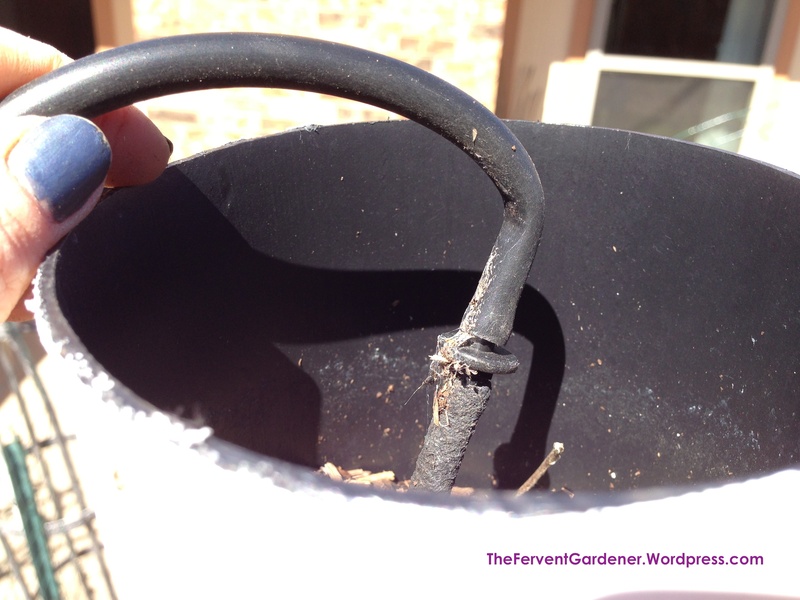 Unfortunately, I can’t go into detail about the particulars of this part of the garden because it was Todd’s brainchild and involves a lot of plumbing…I try to avoid all things plumbing. 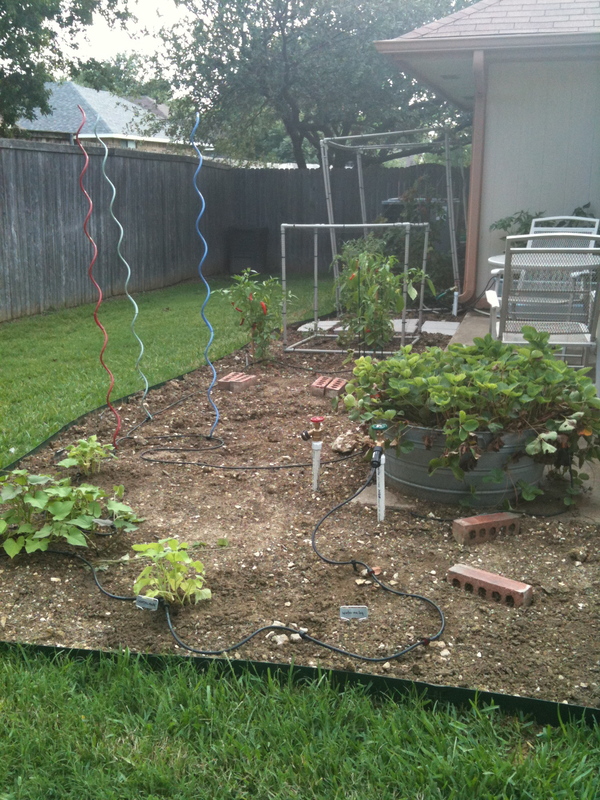 Basically, we put a sprinkler type system in the garden itself – the green valves run on a sprinkler timer and the red valves always have water available – there are three of each in the garden. 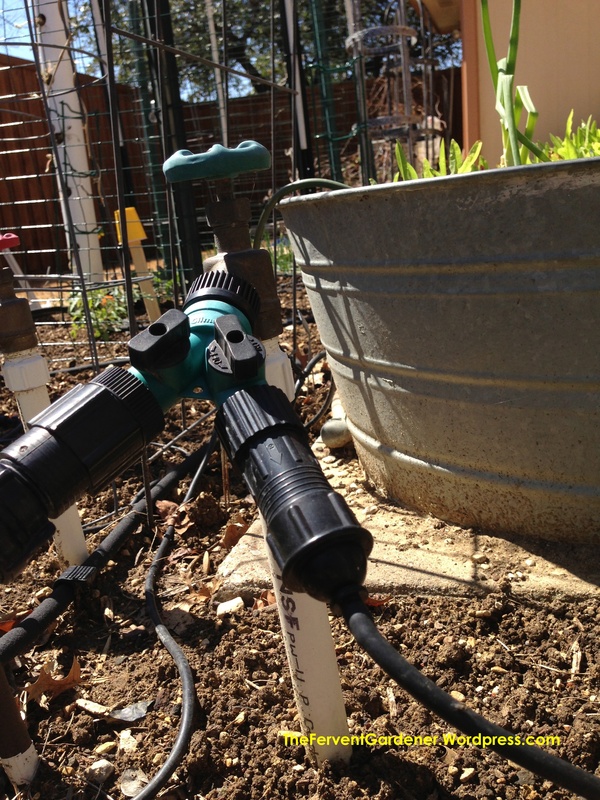 From the green valves I run small hoses to each plant with small emitters – since they run on a timer, I can decide how much water the garden needs and what time of day is best and can easily change it as the weather heats up in the dead of Summer. As for the red valves, I can hook regular hoses to those for any other water needs I have in the yard. Putting in the watering system. Valves at the corner and at each end. With good dirt and plenty of water, my garden quickly thrived. My garden growing like crazy! 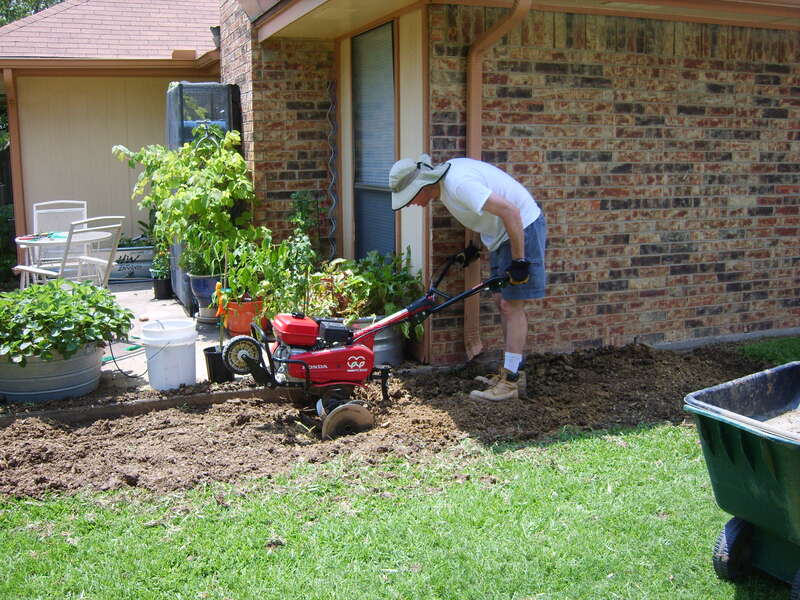 I know it seems like a lot of work – and, boy howdy, it was – but if you are interested in having a garden, all that labor is totally worth it. Eating your own strawberries, lettuce, peppers, tomatoes, etc…there is nothing like it. So even though it is still chilly outside, start making your plan and gathering your supplies. Before you know it, the weather will warm it will be time to get some tasty things growing! It’s Time to Plant for Fall! 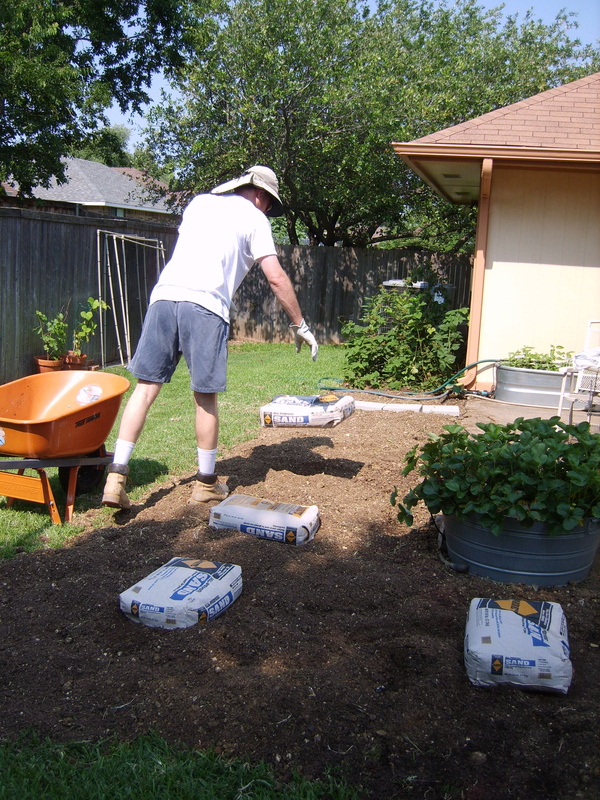 This is a gardening alert: It is time to be planting that Fall garden you’ve been thinking about – at least if you live in North Texas, like I do. I know it’s still hot, but gear up and get out there. 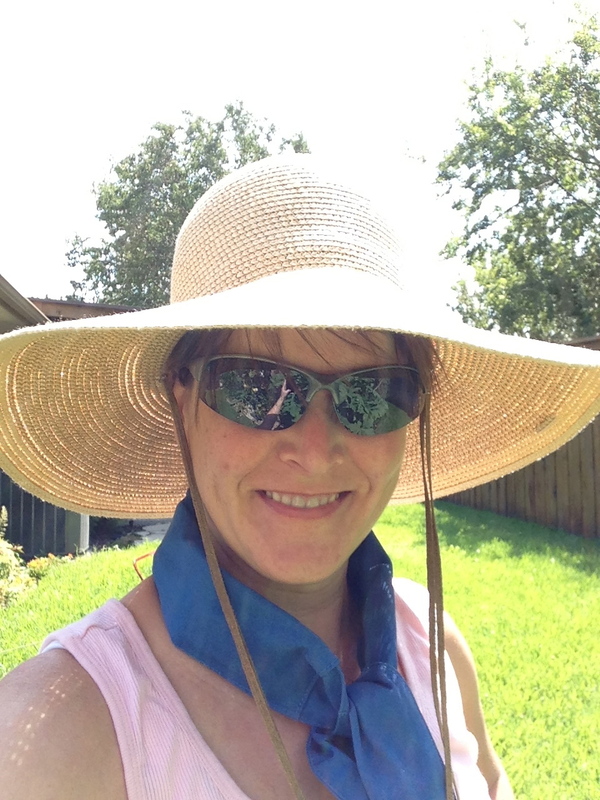 Grab your hat, sunglasses, and cooling neck band, and get out there! Here in Texas we have a nice long Fall growing season, starting in late August and going until the first freeze – usually sometime in December. And since we start out good and warm in that time window, we aren’t limited to just cool weather plants. 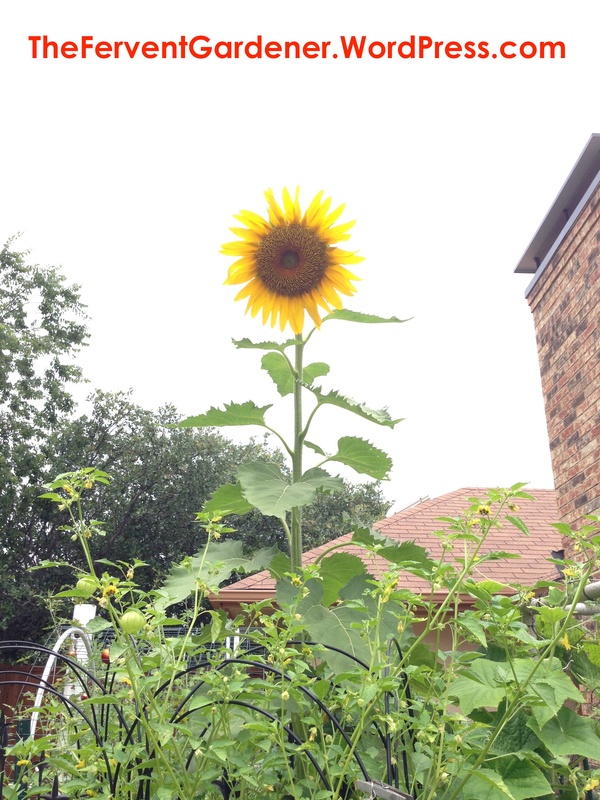 Fact is, you can grow just about anything in the Fall in Texas, as long as you get it growing soon enough for it to mature to harvest before it is killed off by a hard freeze. The good news is that there are lots of plants that mature quickly enough for that and lots that are cold hardy enough to handle a few light freezes – unfortunately, there isn’t a ton of cross over between the two lists. Now, the other important part of the equation as you choose what to plant for the Fall, is which things are the most frost tolerant and which aren’t. By comparing the two list, you can see things like Kale grow fast and hold up well to the frost…so if you like Kale it’s a great Fall choice. But Eggplant takes a long time to mature, and is not frost tolerant, so might be a bit of a gamble in the Fall. Another thing to keep in mind, is that here in North Texas we get a few very short dips to freezing in the first part of Winter – and usually don’t get long hard freezes until after New Year. Those plants that aren’t frost tolerant may die during that dip, even though temps after that climb back up and the plant would have been fine. That means that if you can keep your frost susceptible plants warm for those tiny dips in the first part of the Winter, you can sometimes keep them alive and producing for a little longer. You can use frost blankets and cloches, or, you can try what I did last year, Christmas lights – the old school ones that get warm, not the new LED ones. I draped them all around my delicate plants and they came through those short dips to freezing just fine. 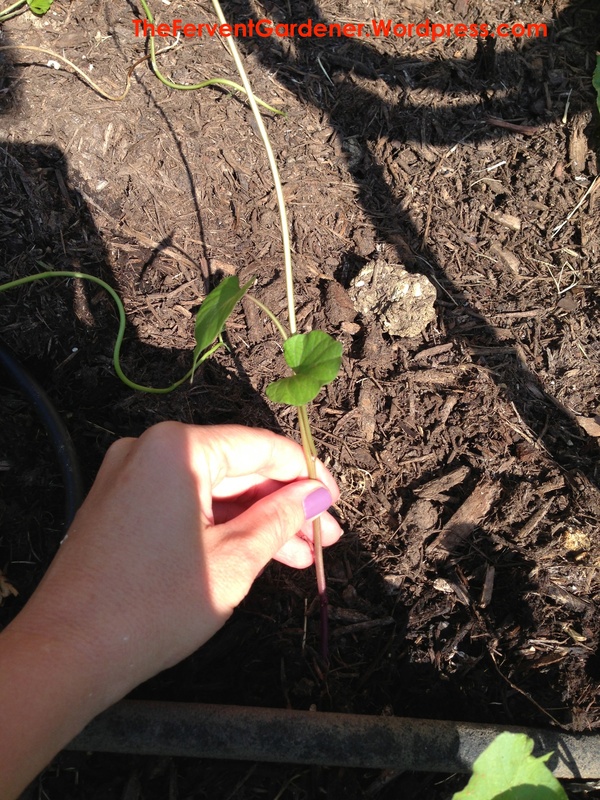 Whatever you decide to plant, it’s time to do it now…so stop reading my blog and get to it! I am a passionate gardener who is always looking for new ways to use my small space creatively to get the most out of what I have to work with. 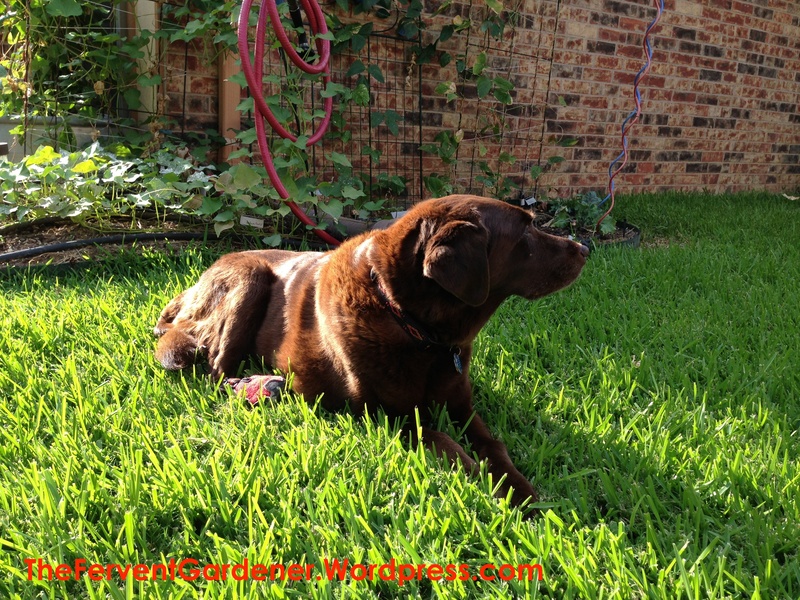 I am almost always joined in my garden by my big brown dog who keeps a watchful eye out for any squirrels that might want my produce.